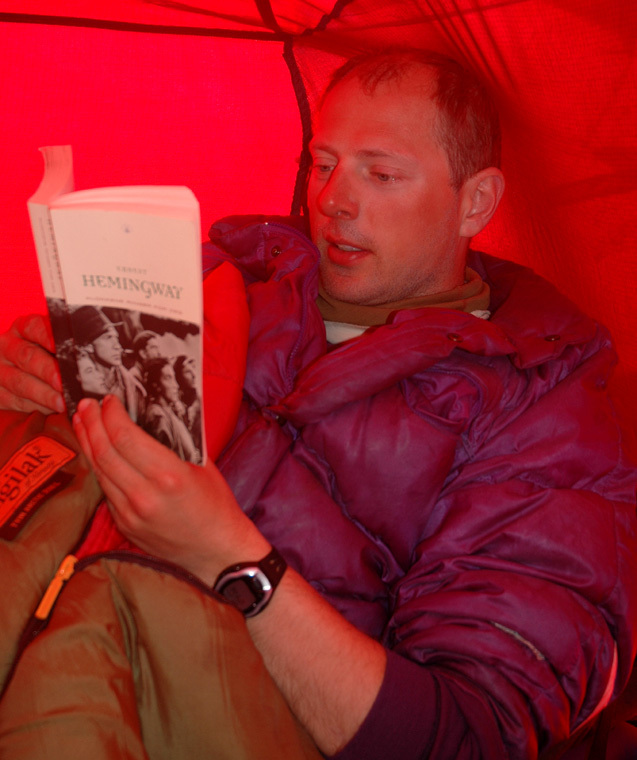 The following diary was written in the tent as the expedition took place. A few sentences that just carry references to pictures have been added after returning. A lot of planning and uncountable hours communicating by email or by the phone has come to an end. My visit to the Danish Polar Library, my communication with The Danish Polar Center, permits, radio licence, insurance, and a number of other details, it is all history. We are on the way, 6 boys from Bergen, Jan-Frode, Torstein, Per Ove, Ståle, Arnt and myself. I am the only one that has been there before, they have paid a lot of money, will this live up to their expectations? Only the days to come will show. Our flight left Flesland, Bergen at 1200, noon, everybody showed up at 1100 as agreed, except Ståle. Where is he? After getting increasingly worried, he showed at 1130, just in time as one says. I already made friends with the young lady at checkin, telling her that ours was an expedition to Greenland, possible extra luggage/weight should therefore not be an issue. The strategy worked, she was even a bit disappointed and exclaimed: "Is this all?" when we finished checking 15 heavy pieces of luggage. Our flight was delayed, just enough to make the transfer in Copenhagen a rush. Our flight to Iceland was boarding as we reached the gate. What about all our gear? Copehagen airport has pulled miracles before, today was no exception. The friendly Danish ground crew invited me down on the tarmac to see that indeed all our checked luggage made it safely across from the Bergen flight to the Icelandic airplane that would carry us to Iceland. Needless to say, it is critical that we do not loose luggage on the way to Iceland. Arrival in Keflavik after 1530, local time. This will indeed be another close call. Our flight to Isafjordur leaves at 1630 from the Reykjavik local airport, this airport is 50 kilometer from Keflavik! The boys are waiting for the luggage while I run out and locate the taxi that Fridrik has booked for us. Then a call to Fridrik, can the flight to Isafjordur wait? Then rush back through customs in reverse, this called for some polite smalltalk with the local head of customs, strictly against regulations, but since this is a Greenland expedition.. Long at last, there is the luggage, however the time is passed 1600 when everything is loaded in the taxi. This taxi could have been larger. An extremely overloaded van with the 6 person G4-team, skis and 15 large pieces of luggage. Ready to go, then a clear voice: "Jan-Frode, where is he?" We are missing a man! I run back into the terminal building and quickly locate Jan-Frode, back into the car and we drive off, - fast. Fridrik calls back and say they will hold the plane, but we better hurry. Our driver does his best, we are overtaking a bus, slowly. It seems like we could talk to every passenger in the bus before we finally succeed. Our van is overloaded and barely able to go about 100 km an hour. The time is now 1630 and we are nowhere close to the airport. In fact, we are stuck in traffic, rush hour in Reykjavik, never heard of it, but indeed there is no question about it. Violent ringing in the cell phone of our driver, where are you? Heavy traffic is our answer, about 15 minutes later and the traffic is moving better, but we are still a bit from the airport. More RING RING RING in the phone, YES, YES, YES, almost there.. Finally, we are there, fifteen pieces of luggage, people are stressed, we get our boarding pass, but there is a bit confusion. Nobody is able to keep track of the luggage. Arnt expresses deep concern for his bag, where is it, has anybody seen it, etc. We get on board. The plane is filled to near capacity of 30-40 impatient passengers. They have already been delayed significantly. We are airborne, the Captain offers his apologies for the delay, only in Icelandic. We recognize a story about some Norwegians headed to Greenland as the primary cause of delay, the other passngers were not amused. The approach to Isafjordur airport is interesting. The airplane must fly straight towards a ridge from a nearby mountain, pretty close for being a big commercial craft, then bank sharply left and subsequently touch down on one of the lesser known airports of the world. The taxi to Aslaugar guesthouse cost 3000, after checking in we quickly located the only pizza place in town. Lamb and beer, I quickly ran out of my first 20.000 Icelandic crowns and paid another visit to the ATM in order to cover the bill. Tomorrow is a critical day, we must have weather for the flight to Greenland. The Tromsø group, lead by Espen Nordahl, that is heading the same way has been stuck here for five days, they finally flew out yesterday. I buy food for tomorrow's breakfast, then sleep. We get up around 0700, breakfast then getting organized for the flight. I call Fridrik at 0930. He had no report from Espen, (he had hoped to get the local weather from the Tromsø team), but satelite pictures and the general forecast promised acceptable weather. We have a go for the flight! We can expect the Twin Otter from Akureyri around 1100. We shall be ready by then at the airport. There will be one or two flights depending on a decision by the captain. Our advance cargo, two big boxes, are in the hangar. They must be opened and repacked. The hangar is open and we start working. 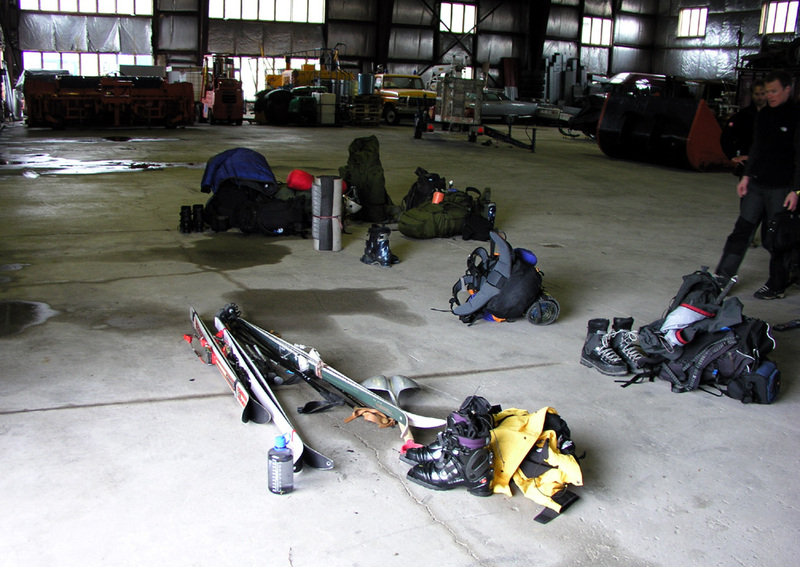 An employee of the airport comes by and asks us to work inside the hangar. The enormous hangar door has collapsed twice already, he informs. We quickly follow his advice, to have the entire team wiped out in a hangar door avalanche would not be good. 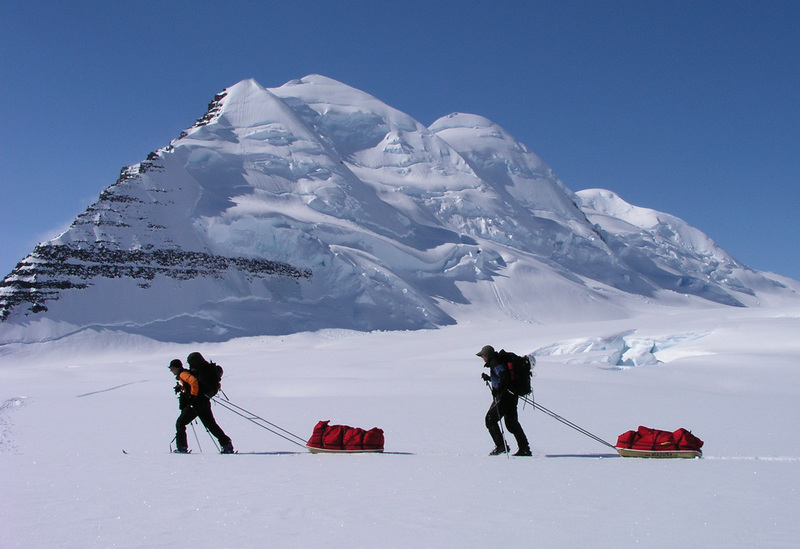 We prepare for two flights as the maximum payload to Gunnbjørnfjeld base camp is 700 kg. 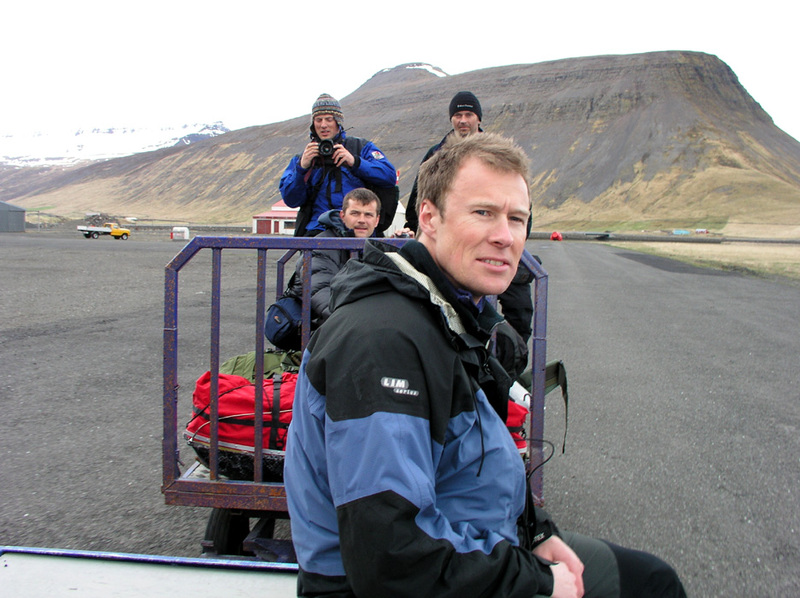 Torstein, Jan-Frode and I shall go on the first flight, the other three on a second flight. 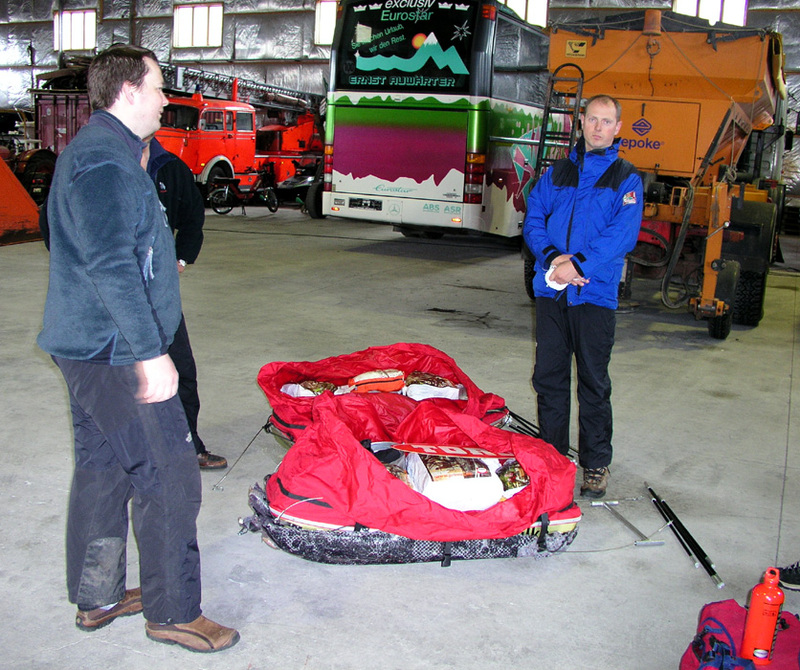 The gear must be distributed such that we can operate independently for several days in case of different landing sites combined with bad weather. We are indeed quite busy and anxious to know before the plane arrives. The Twin arrives at 1115. The captain, same guy that picked us up in Queen Lousie Land in 2000, says he will take everything in one go. That is 800 kg payload. Well he certainly knows his way, more than 20 years of wilderness flying in East Greenland. When he picked us up in 2000, we had fog forming a very low cloud cover. 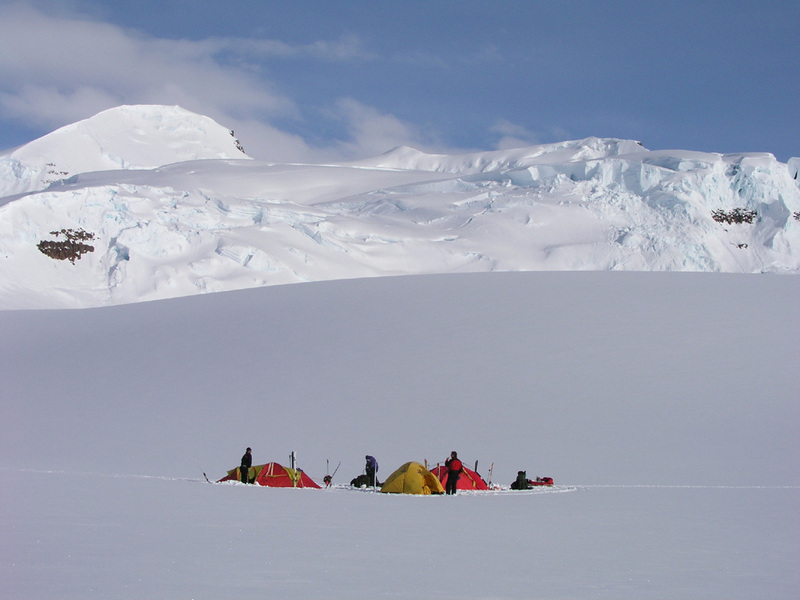 He flew far inland above the main icecap, located a hole in the clouds, landed, then skied the Twin all the way back to our camp for a successful pickup. The flight turned just as spectacular as previous flights. 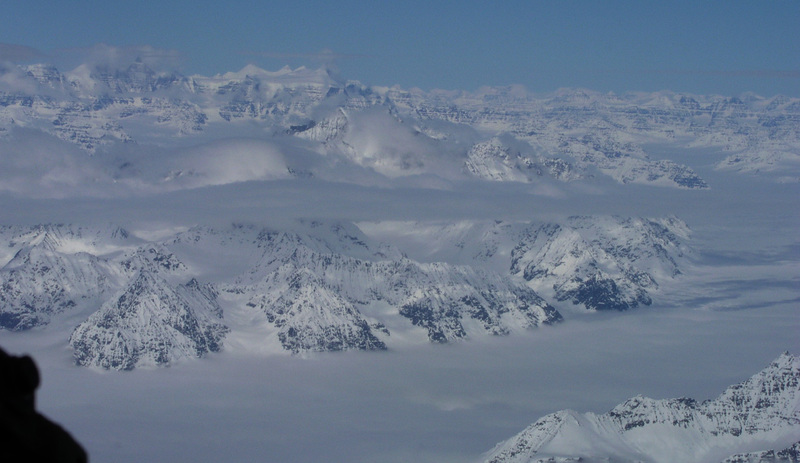 Only 1:45 flying time above a pretty dense cloud cover until we reach the coast, but then just perfect weather with peaks and glaciers as far as one can see in all directions. 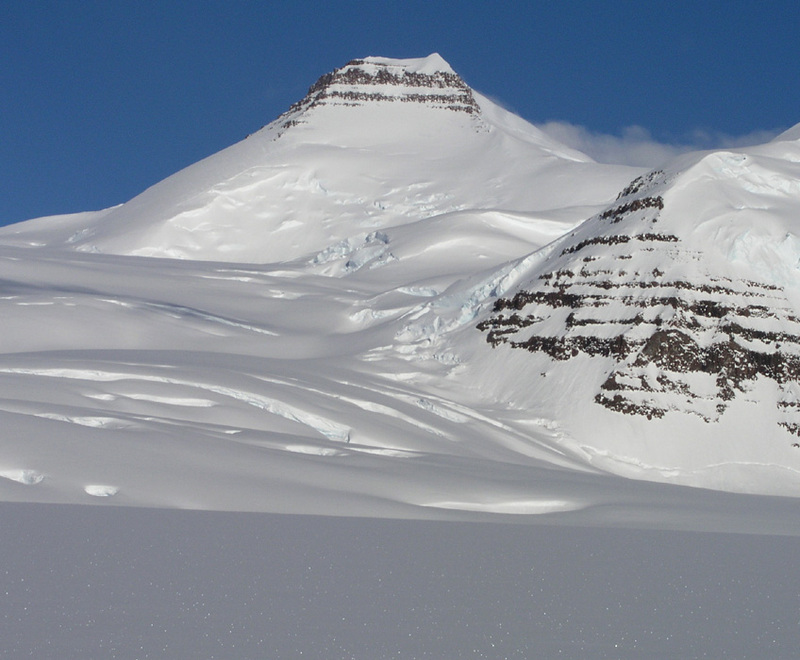 Shortly before getting into the Watkins, we catch a good view of Ejnar Mikkelsens Fjeld a very huge and impressive mountain slightly to the north-east of the Watkins range. We touch down at Gunnbjørnfjeld near the base camp of the Tromsø team, at 1315 in fantastic weather and a full, half meter of superdry powder. A softer landing is difficult to imagine. We quickly unload the plane and shoot some pictures of the team in front of the Twin for sponsor purposes. What a scenery that unfolds in front of us, a long glacier leading up to Gunnbjørnfjeld, the Tromsø team has made a single ski track that way. Further left, first an impressive ridge, then in the distance an even bigger ridge. 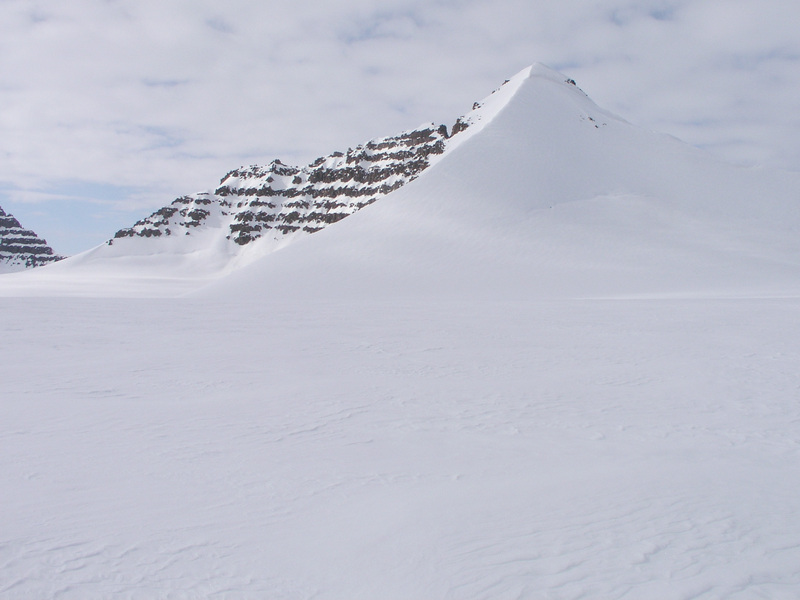 This impressive ridge leads up to the second biggest mountain in the Arctic, Dome, but the peak is not visible from our location. 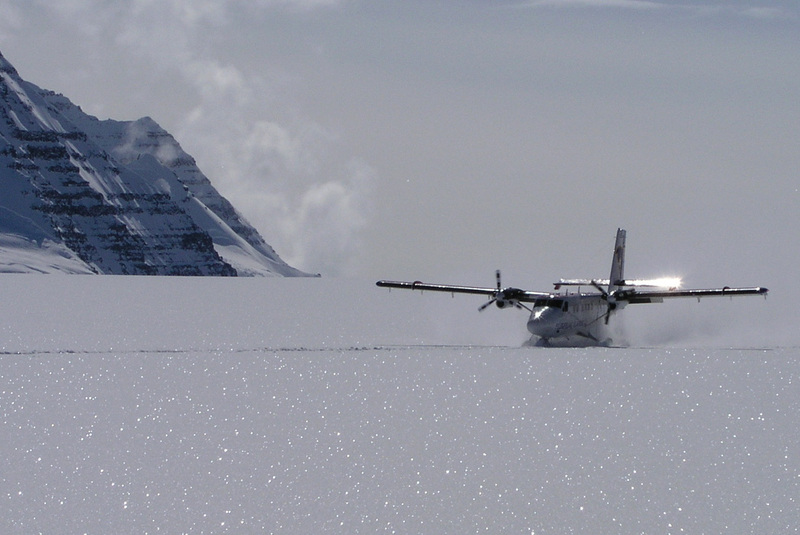 The Twin Otter is actually a bit stuck in the deep powder, the first attempt at moving is unsuccessful despite a roar from the engines and a local snowstorm behind the plane. The captain jumps out with his big rubber hammer, this is not a first and the remedy is known. A few blows to the skis in order to shake things a bit loose, then a second try. This time the airplane shivers, engines thundering and the bird moves, first slowly, then around and across to the tracks from the landing. With a roar the Otter is airborne and gains altitude, turns between us and Gunnbjørnsfjeld, waves goodbye with its wings and vanish in the distance. Silence, landscape, Greenland, we are ready to start our 16 days in this arctic wonderland. 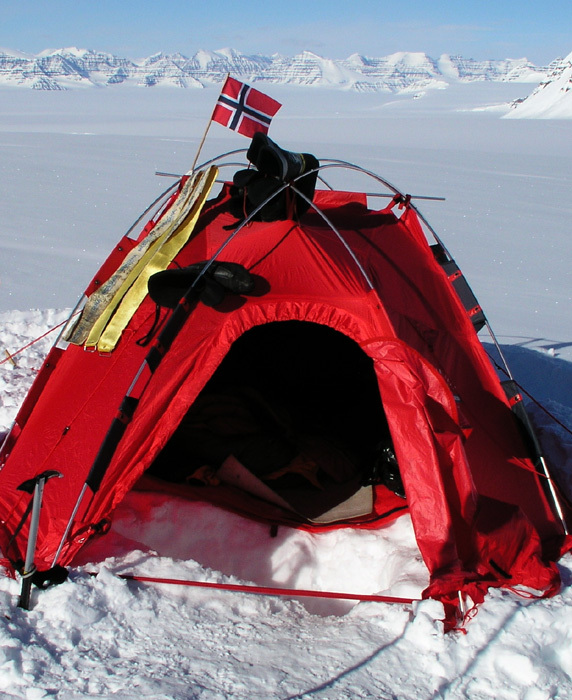 We establish camp about 500 meter in the direction of Gunnbjørnsfjeld. We do not want to be very close to the group from Tromsø. Our trips are totally uncorrelated, it is just by chance that two teams from Norway are here at the same time. They shall have their trip, we shall have ours. 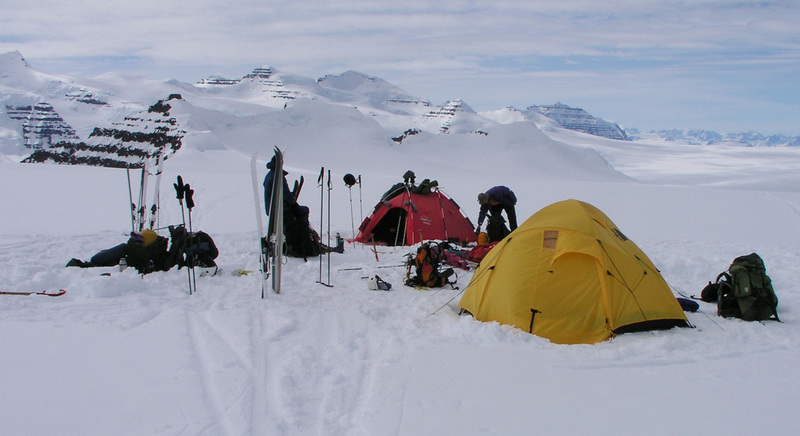 Our base camp is slightly uphill and commands a very nice view across the broad valley with the peaks and glaciers that separate this area from the area of the Woolley Glacier. The location is north 68:55.511, west 29:44.219, elevation 2229 meter. 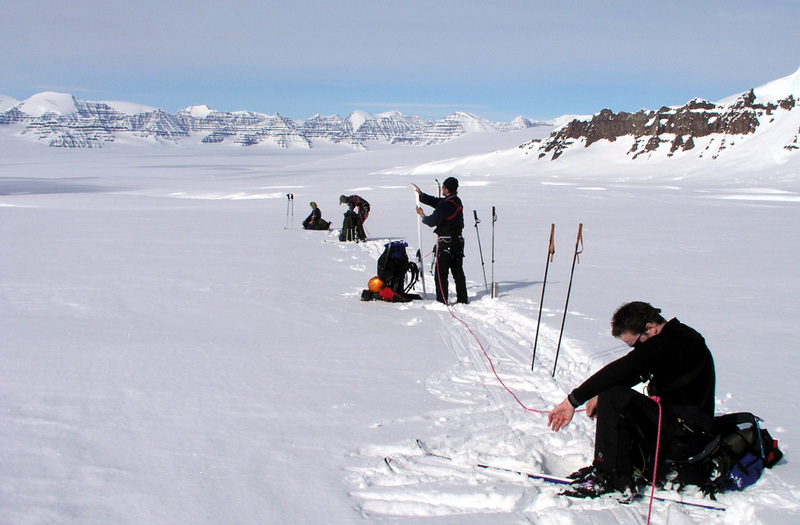 The Tromsø team is making a track towards Gunnbjørnsfjeld. 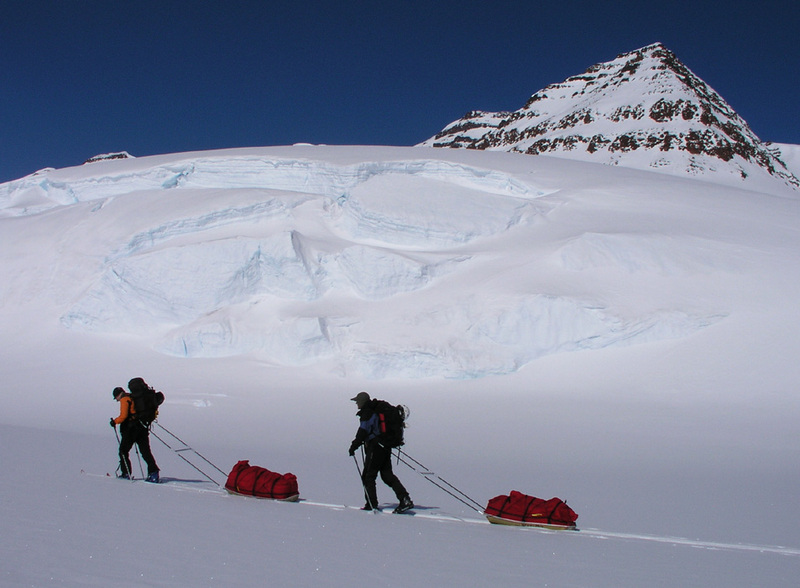 When our camp is ready we ski a bit uphill along their tracks. The landscape is very nice, Gunnbjørnsfjeld is a bit closer, but we realize that the approach to the saddle is quite a long trip. We have a good view of the ridge that heads up on our left side. We turn around at 2600 meter, about 1.5 hour after starting out. The view back down and across shows that we have gained some elevation. The Tromsø team overtakes us on the way down, they reached a bit more than 3000 meter. It is hard work to break trail with all this new powder. Dinner is served at 2100. First unpleasant surprise, one of our stoves had a leak in the gas tube rendering it useless. No way to repair. 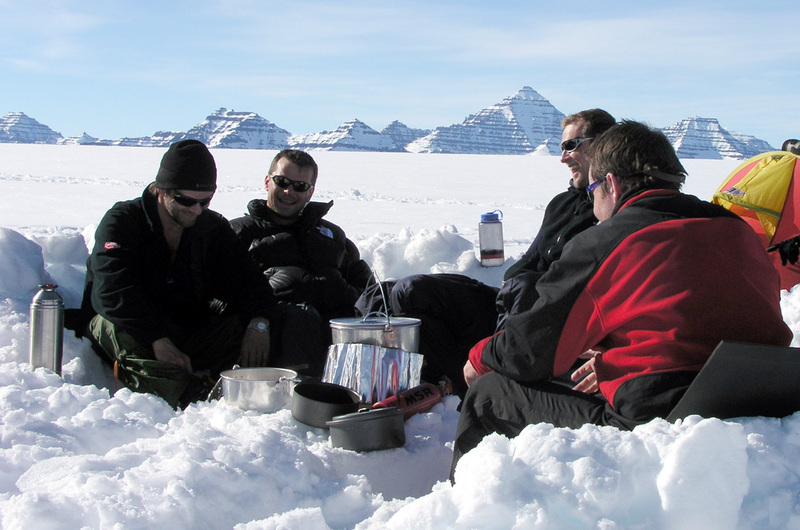 We carried a spare stove, but I disliked the fact that it was called to duty already on our first day in Greenland. We have two stoves that function well, this is minimum for a three tent team like ours. Soon, the temperature is noticeably colder, we finish the meal and as the sun sets around 2200, the cold will chase us into the tents and sleepingbags. The sunset really cooled us, the temperature fell to around minus 30 Centigrade at night. 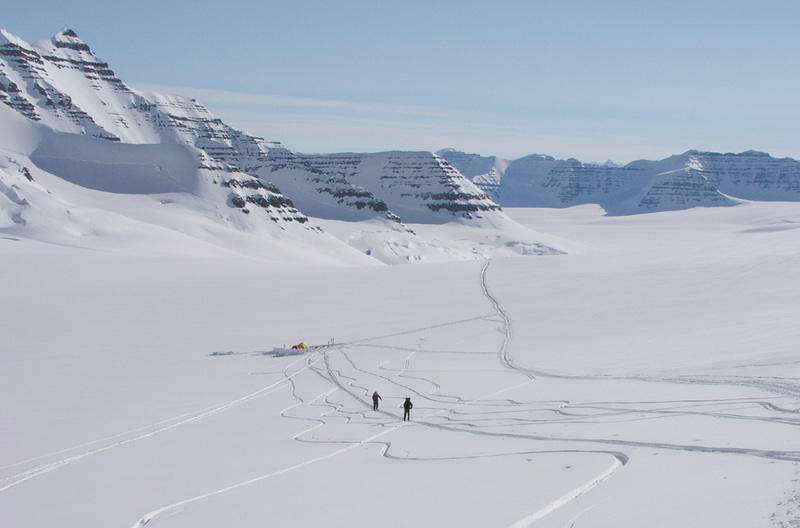 The Tromsø team announced on their WEB page that they wanted to be the first ever to ski down from Gunnbjørnsfjeld. 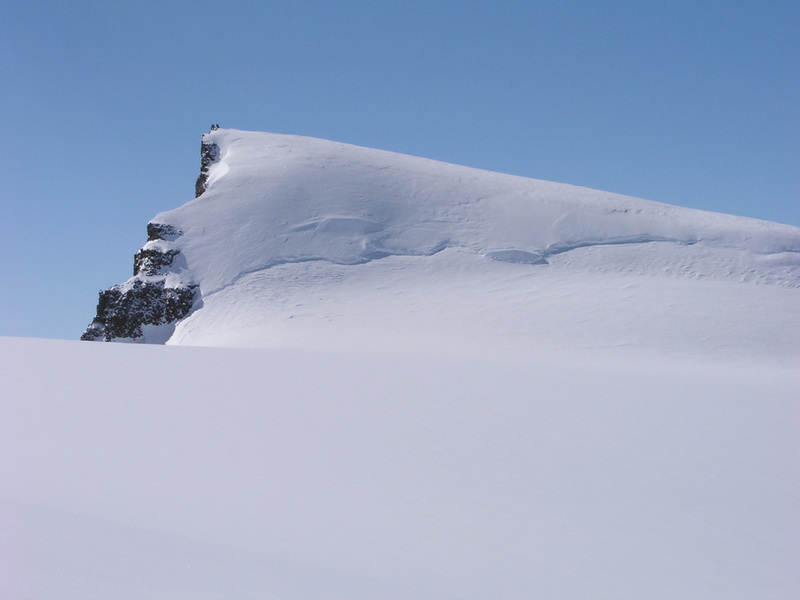 Long before we knew about the Tromsø plans I had also told my group about the fact that Gunnbjørnsfjeld was still waiting for its first ski descent. I knew that we most likely had the skill to do it, but these things do happen. Just as we were looking forward to trying this, the Tromsø team appeared and their schedule was one week ahead of ours. 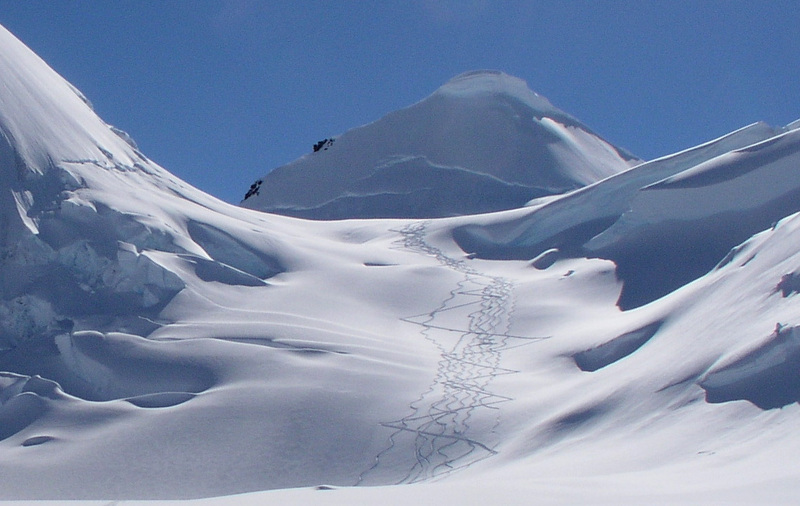 It was clear that we would not take advantage of their hard work at breaking trail in order to gain the summit and a possible first ski descent ahead of them. 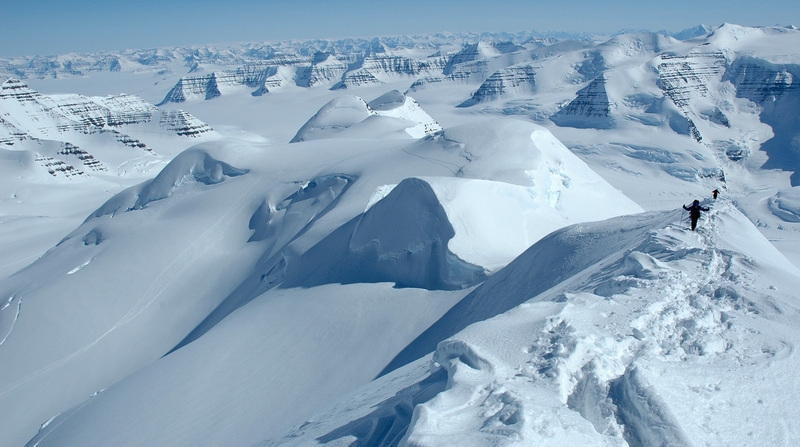 Most likely, they would ski over to Dome and Cone after ascending Gunnbjørnsfjeld. It therefore made sense that we should use the day breaking a trail across to that area. This would then serve both teams later. We left camp at 1000. The temperature was still negative 20 Celcius several hours after sunrise. 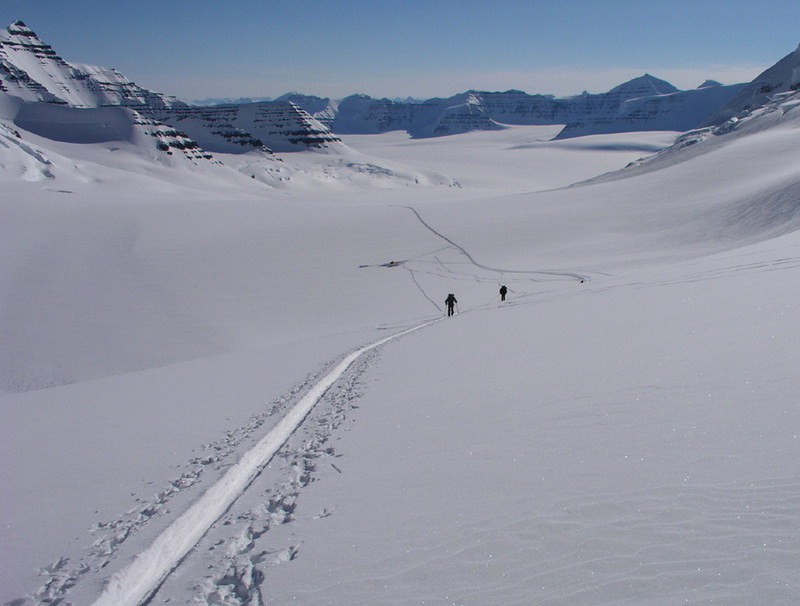 Before climbing the glacier that gives access to Dome and Cone, we had to ski eastward on the main glacier. 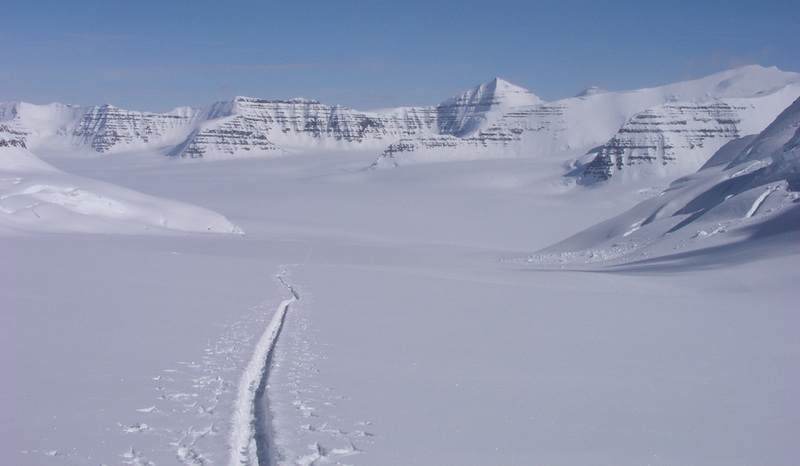 The landscape runs straight out towards a gigantic icefall called "Mange Sprekker" (Lots of Crevasses!). We have the mountains that contain PEV, the 4th. highest peak on our left, while very jagged and sharp ridges form the backdrop beyond the gigantic rigde that comes down from Dome. Jan-Frode turned back fairly early in order not to exhaust himself today. We broke trail to 1400 having reached 2721 meter in the valley that heads up between Dome and Cone. 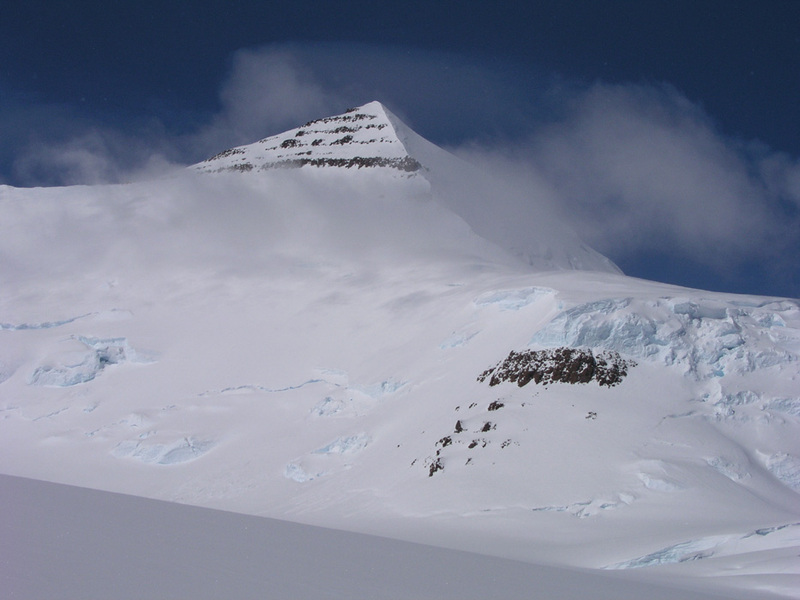 The view on our left (Dome) side is spectacular, while a distinct pyramid shaped peak is guarding Cone a bit further in on our right hand side. We get back to Base Camp after this first day of work. The team is doing well on this first full day in Greenland, Jan-Frode needs to improve endurance, with the program we have in the next several days this is bound to happen. Arnt complains a little, partly this may relate to a first day in the 2200-2700 meter range. Again, I feel pretty confident that his discomfort will go away. The tents are quite comfortable and the weather is great. Tomorrow, we shall start out early in the track that hopefully shall lead us to the summit of Hvitserk. May 17. Norway's National Day. May 17th. and what a day this should turn out to be! I had estimated that we would take 7.5 hours to the summit, I wanted to be there when we had maximum heat a few hours after mid-day. We ran Greenwich (= Iceland) time, thus a bit ahead of sun time. We prepared a bit before going to bed, water was melted and ready for the next morning. We had general wakeup at 0500. Departure time was set to 0700, with such cold weather it always takes time from wakeup to departure. 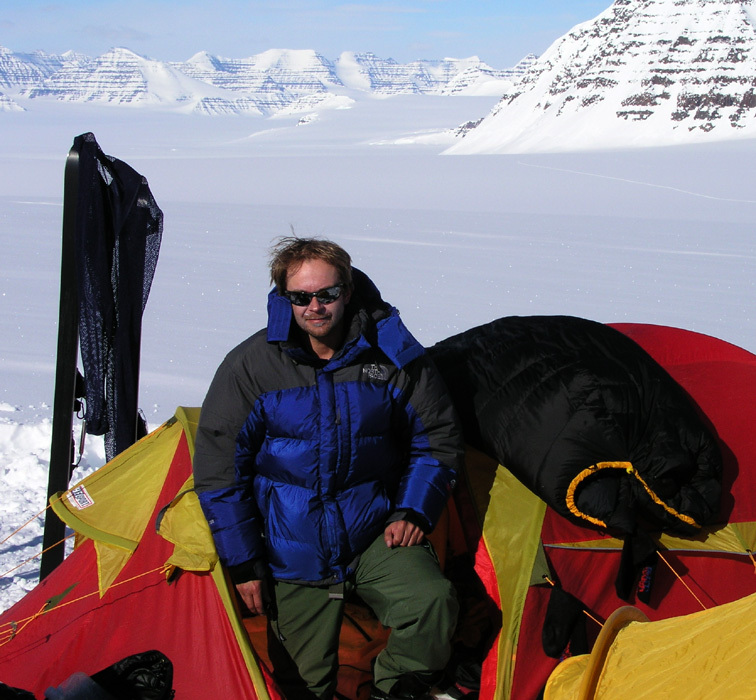 Jan-Frode started up the glacier at 0630, and Arnt followed at 0645. I left at 0700 with the three others leaving just 5 minutes later. What a long hill this is! I caught up with Jan-Frode at elevation 2700m, we kept company further along. Arnt had more or less our pace, but a bit ahead of us. 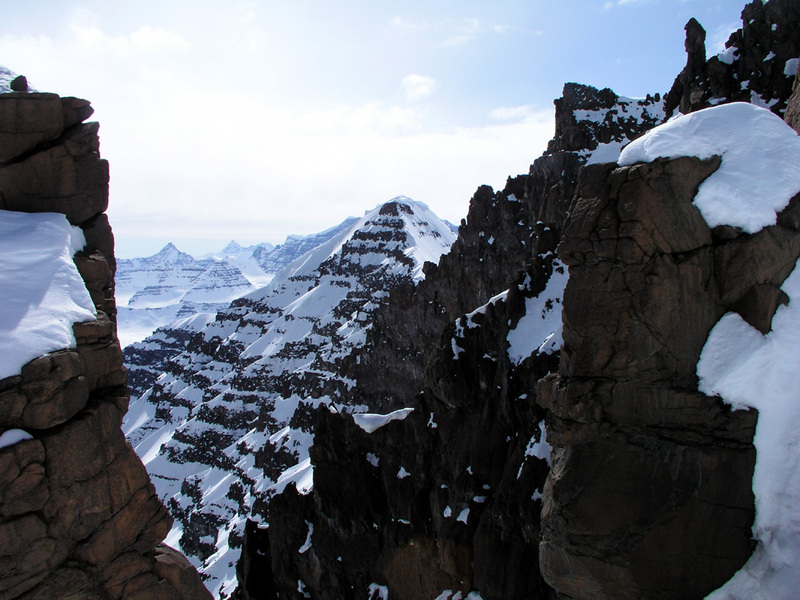 The scenery, fresh cold snow forming sculptures out of mountains, will remain a lasting memory. 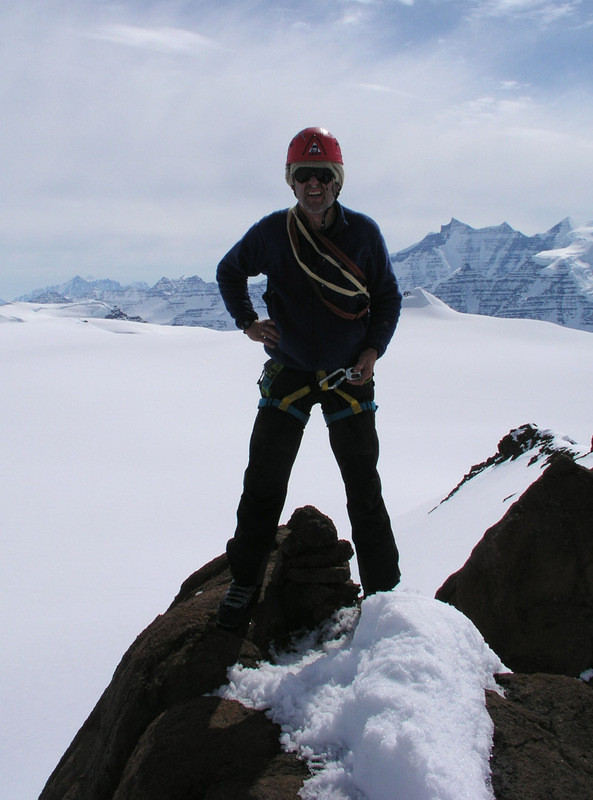 Soon, the three others also caught up and we skied more or less as one group to a small rock outcrop on the ridge proper. We got this far, to the south ridge of Gunnbjørnsfjeld in a bit less than 5 hours. This location was north 68:54.552, west 29:54.836, elevation 3389 meter. It turned out that the Tromsø group (except one team member) had climbed the peak yesterday, however, much later in the day and therefore with severe cold compared to our arrival at the same spot. 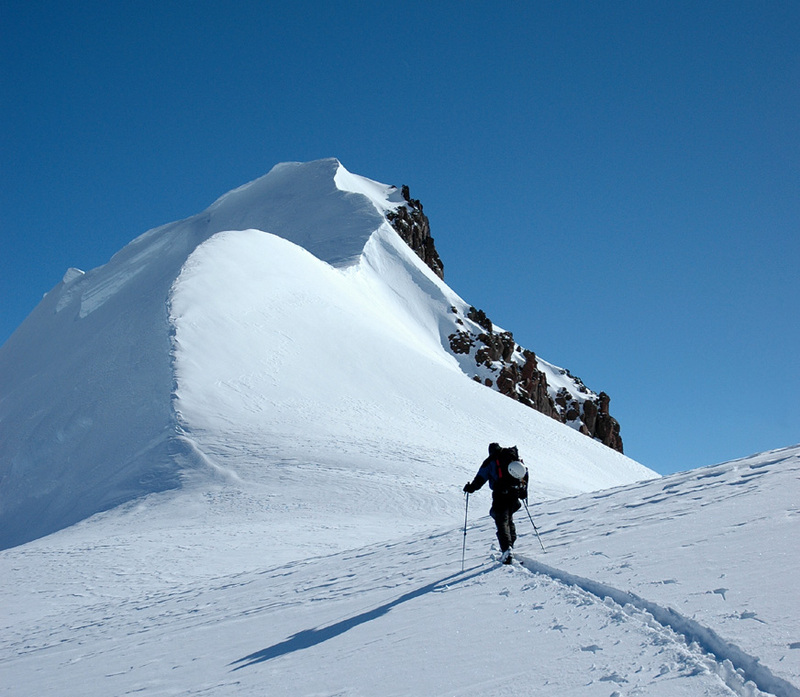 They had not carried skis up the south ridge and thus not skied the peak. 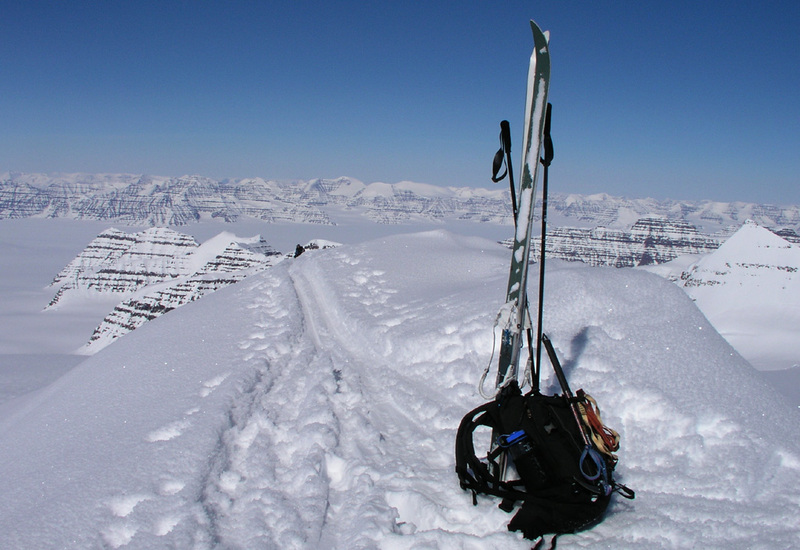 Torstein and Per Ove would carry their skies to the summit and attempt a world first ski descent (Telemark style) from the highest point north of the Arctic Circle. 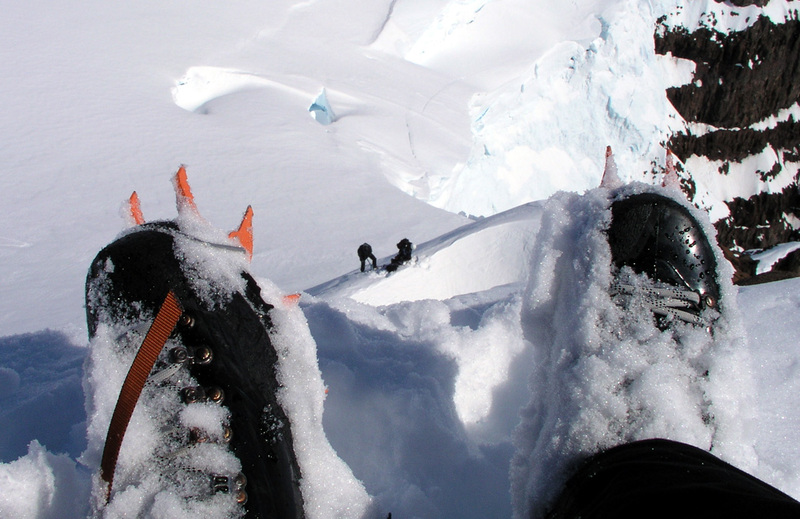 Everybody put on crampons, I changed boots (Scarpa Vega), since my ski boots are kind of soft for crampons. Jan-Frode was quite tired, Ståle felt a bit like throwing up (AMS sympton) and felt a bit weak. Arnt took Dexadron (strong medicine against headache, relieving AMS symptons), then took off like a rocket up the hill in hot pursuit of Torstein. 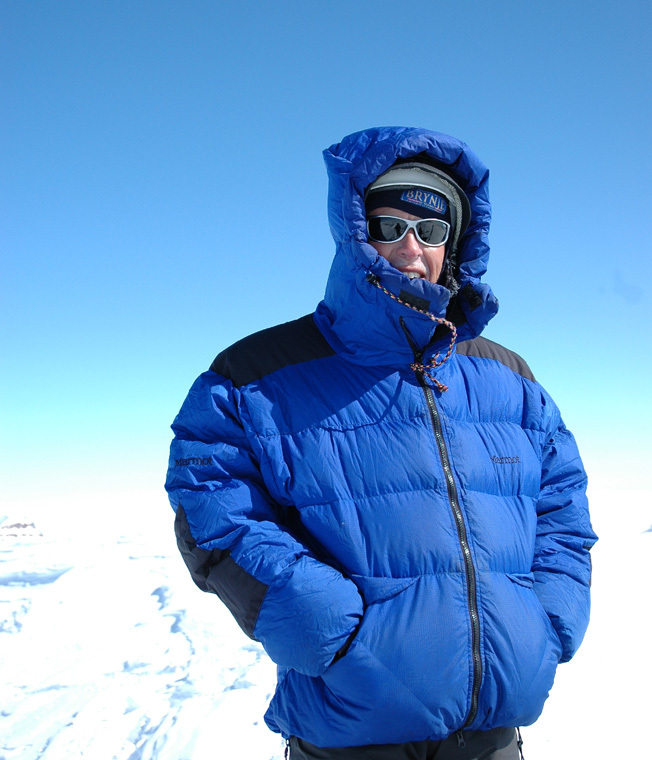 I made the summit about 3 minutes after Arnt, with Per Ove following fairly soon thereafter. FANTASTIC VIEW ! We put down the Norwegian flag that had been brought because of the National Day. Pictures and enthusiastic celebrations of a very perfect summit, there was no wind, the sun was warming, the views spectacular and breathtaking. Our two next goals, Dome and Cone, where striking features in the landscape. These peaks are number two and three with respect to elevation. Arnt felt very miserable due to AMS, poor fellow. Well his joy and celebration would have to come later and gradually when recalling the moment and achievement. He hurried down in order to minimize pain and agony. After considerable more time, we started to see Ståle. Encouraging him along the last few steps, he was visibly happy, but quite exhausted. 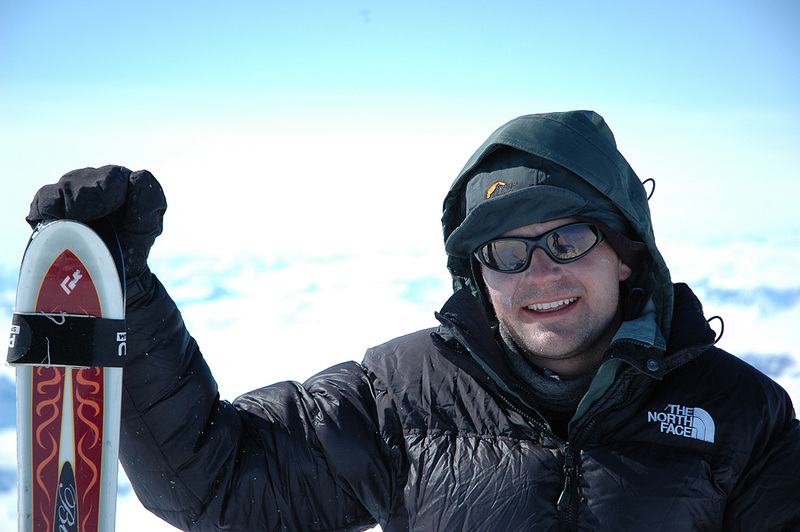 After one hour on the summit, Jan-Frode also showed up, extremely tired but with a broad grin across his smiling face. 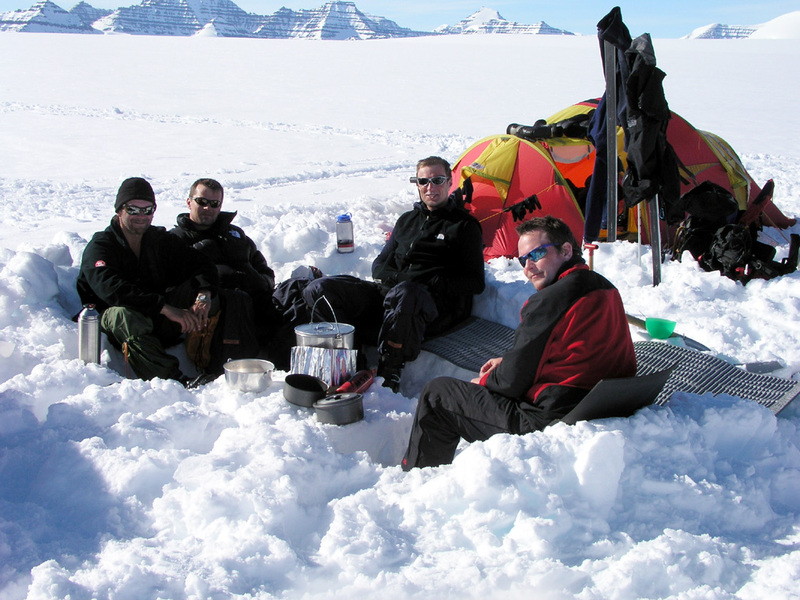 Complete success, the entire team on top of Greenland. No problem to spend an hour up here, warm sun, no wind, much joy. My GPS read north 68:55.170, west 29:53.912, elevation 3695 meter. This is in excellent agreement with an official height of 3694 meter (There may even have been an extra meter of snow on the summit). We took numerous pictures, continued to view the mountain landscape all around, there was absolutely no need to move on. (The panorama pictures are posted under the peak description). Finally, it was time to say goodbye, and start downhill, and what a most memorable descent this was. Torstein and Per Ove skied Telemark in good style from the very summit and back down to the level area of the south ridge. Torstein skied more or less along the ridge, partly quite a steep section, while Per Ove skied a bit more on the west face of the ridge, more exposure below and definitely not a place to risk a fall. Ståle and I was busy trying to catch most of the historic action with our cameras. Go here in order to see more pictures from the first ski descent from the highest point north of the Arctic Circle. Thus we succeeded beyond my highest hopes on Norway's National Day. The entire team on top, the first ski descent ever from the highest point above the Arctic Circle, perfect weather, perfect powder snow, there is no more than can be asked. 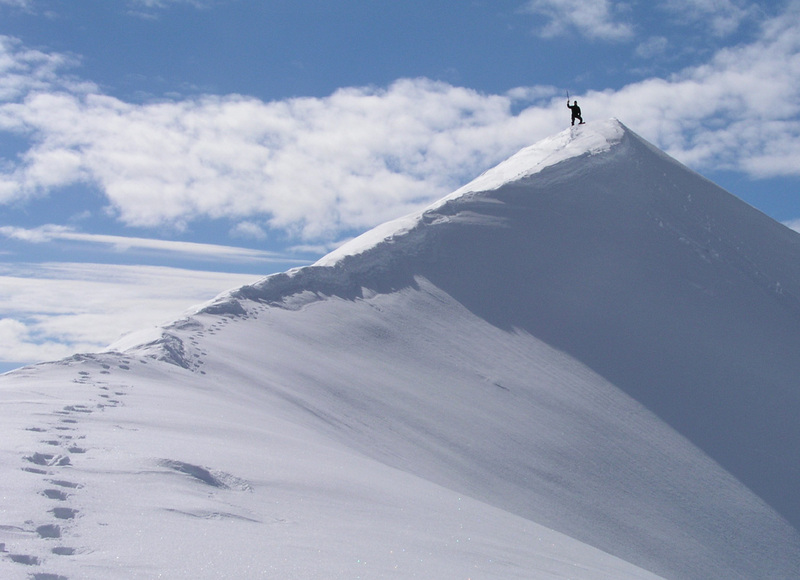 Arnt had a pretty bad case of AMS, thus he left the summit before Ståle and Jan-Frode arrived. 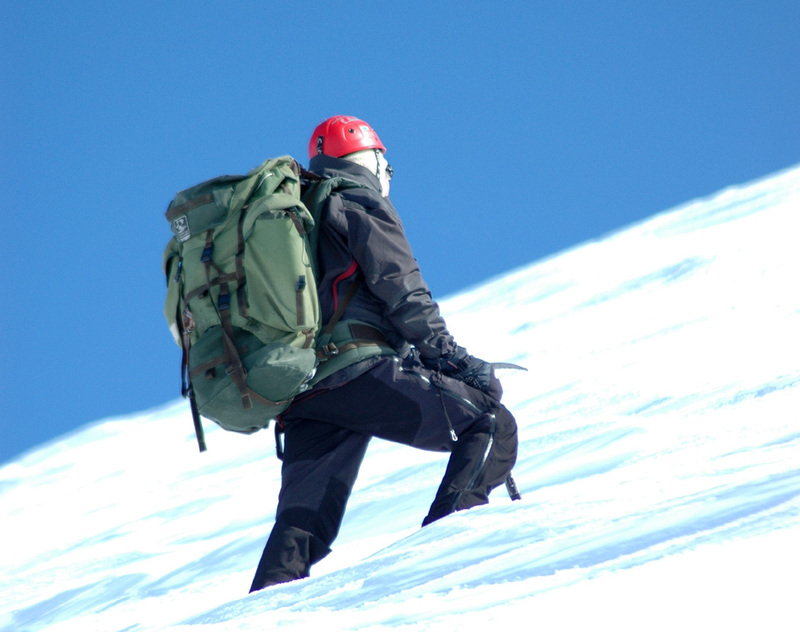 He returned directly to base camp, the lower elevation helped him recover. I sincerely hope that he will have less problems on the next two high summits. 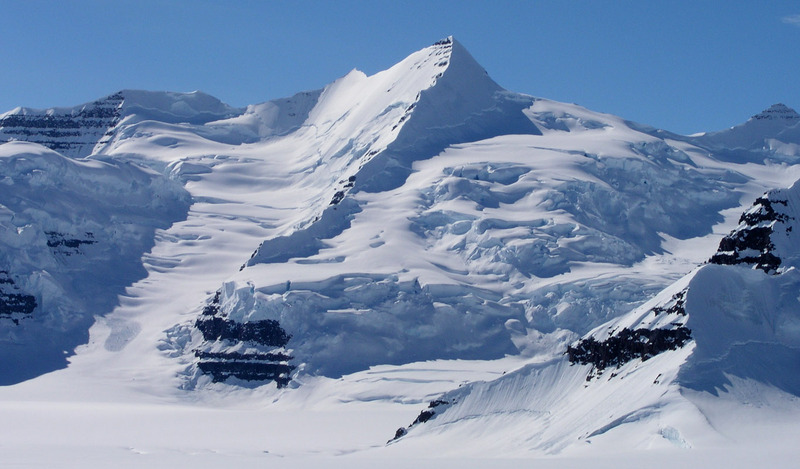 There is strong reason to hope, since he will have spent more time above 2000 and since we will have to establish an advanced base camp (ABC), higher up between those two summits. Just as we were back on the saddle, some clouds with fog came drifting from the west and just barely cleared the high saddle. Shortly after these clouds again disappeared leaving the blue sky to stay in control. 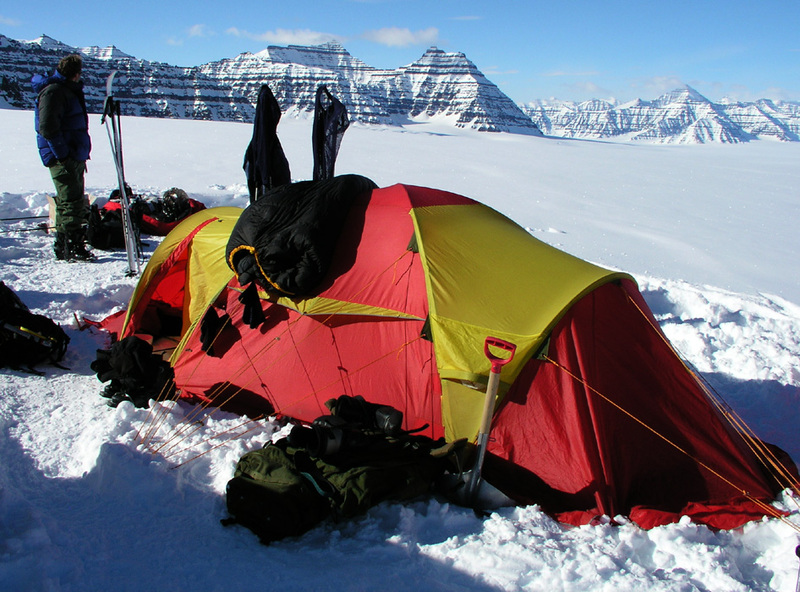 Soon, the entire team was back down in camp, the spirit was generally high after all success and an unbelievably nice day in the arctic with a scenery all around that is breathtaking beyond description. I made a satelite phone call to Heidi and reported our success and general information about everybody having arrived safely and that we were having a great time. She would call around and report the news to at least one person for every member of our team according to a predefined list. This short call revealed a second unpleasant discovery. The satelite phone seemed to kill off one battery for each short call being made. We brought three batteries and it looked like we were down to one. This one needed to be saved for a weather call on pickup day to the airplane. I had worried that the boys might spend too much time calling girlfriends when Torstein had secured NOK 5000. in sponsored calling time from Telenor. Well, this would not at all be a problem. A final inscription read: "Cas Val de Joux FMO LA PIVETTE"
It would be interesting to hear anything about the events behind this incident. A lazy morning with all of yesterdays events in fresh memory. 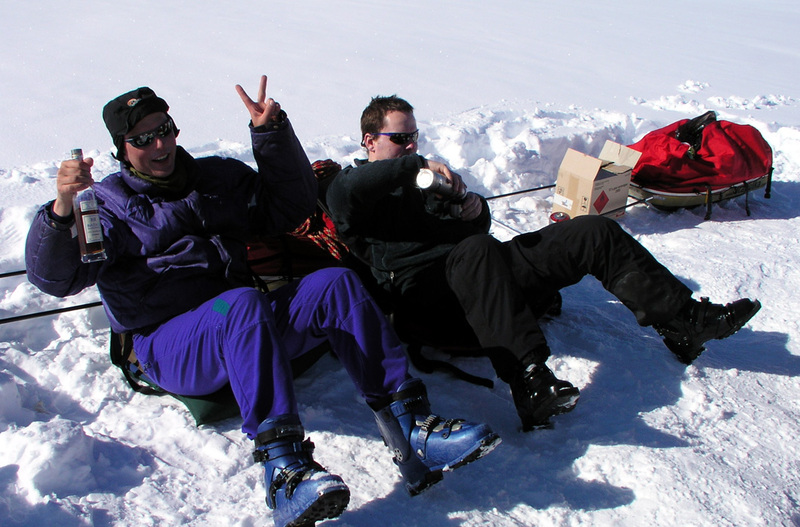 Jan-Frode and Ståle decided that a day of rest was called for. Physically, the ascent yesterday was a tough call for both of them. Arnt, Torstein, Per Ove and I decided to ski across the valley and climb the top we call Skitoppen. The trip across the valley is about one hour, looks a lot shorter. Then the route climbs steeply up a nice glacier. Unfortunately, the Tromsø team had broken a zig-zag trail up there that was just a tiny bit too steep for my waxed skis. 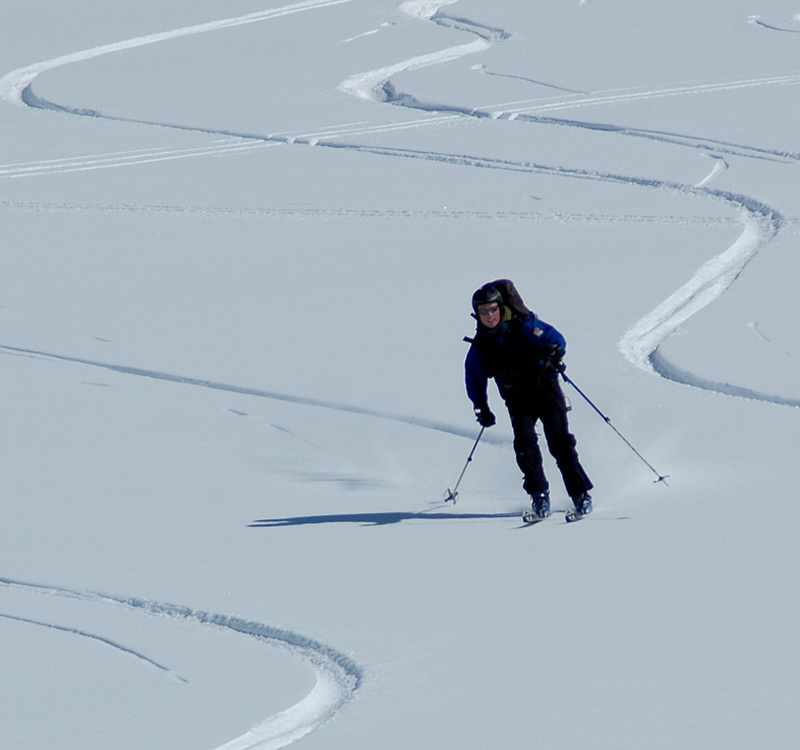 I had quite a struggle in close to a meter of dry powder, the only time on the trip where skins under my skis would have helped. 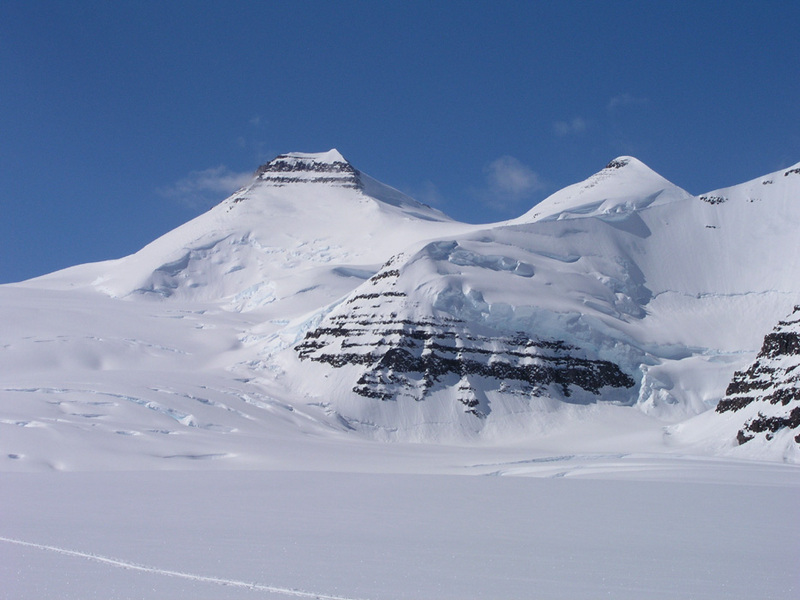 The bottom of the glacier has elevation 2537 m, coordinates north 68:53.888, west 029:35.638, the top is 2760 m, at north 68:53.593, west 029:35.016. 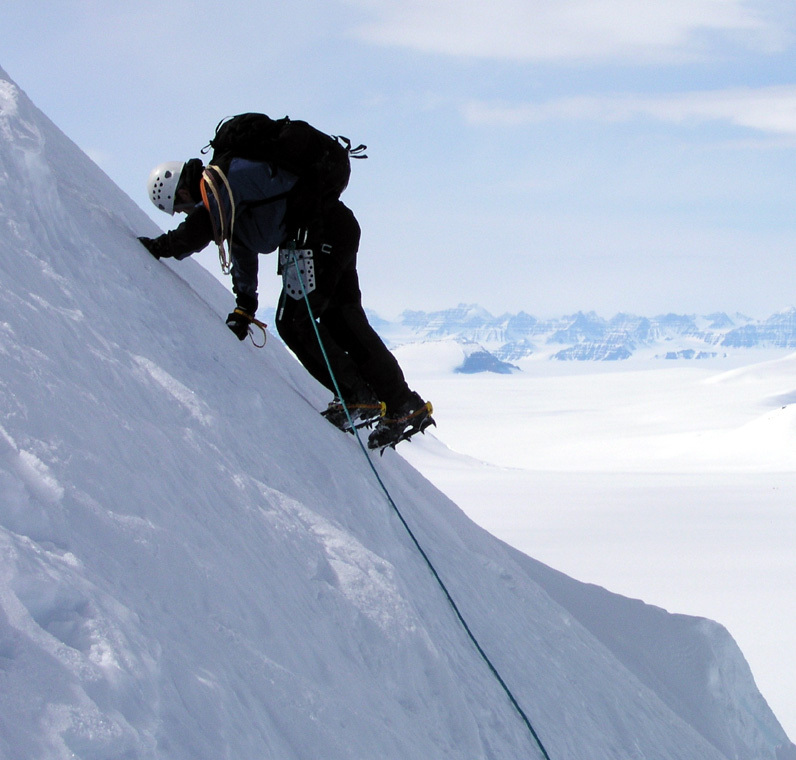 There were some spectacular crevasses near the top of the icefall, however, a pretty safe route led to a broad summit ridge. 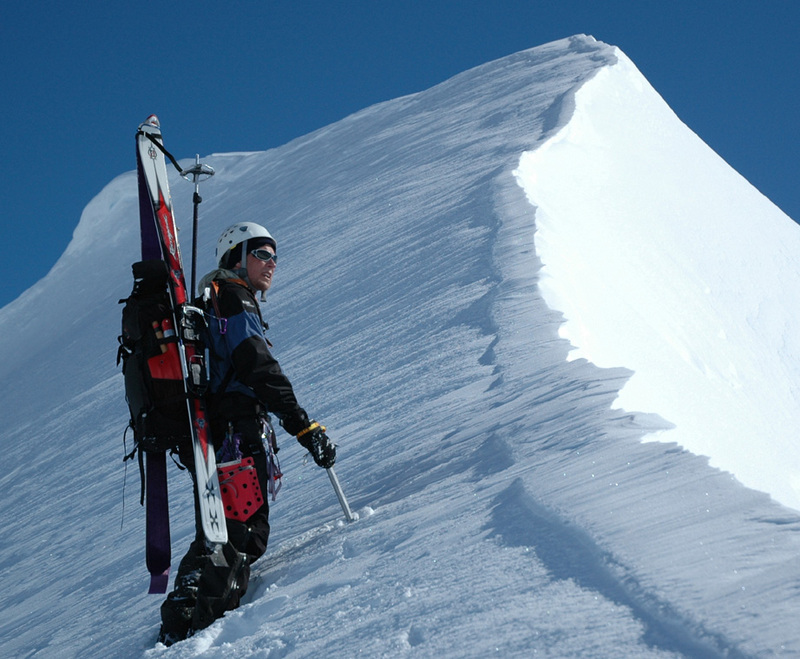 We could ski all the way to the summit, the last few meter being a distinct ridge. The summit is 3266 m, location north 68:52.456, west 029:36.684. This summit has an estimated prominence of 103 meter. 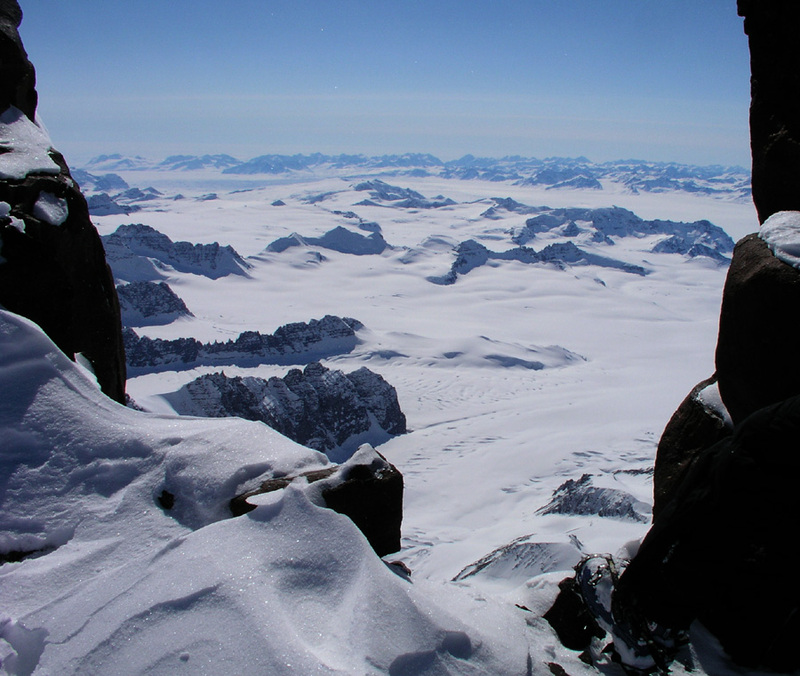 The summit view is very good, west back to the three highest peaks in Greenland, as well as east, a direction that we had not seen before. 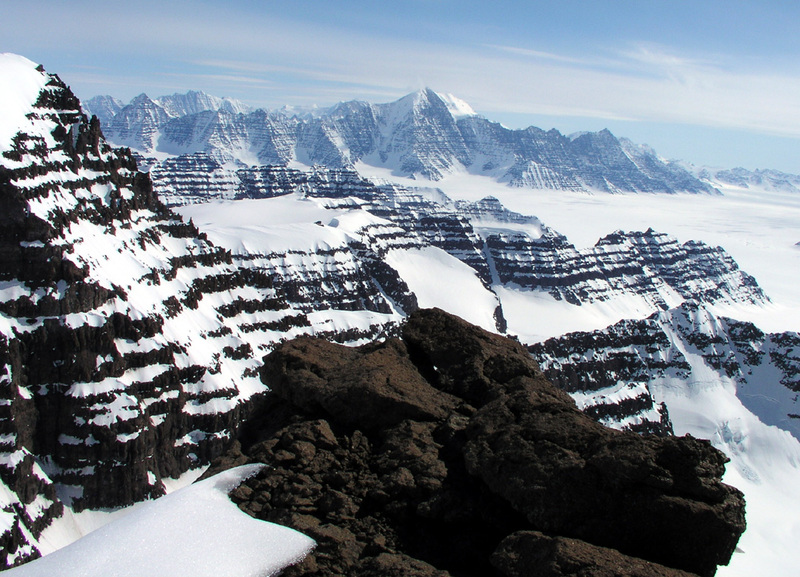 Further north-east, the impressive Ejnar Mikkelsen mountain came into view for the first time. 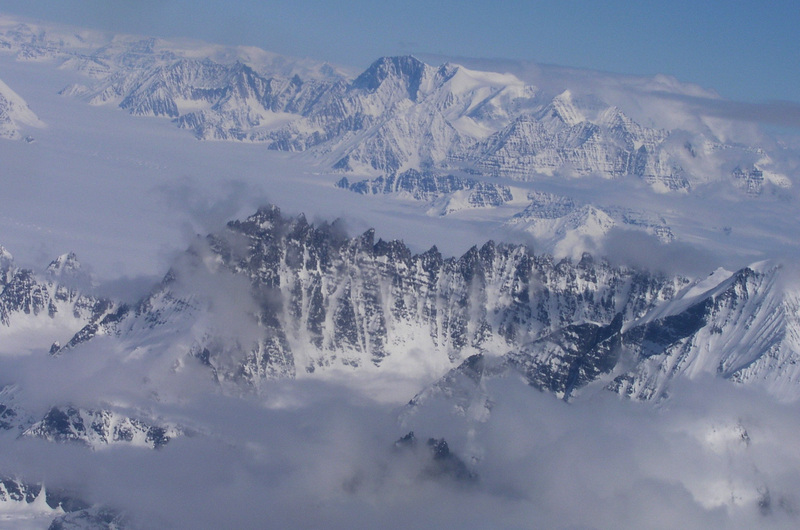 Looking even further north, an ocean of peaks, seemingly an endless area filled by glaciers and peaks. 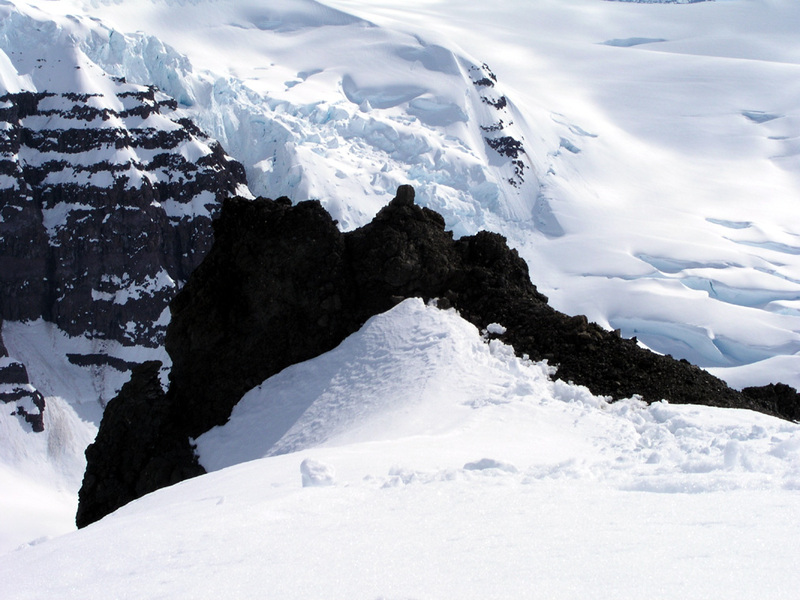 Torstein and Per Ove descended to the next saddle, then climbed along the ridge to explore a possible traverse with descent down the glacier directly below. 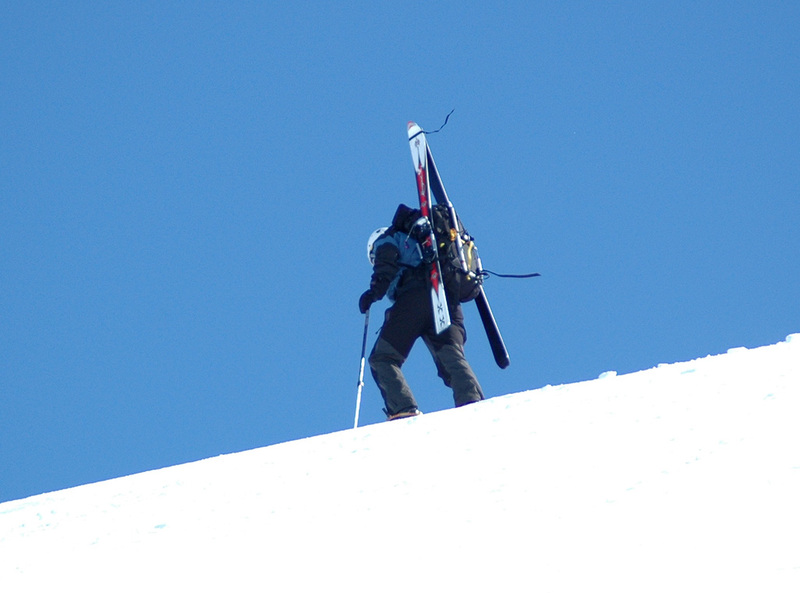 They eventually returned to the summit and skied down our ascent route. 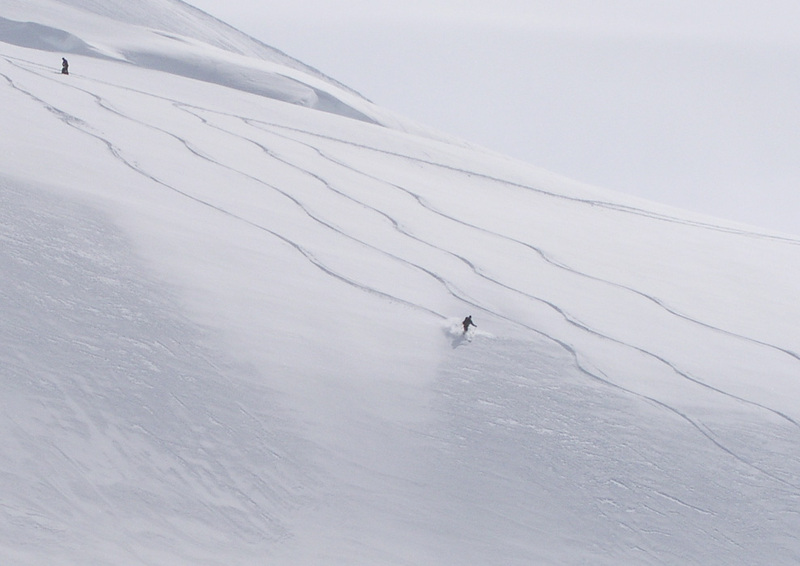 The steeper glacier offered excellent, deep powder. Both Torstein and Per Ove made an excellent demo of deep powder Telemark skiing, Per Ove so exhausted at the end that he took a fall just as the hill ended. The ski track across to Base Camp is longer than it looks, but finally we are all back from a trip that certainly was longer than anticipated this morning. The team, perhaps in particular Per Ove, is feeling the burn of fat, there is a general feeling that the power bar and chocolate is a bit inadequate for lunch. They want moore sweets and perhaps some biscuits. I do agree that we should have brought some biscuits, that was an oversight and should be written down as a point to be remembered for future trips. I will call Fridrik and check if he can ship in about 10 kilo of additional lunch food. There is absolutely no critical issue, but since the Tromsø team is being picked up anyway, we may as well see if this can be taken care of. Arnt expressed some concern about the trip to Dome and Cone being planned with too little time and too much high elevation skiing pressed into two days. I had in any case, planned to bring provisions for up to three days, but his points were indeed very valid. I quickly agreed with his reasoning and assured him that we would set aside two full days for the Dome/Cone climb. Last night was quite cold, colder than minus 30 Celcius. Our thermometer cannot measure any colder. I called Fridrik and asked if he could ship a box of biscuits with the airplane that shall pick up the Tromsøo team. He confirmed that this would pose no problem. The Twin Otter should arrive on Monday, May 24th. 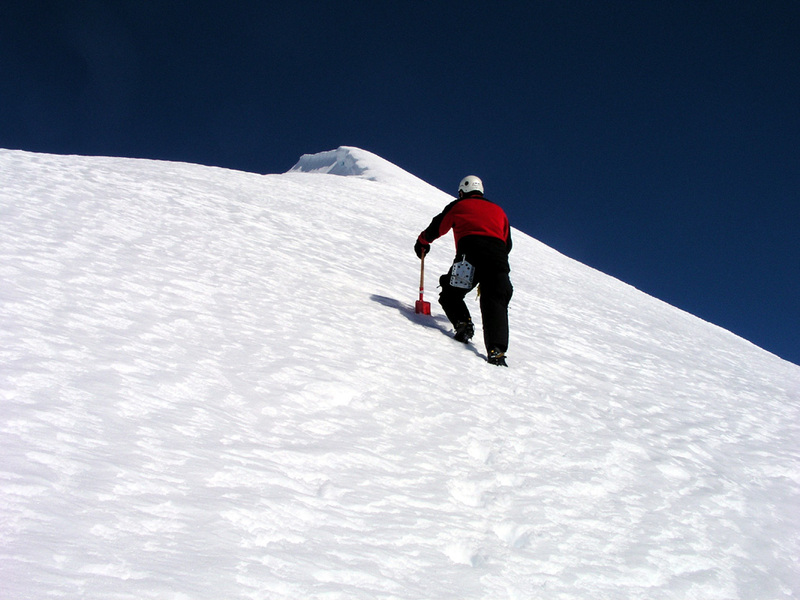 Today, we shall move camp and establish ABC - Advanced Base Camp, in preparation for climbing Dome and Cone. We had a general wake up call at 0700. 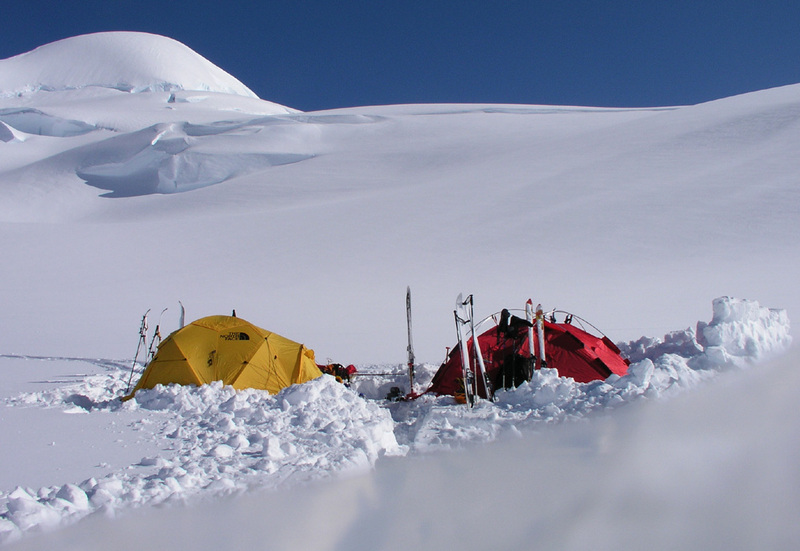 Breakfast and busy reorganizing gear, we left one tent at Base Camp and departed at 1000 with our two sledges. Ståle and Torstein pulling one each. 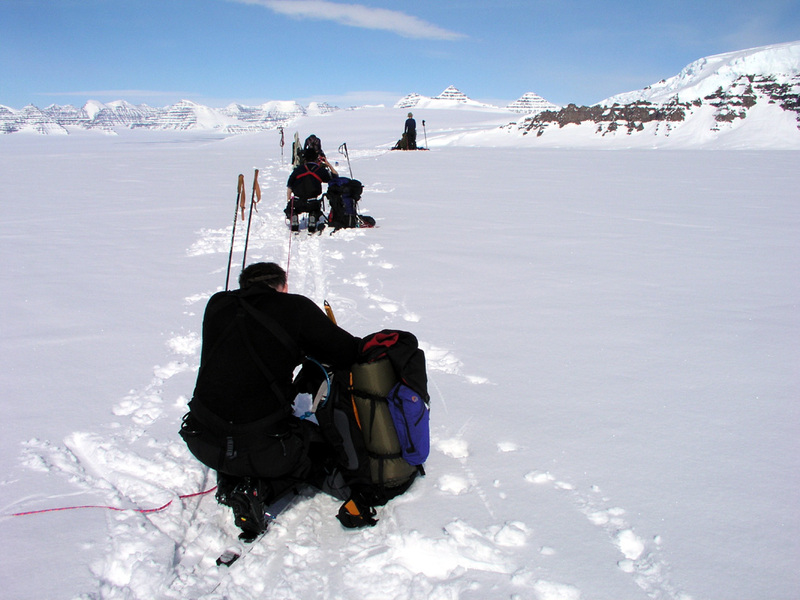 We passed the highest point on our main glacier at elevation 2330 meter, north 68:53.786, west 29:44.931. There was a small ridge further on at elevation 2315 meter, north 68:53.221, west 29:45.938. From here on, our main glacier drops very gently in the direction of the horrific icefall named "Mange Sprekker" on the map. This is an understatement indeed, the name means "Numerous Crevasses", there is absolutely no doubts that this is the case, the glacier dropping 1000 meter before it continues a more level flow towards the coast. The sharp peaks along its side creating an almost unreal scene. 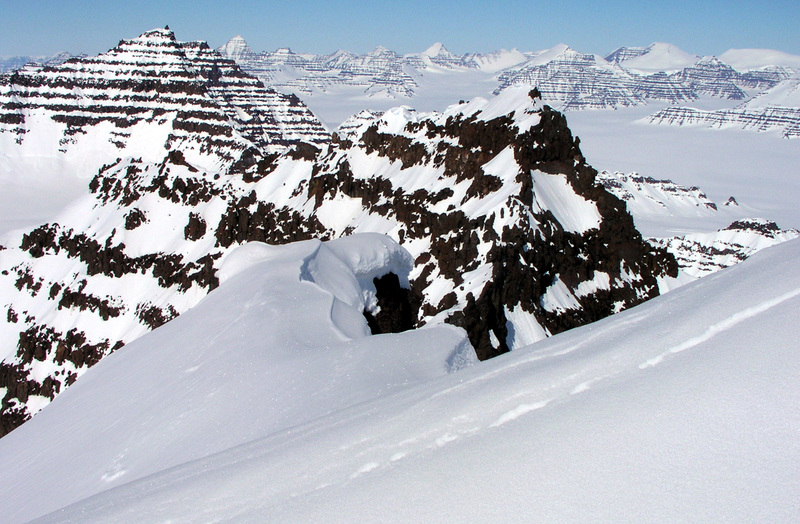 We continued up the glacier that flows down from the saddle separating Dome and Cone. What a fantastic landscape. 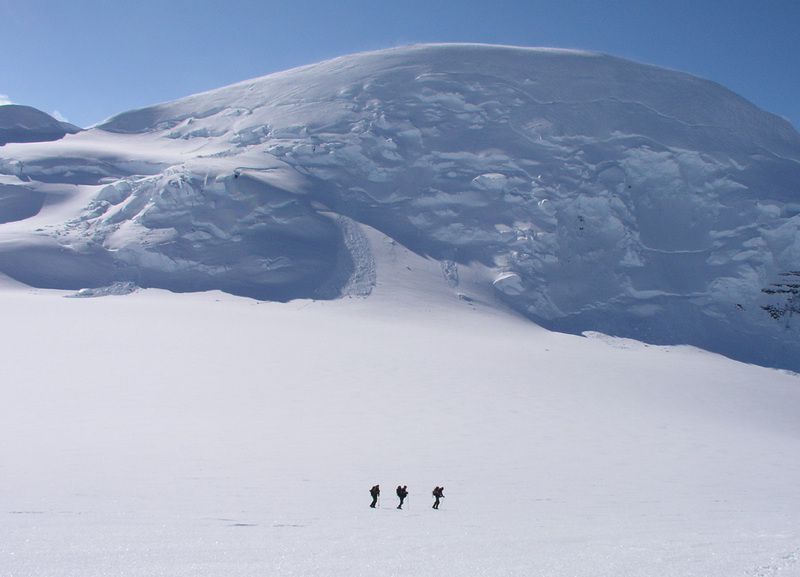 The high ridge emerging from Dome forms the left and most impressive side, steep ice and snow towering above us. We are indeed pretty insignificant in this environment. 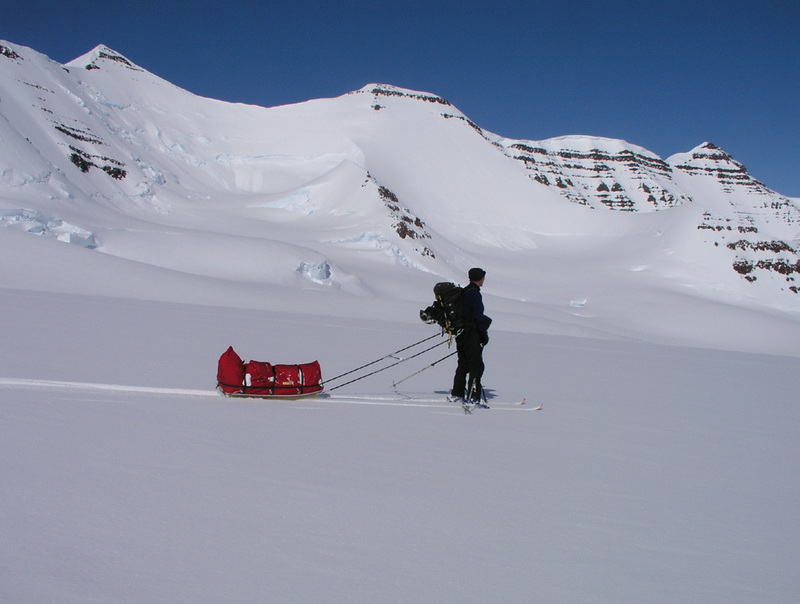 We continued higher than the point where we turned on Sunday, hard work for the two pulling the sledges. ABC established just below a hill at elevation 2818 meter. 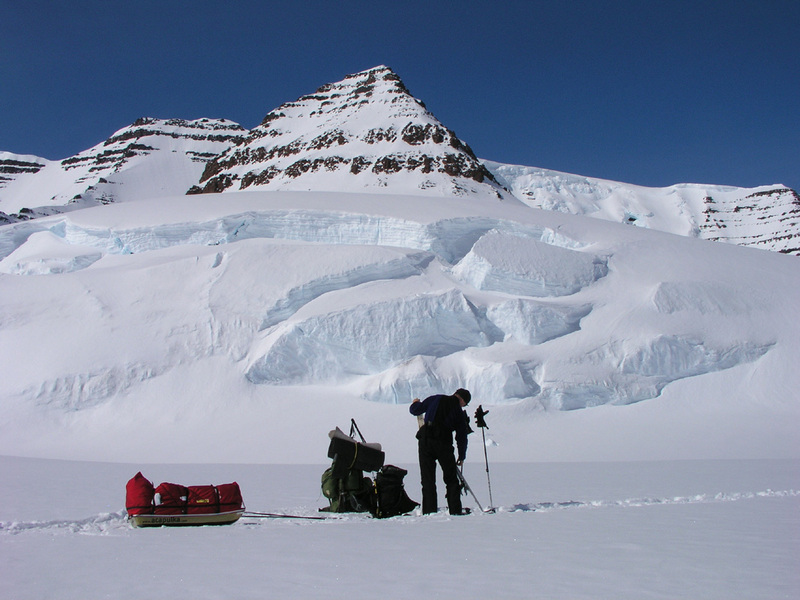 This should serve as an excellent starting point for Greenland's second and third highest peaks. The ABC is located at position north 68:51.616, west 29:53.875. The team is functioning well, the camp is quickly established, everyone helps out, not many words of coordination are needed. The time is now 1900, temperature is -20 Centigrade, the sun is still high in the sky. Beautiful, ice cold morning. We left at 0830. 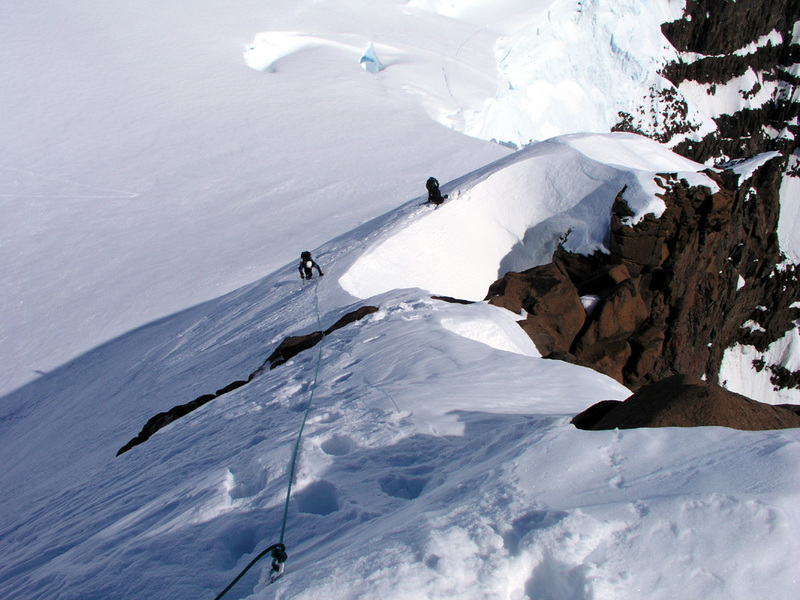 The route climbs gently up nice glaciers to the main ridge that extends from Dome. In the beginning, the view back south-west across Korridoren to Christain IV Gletcher, just gets better as we climb higher. 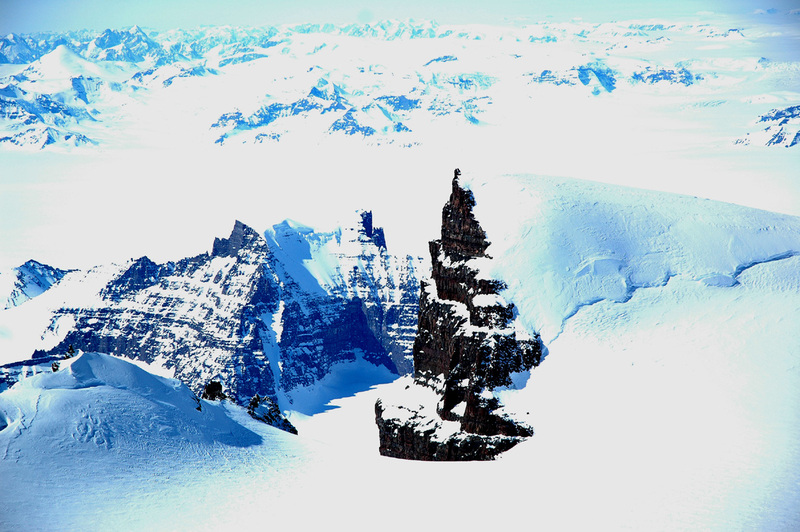 The impressive vertical cliffs from Styggehorn can be seen in the right corner of the previous picture. We rested with spectacular views to the south at elevation 3326 meter, location north 68:50.898, west 29:52.649. The ski route continued up another gentle slope and ended at a small, local top, elevation 3447 meter, north 68:50.634, west 29:53.685. 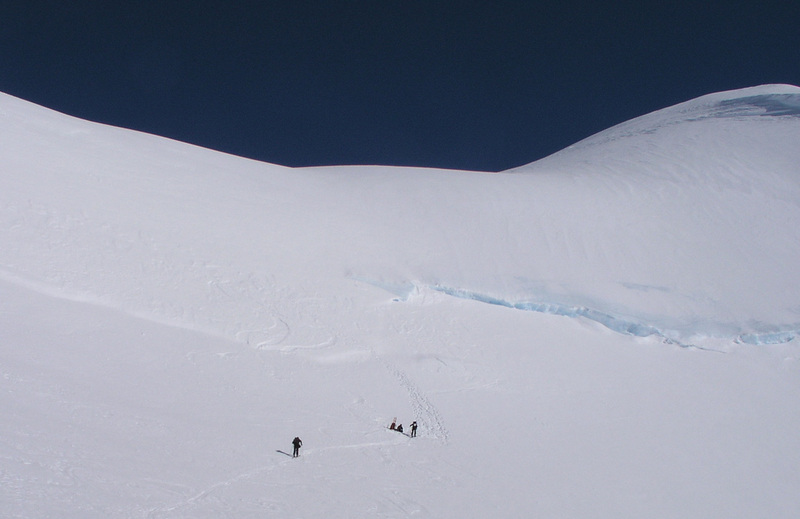 From here, there is a 50 meter deep saddle before the main summit ridge begins. We continued on foot and reached the top at 1230 after a very nice, one kilometer ridge walk. The summit panoarama views were perhaps even more impressive than from Gunnbjørnsfjeld (these pictures are under the Dome entry in the mountain list.) Our strategy has now worked well at two summits. By keeping the time on Greenwich (equal Iceland) time, we are actually getting up a bit earlier than local time should dictate. The early "suffering" has paid off. 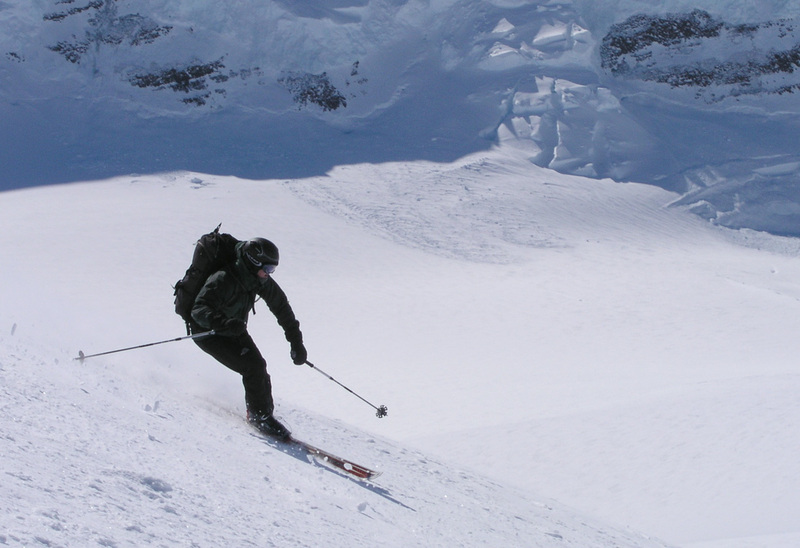 Firstly, one normally regains comfortable temperature when skiing uphill in a sustained fashion. Secondly, and most important, we reach the highest points in the Arctic when the sun is at its highest and warmest. This leaves time for long summit rests, long breaks for photography and motivation to carry skis to the summit for then to capture good, first ever, ski descents. 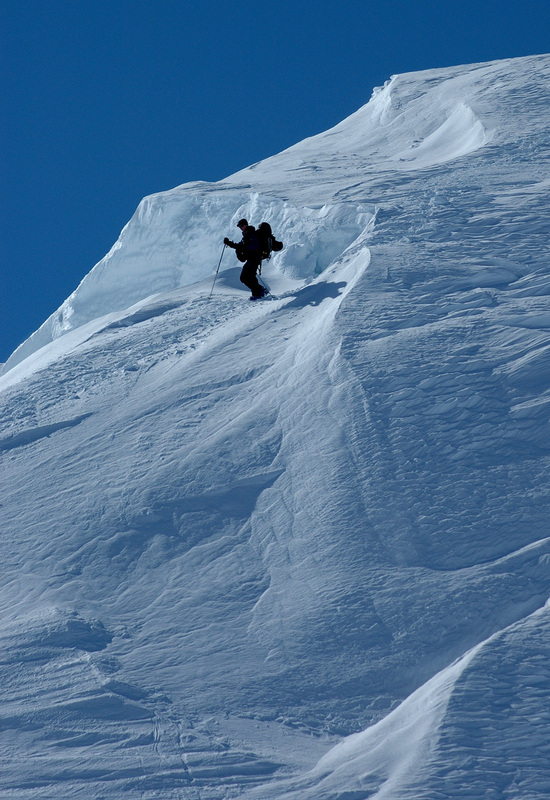 Again, Per Ove and Torstein skied from the very summit and down to the saddle before the small local hump in the ridge. 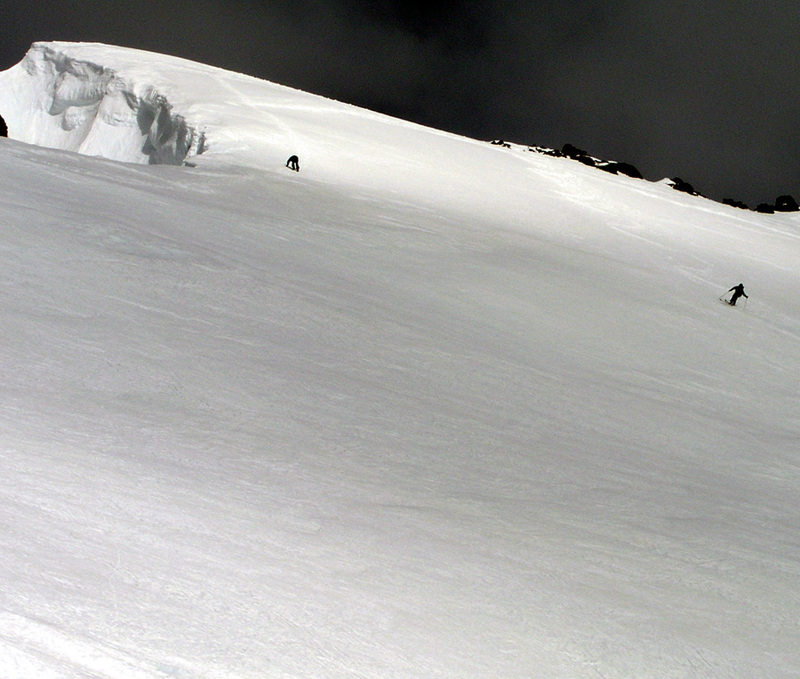 They started out down the very ridge, keeping on the east side, then skied more steeply down to the glacier below. 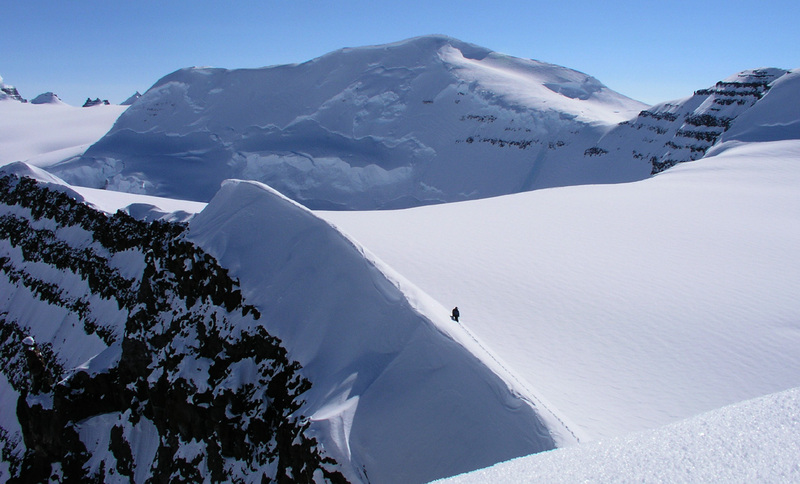 The ski descent finished on more gentle slopes above two very distinct open crevasses and traversing directly back into the saddle below the Dome summit ridge. The rest of the team walked back down along the route of ascent. 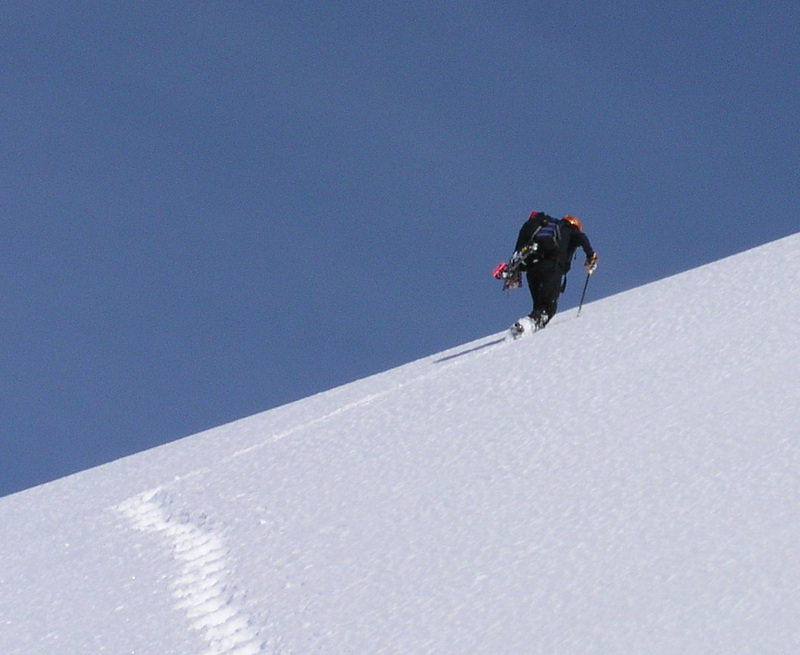 A final uphill to the top before the Dome saddle, then a very long and very nice ski descent back to ABC. Dome is in many ways, the finest mountain in this area. 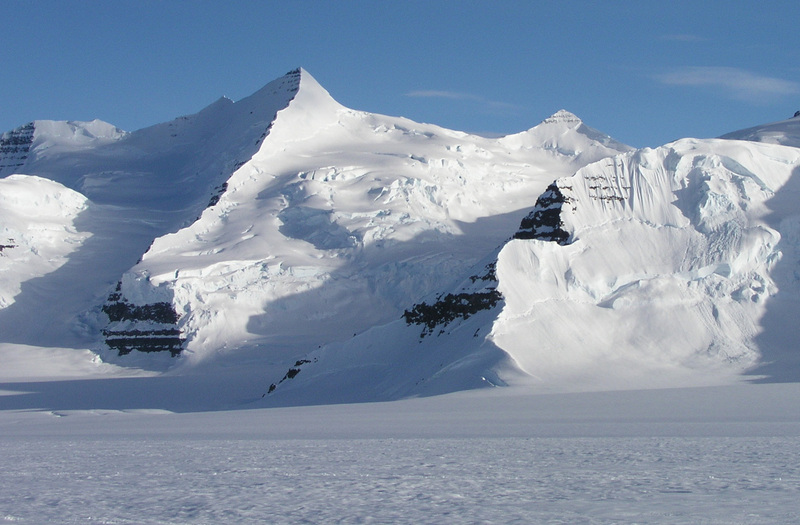 Its position overlooking the lower area extending to the east coast, its monumental ridge towards the icefall "Mange Sprekker", its view across to PEV, the 4th. 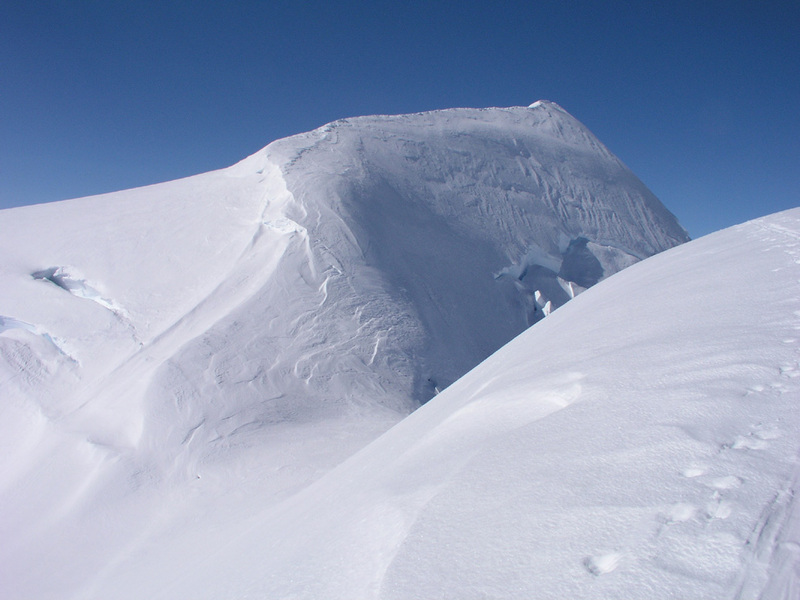 highest peak, lastly, but not least, the one kilometer ridge, very distinct, but not difficult, all contributes to make Dome a very special mountain. We returned to ABC with good skiing, in almost no time. The last hill being such fun that Per Ove, Ståle and Torstein skied back up, just to get a second run down. Arnt, did very well today. No signs of AMS, I think he truly enjoyed Dome, this is indeed very good and I am very happy about it. Everybody slept OK after yesterdays great adventure. We were ready to leave ABC at 0845. 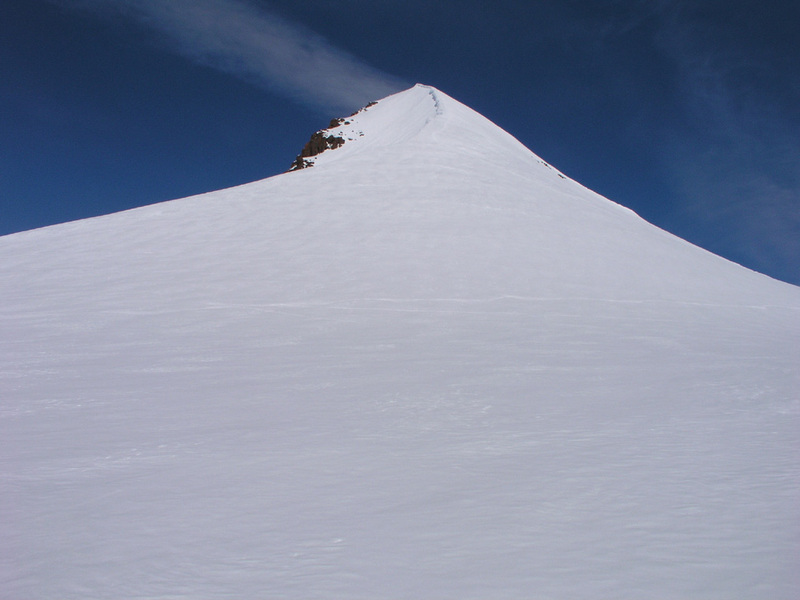 We skied up on easy snow with Dome towering behind us, to the bowl just below the south-west ridge that extends out from Cone. This bowl is at approximately elevation 3425 meter. 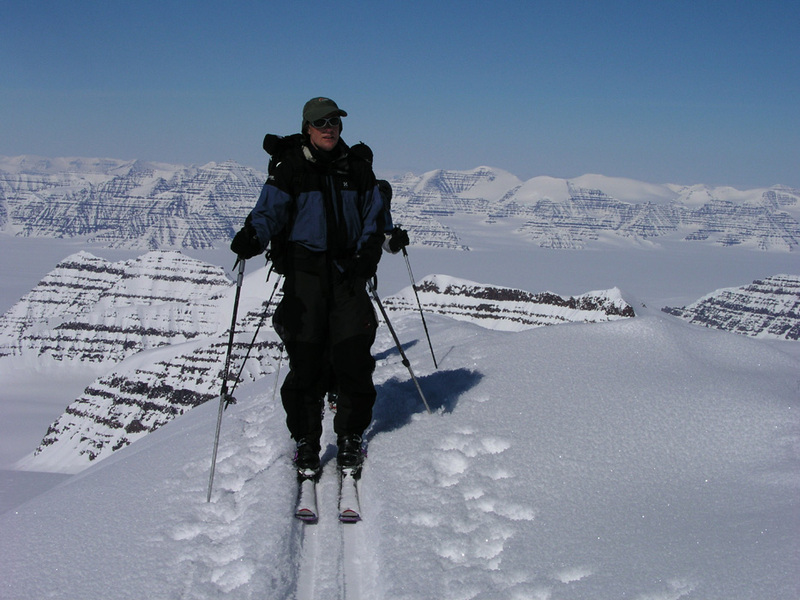 Except for our two summit skiers, we left the skis and continued on foot. 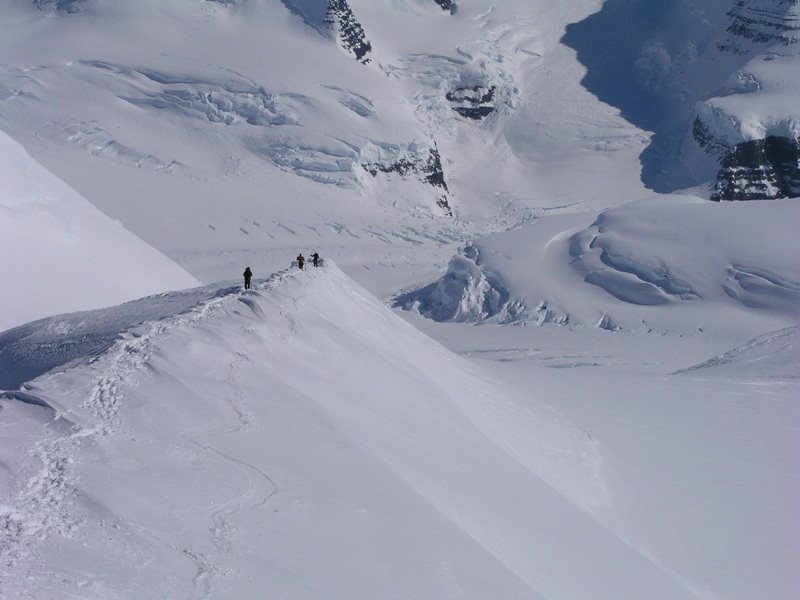 The first section, from the bowl to the south-west ridge was steep snow and care should be taken to avoid a glissade back to our point of departure. 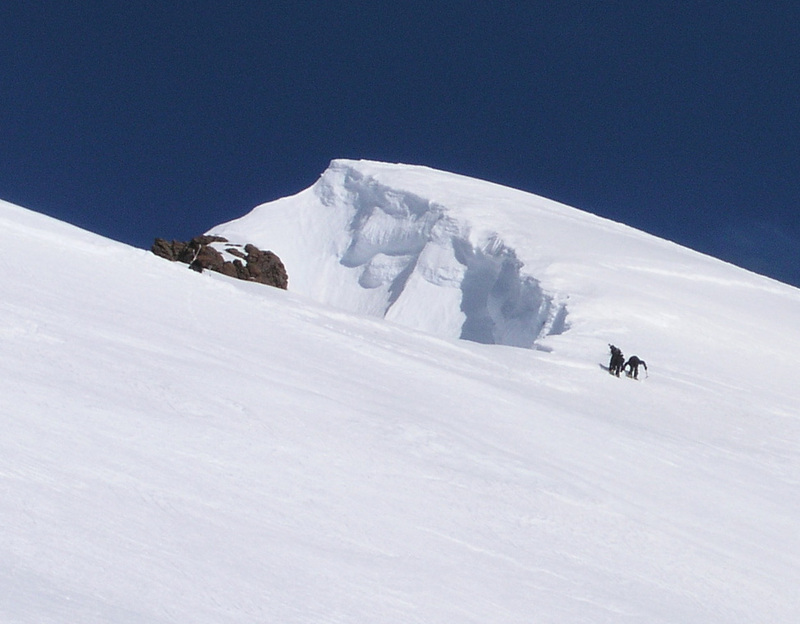 The south-west ridge, elevation 3500 meter, is quite level before it reaches the summit dome. The final ascent, on moderate snow and appropriate zig-zags carried no problems. I arrived at 1155, shortly after Torstein and Arnt. 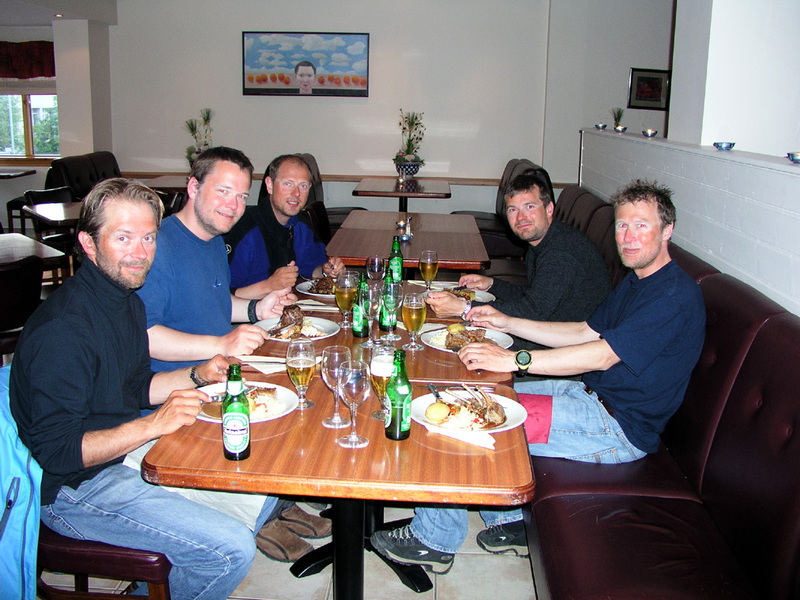 We have now made all three summits in the same order, Torstein, Arnt, me, then Per Ove followed by Ståle and Jan-Frode. This summit was cold and windy, more so than the previous two. My GPS recorded an elevation of 3663 meter, a few meter low. The location is north 68:52.283, west 29:57.009. 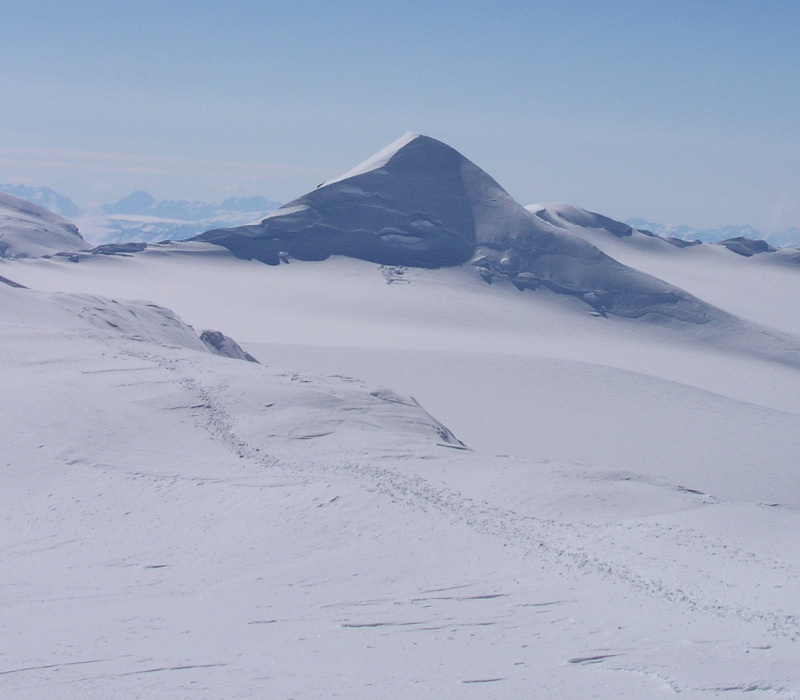 I did pay particular attention to the interesting summit Styggehorn to the west. 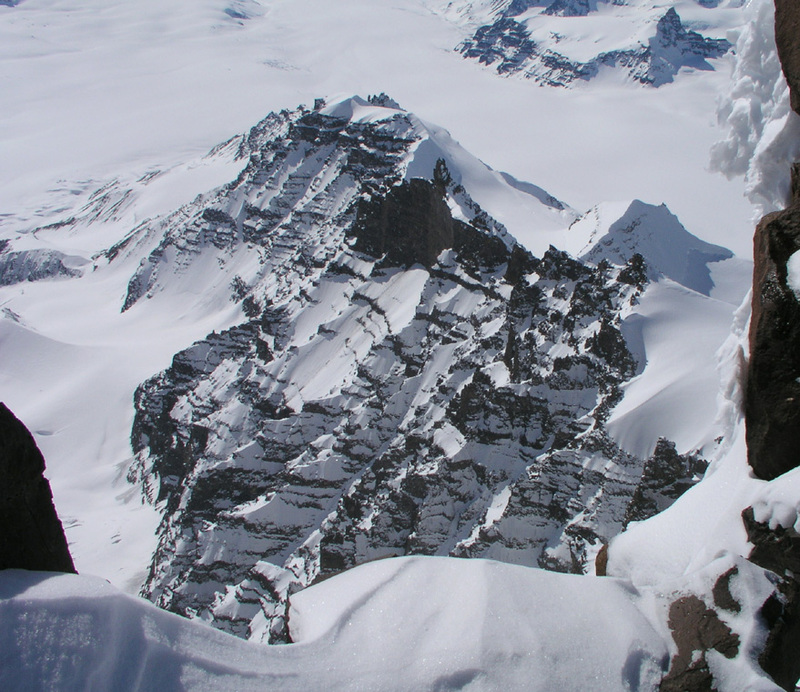 This summit forms the top of a very big vertical rock wall extending up from the glacier Korridoren. This peak was more windy and therefore felt colder than the previous two. 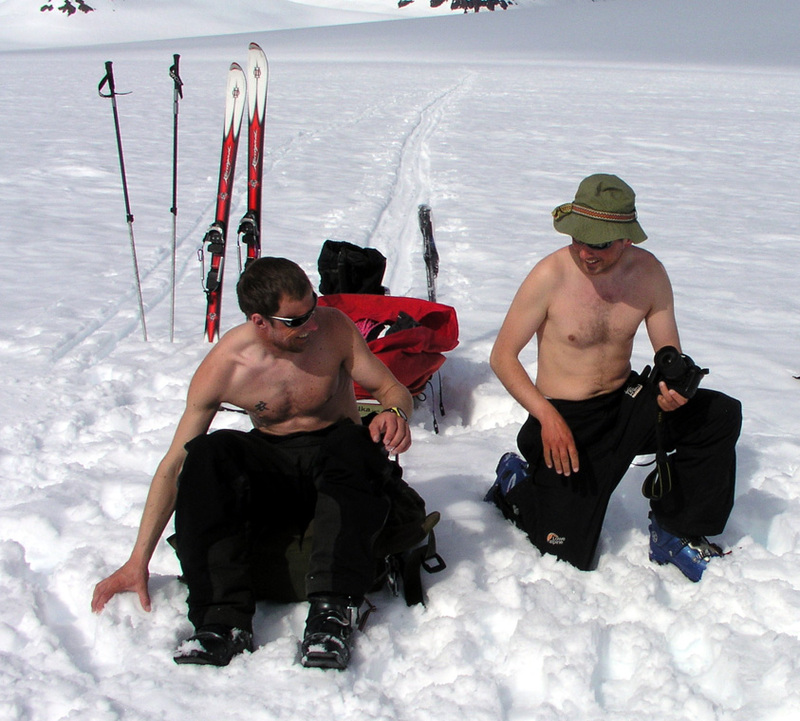 Our stay was kept to a minimum and soon Per Ove and Torstein prepared for the ski run. After photography and further summit observations we returned down, meeting Ståle and Jan-Frode as they approached this third highest summit in the Arctic. 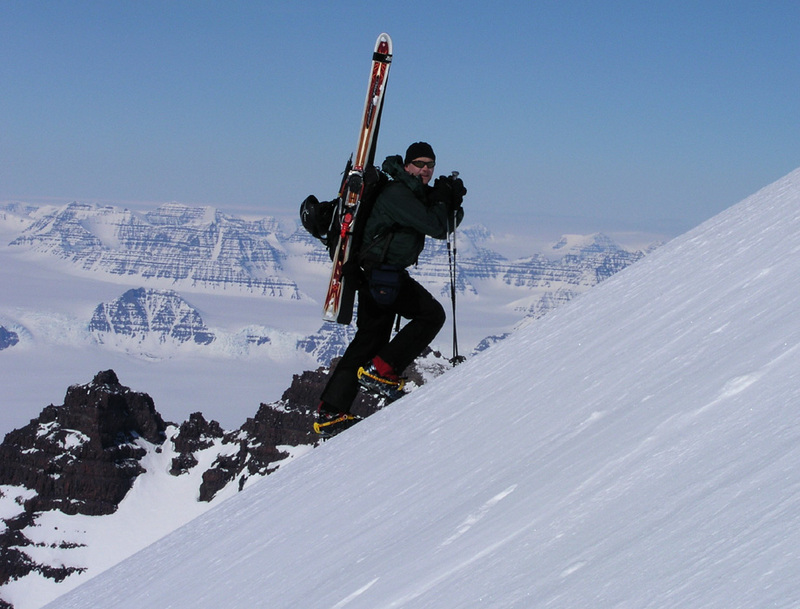 Again, Per Ove and Torstein did perfect Telemark ski descents from the very summit and back to ABC. 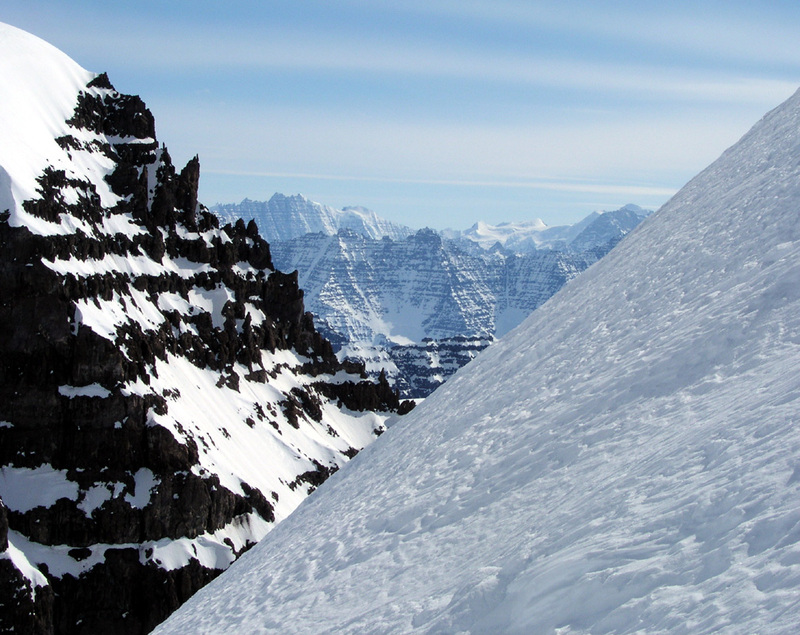 This completed our three ski descents from the three highest peaks in the Arctic in less than one week. We broke ABC and started back towards Base Camp at 1430. Ståle had some rather hazardous skiing down the glacier with a sledge behind. Despite a significant crash, the equipment held up. Ståle learnt that downhill skiing with a sledge behind calls for some extra caution. Per Ove pulled the other sledge, he was quite a bit ahead of me and Ståle on the return trip. We reached Base Camp at 1730, so only three hours going this (easy) way. The day ended with a warmer evening than we have had so far. Last evening, the clouds came in. The first clouds seen since we arrived here. The wind also picked up, however never strong, just noticable. This morning came with grey weather. In fact, WHITE is a good description for outdoors right now. There is a light snowfall, everything is white, nobody felt like getting up early. Having accomplished all main objectives in less than a week, partly because of good team dicipline in getting up very early in very cold weather, this is clearly our well deserved day of rest. A day for reading in the tents. A couple of books on Everest, then the famous To Whom the Bells Toll, by Hemmingway. The time is now 1300 and I am still in the tent. I have completed breakfast, not much more. The air pressure is a bit lower than what we have observed earlier, in agreement with the observed conditions. We cannot complain, the weather has been fantastic. As often is the case, conversation easily turns to speculations about how long the current conditions will last. My guess is not too long. 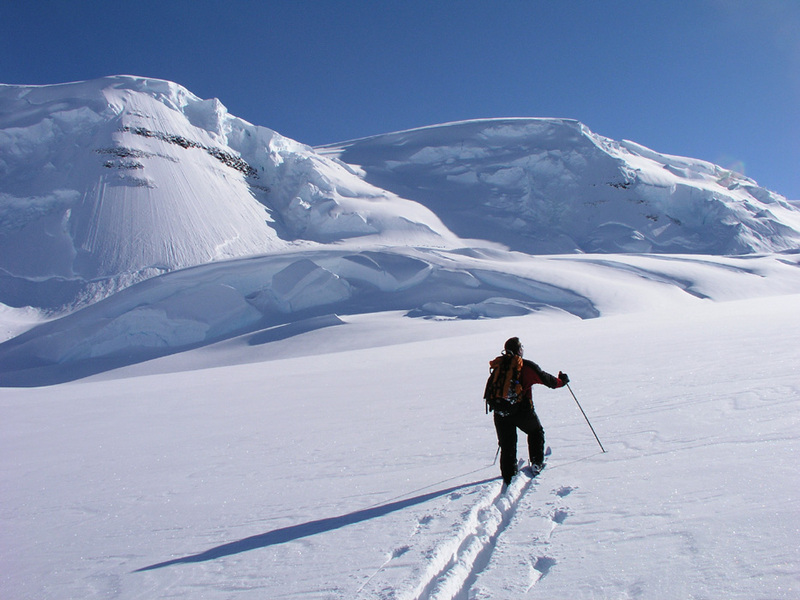 I got up and out later in the afternoon and skied a solo trip to waypoint 4, the place we turned around last Saturday. Elevation 2600 meter, so I had a small workout in whiteout conditions. The entire trip being guided by GPS. I ran into the old track higher up. It was more visible and less filled with snow up there. On my return ski, the clouds started breaking, it seemed like good weather was about to return. Pasta for dinner, very tasty. An unpleasant discovery followed as an aftertaste: We had brought 24 portions of pasta for 6 meals, however 6 portions had by mistake been used for each of our two pasta meals so far. Thus, one of our future dinners had already been consumed! Not a big concern, we had pancakes as an extra luxury not allocated to a day, and we would always go on various leftovers the last day if required. We started to talk about tomorrows possible goals. After team work all previous days, it seemed reasonable to split into smaller groups to maximize individual preferences. The possible ascent of peak 3526 across the valley was discussed. This peak behind what we call "the shark fin", looks interesting. Ascending it would require a ski up what looks like a fairly broken up icefall. Another possibility was an attempt at Greenlands number 5, peak 3603. 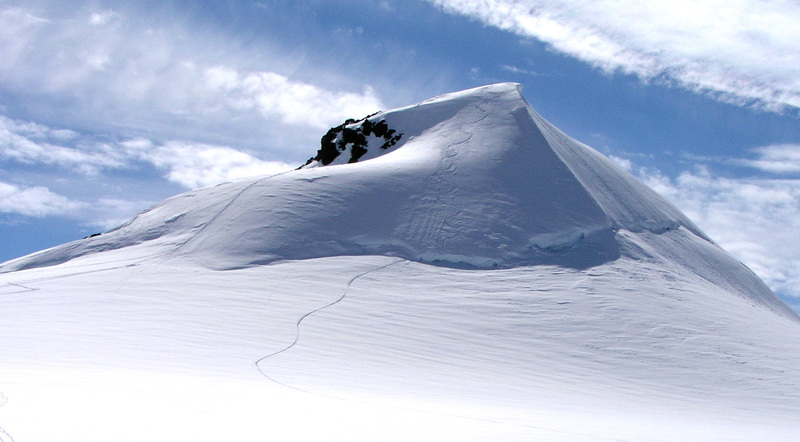 This peak is up the glacier to Gunnbjørnfjeld, across the saddle and further west beyond Cone. 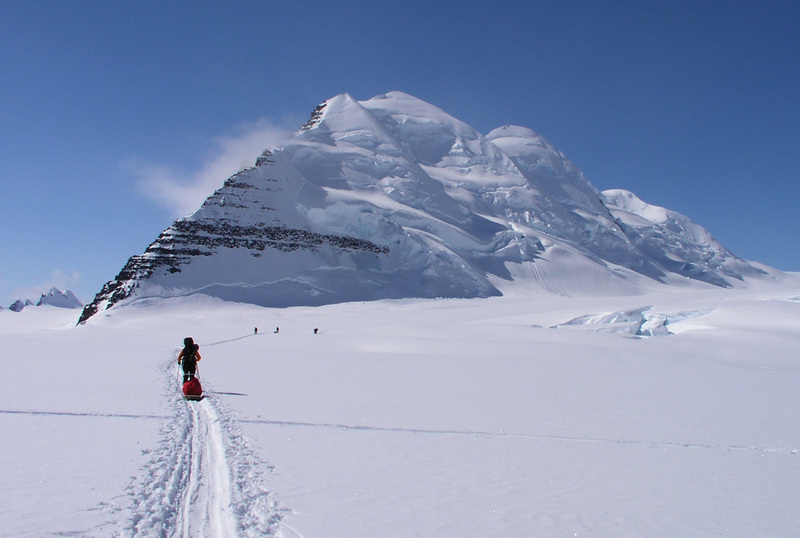 Per Ove and Torstein would like to explore the pointed peak on the left side as we ascend the glacier, possibly trying to follow the high ridge back out towards Base Camp and the big valley glacier. Point 3535 just across the high ridge from Gunnbjørnfjeld would be another possibility if 3603 should turn out to be outside of our reach for the day. With three different projects up the glacier, we settled for this. Agreement to get going at 0700 tomorrow, an early start guarantees the best conditions higher up. A day of further exploration. It turned out that all three objectives being discussed yesterday, became realities. 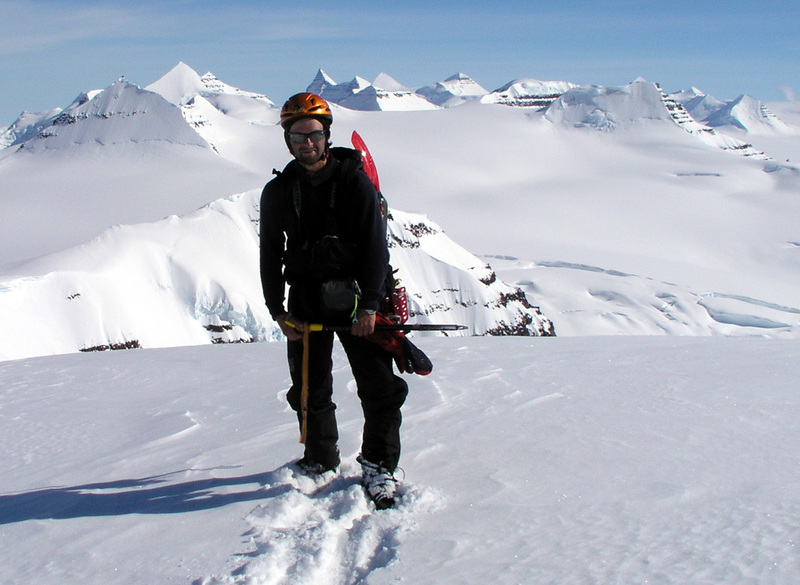 We all skied up the glacier to the vicinity of the big crevasse. 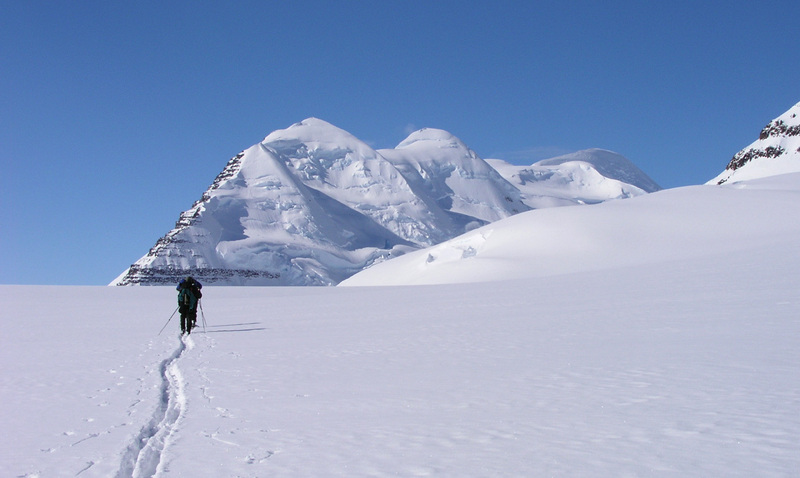 At this point Per Ove and Torstein headed left towards the pointed peak that just barely is visible from Base Camp. They climbed it, the slope being steep enough to require belayed climbing. 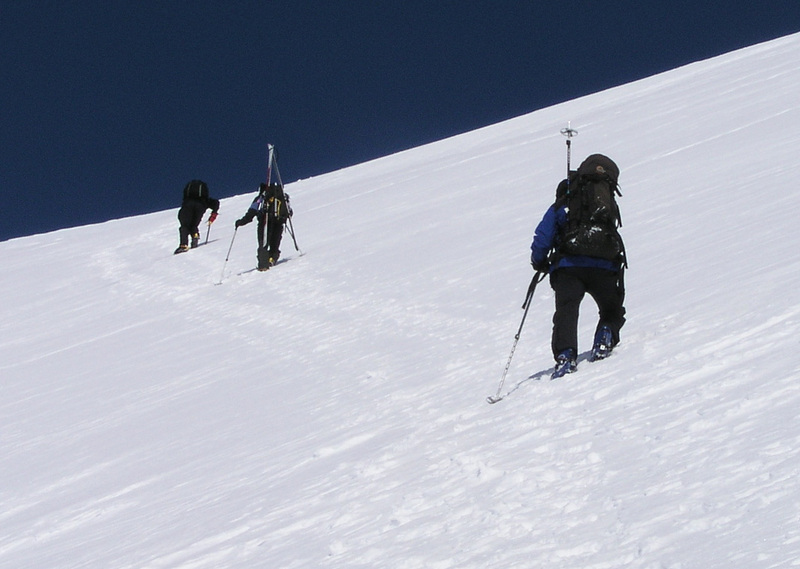 They carried the skis all the way up with the intent to traverse the peak, however the terrain and snow did not invite to any further advance and they downclimbed carefully along their route of ascent. 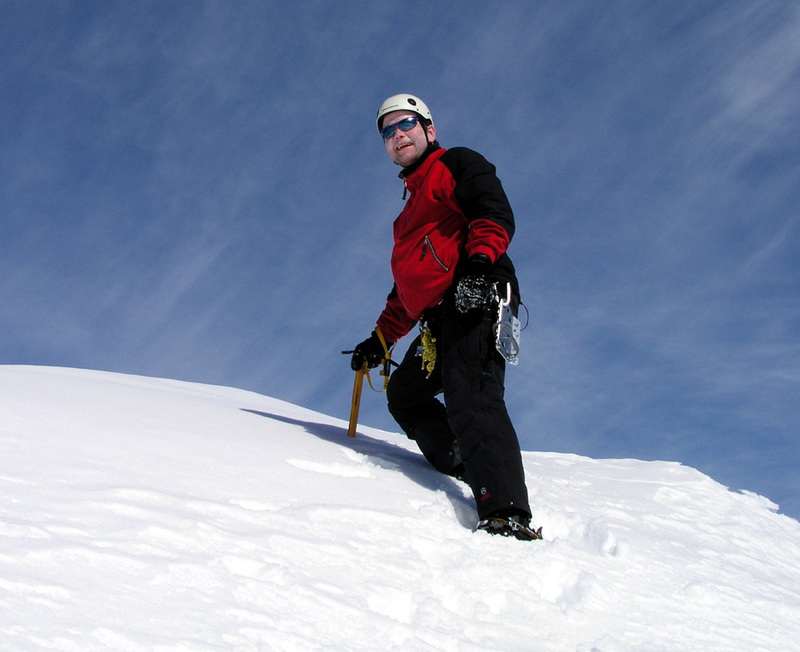 The peak was named "Peak Bergen", however upon return to Norway I learned that it was already climbed once by the Austrian team who christened it "Peak Austria". 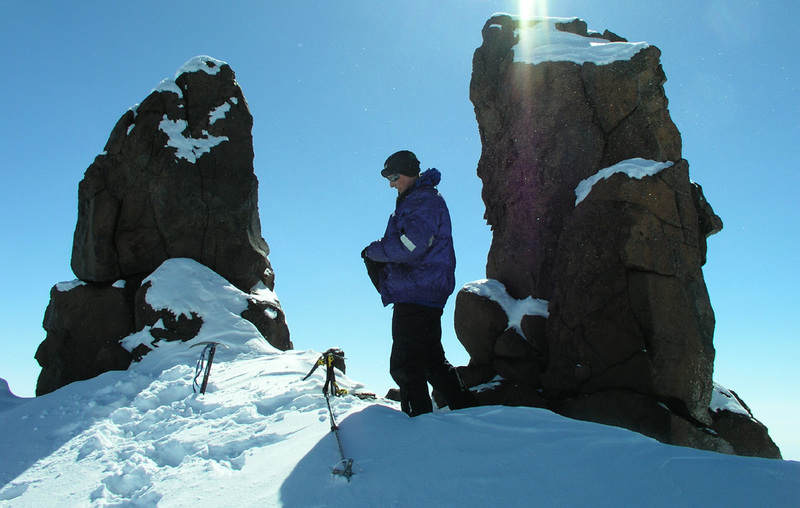 It was a fine accomplishment and certainly the first time ever that somebody visited the peak with skis on their packs. 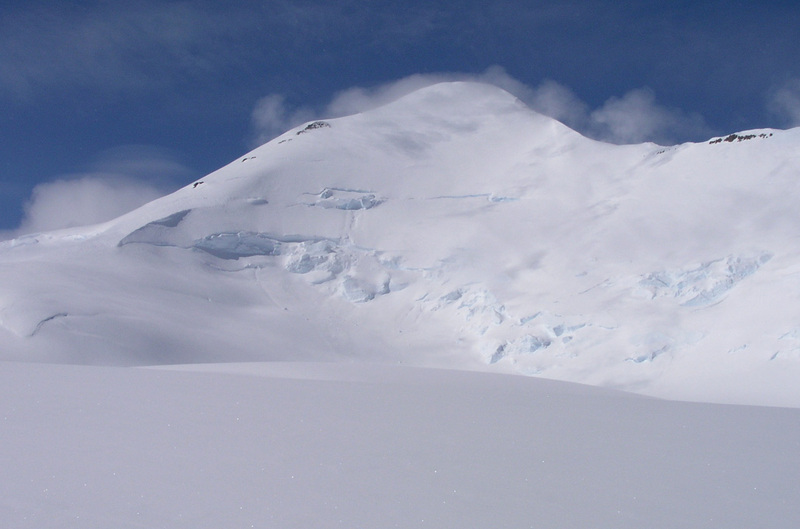 This peak is estimated at 3262 meter with a primary factor exceeding 100 meter. A very fine climb indeed. 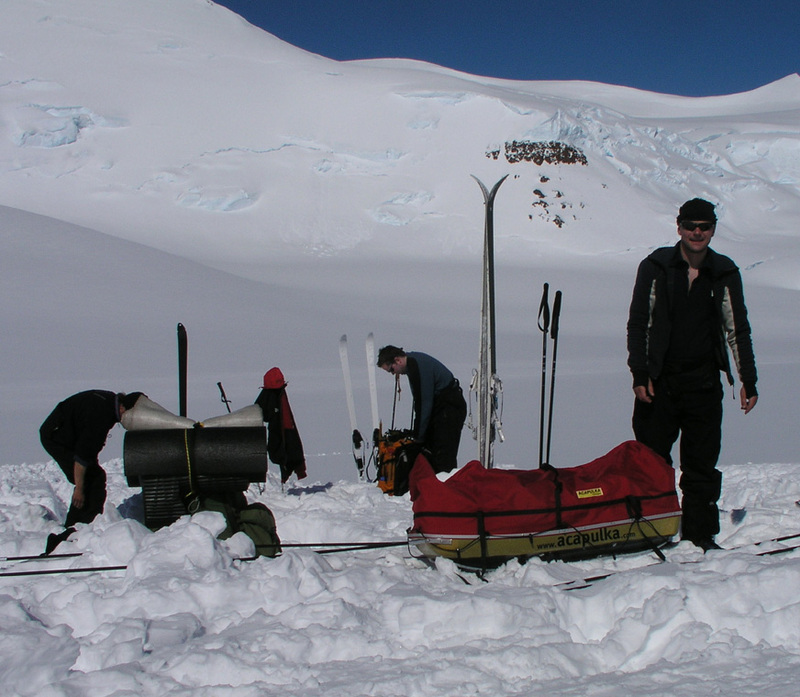 Meanwhile, Arnt, Jan-Frode, Ståle and I continued up the glacier. 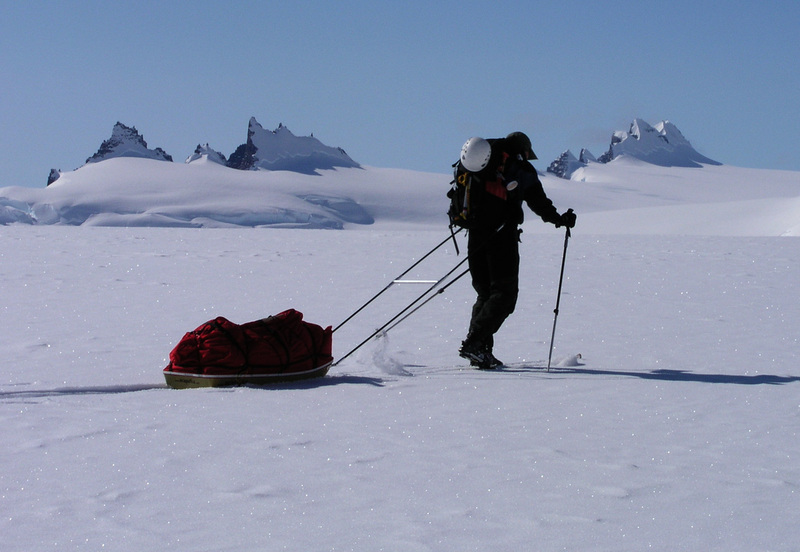 Arnt did not feel any motivation for 3603, his goal was 3535 at the crest of the glacier. 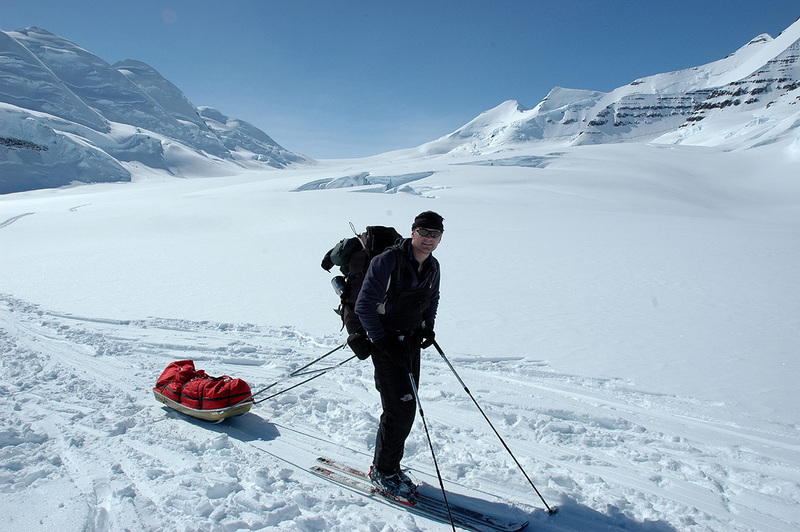 Unfortunately, Jan-Frode decided to turn around and return to Base Camp, not feeling up to the long and hard uphill that he already climbed on May 17. This created a slight problem as Arnt wanted to know if he could climb 3535 solo in case Ståle and I would head for 3603. I thought that would very likely be completely safe, however told him that I would reserve judgement on this until getting high on the glacier with a better view of the summit route. Not completely happy, but with understanding for our general policy of no solo climbing, we all continued uphill. I decided that either we make a (safe) exception to the rule, or the three of us would climb 3535 together. 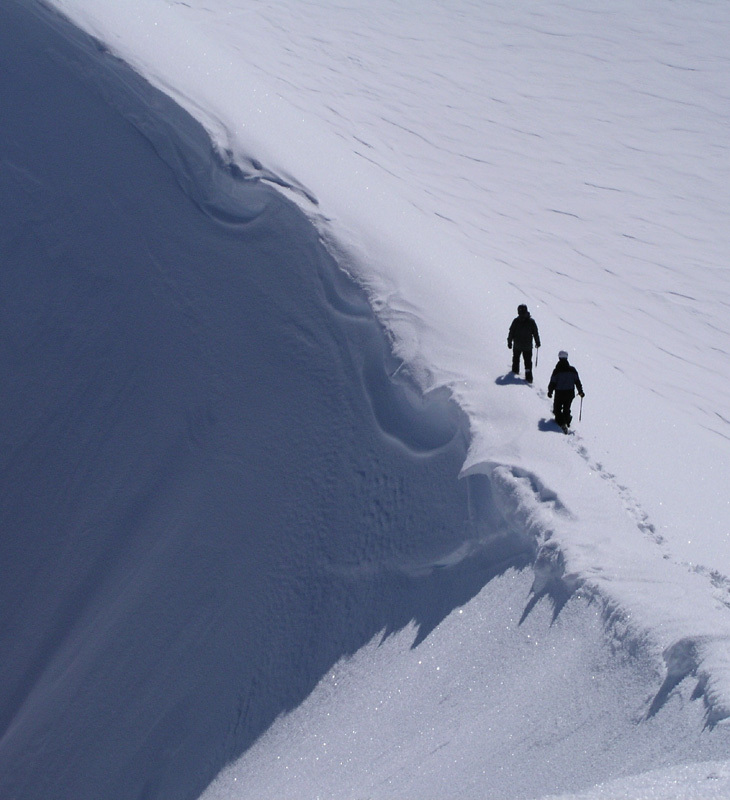 Arriving higher, it became clear that 3535 was a very gentle slope that looked free of crevasses. Arnt got an OK to climb it solo, with a stipulation that he made a very visible sign in the snow upon return to the main ski track before skiing back down to Base Camp. Ståle and I continued across the main Gunnbjørnfjeld saddle, crossing it just west of point 3535 at elevation 3438 meter, north 68:53.556, west 029:55.234. 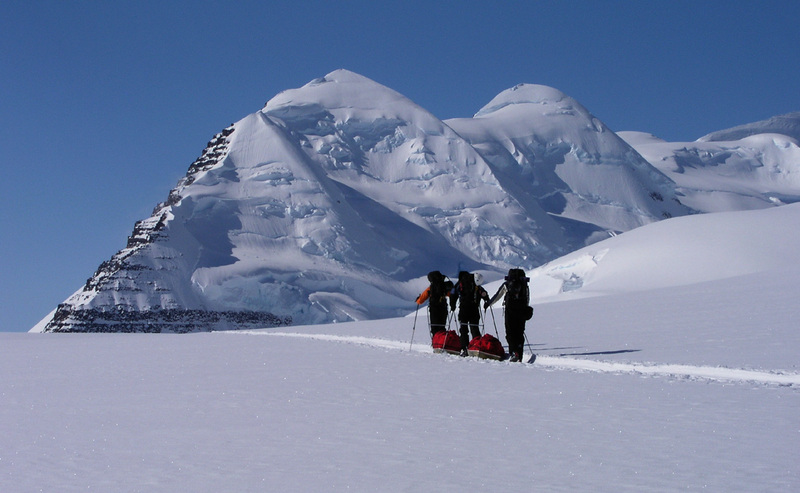 A gentle downhill followed across a pretty large glacier, our course being set just north of Cone. 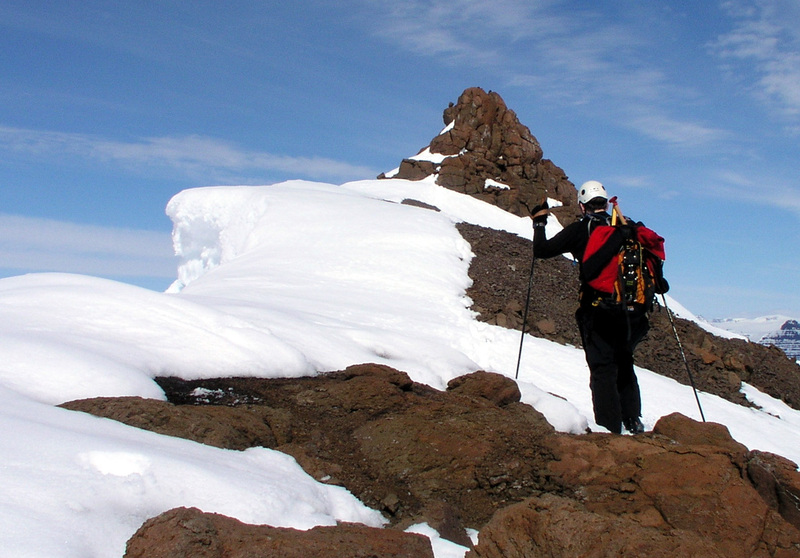 We arrived at the north-west ridge of Cone, elevation 3264 meter, north 68:52.743, west 029:57.581. 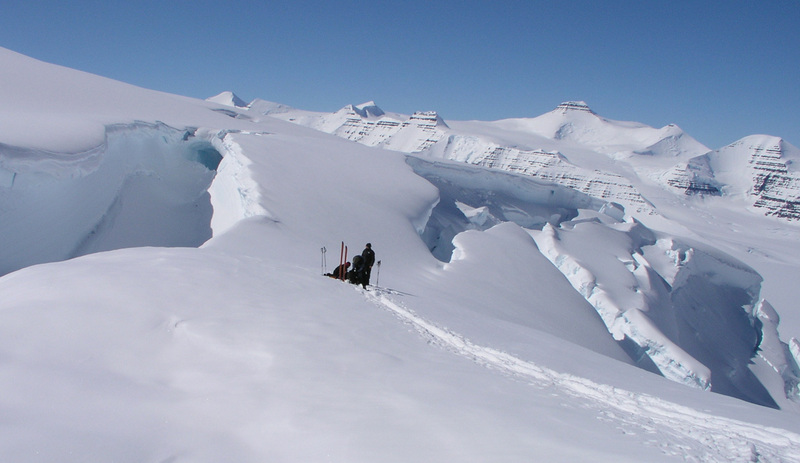 It was not hard to cross the ridge at this point, then very good skiing across the glacier that is situated north-west of Cone, between it and our target point 3603. 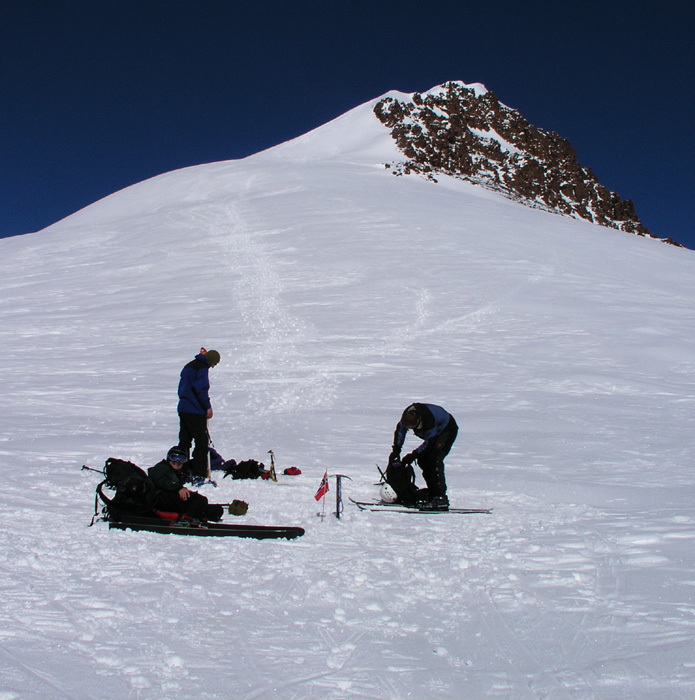 Our skiing brought us easily up on the lower part of the north ridge of our mountain to a point at elevation 3309 meter, north 68:52.346, west 030:00.401. At this point it should be noted that our peak is 3503 meter, not 3603 as stated on our map. We did not realize this error until after our return to Base Camp upon a closer inspection of the map and carefully counting contour lines. This summit is pretty much exactly 30 degrees west. 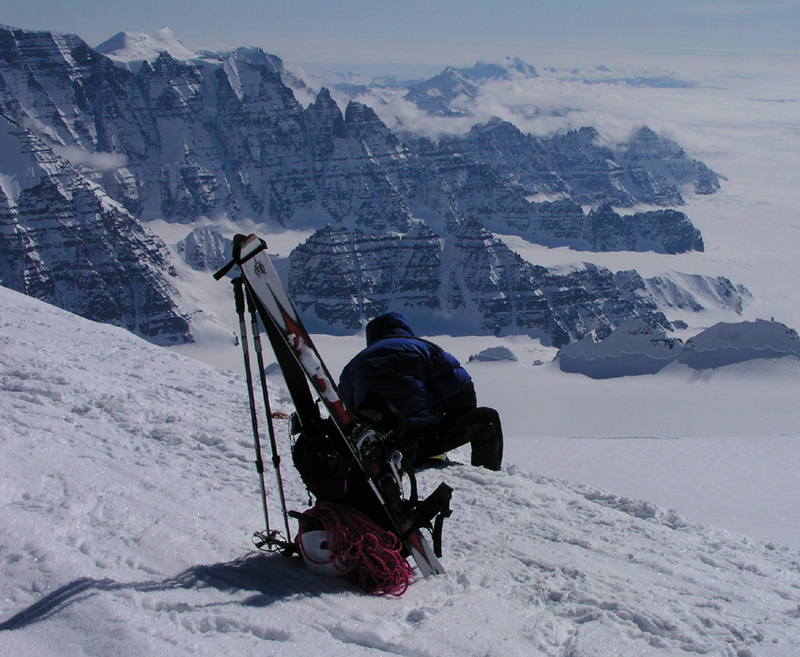 We could have continued up the ridge on skis, however, having skied a long way and not knowing what challenges the ridge might offer, we left the skis and most equipment including our climbing rope at this spot. The ridge did look quite easy and according to the map it should never get really spooky. 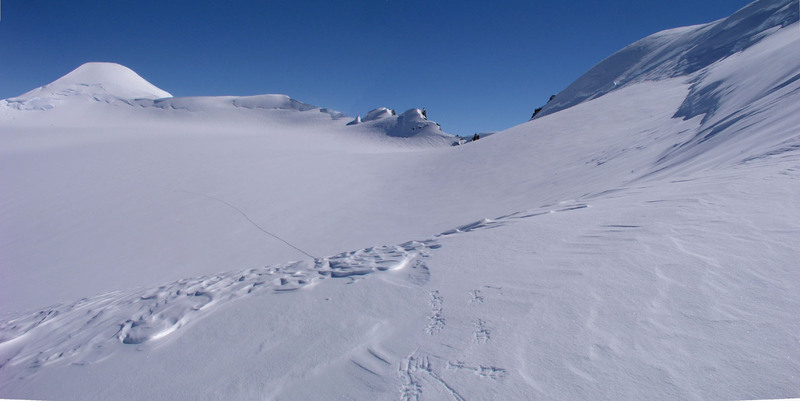 We used crampons and encountered no difficulties while ascending about 200 vertical meter. However, the last 50 meter to the summit were quite interesting. 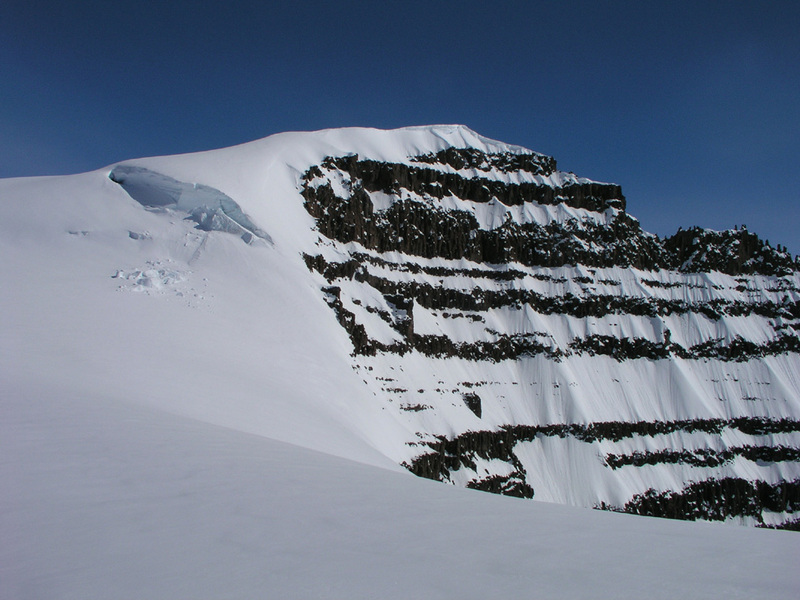 The ridge does narrow, and a vertical cliff appears on your right (west) side. 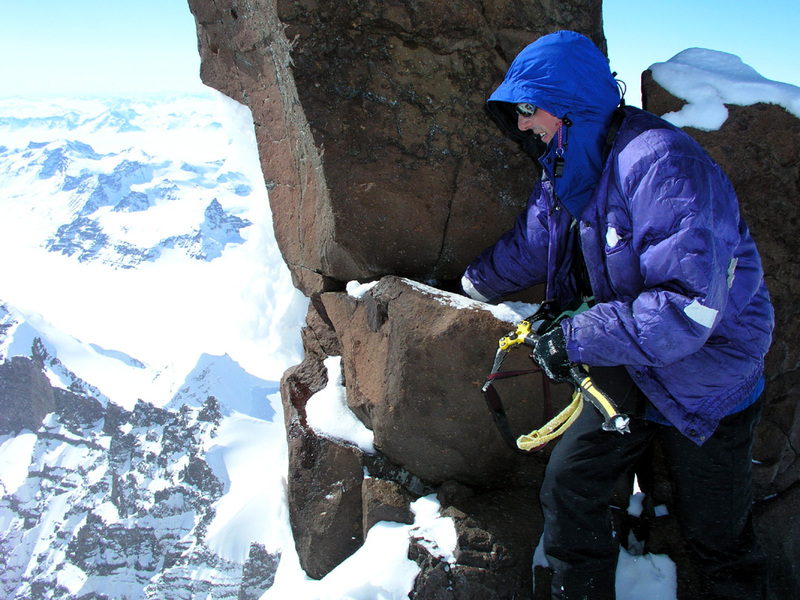 As you approach the summit you realize that there are two single blocks of rock at the summit. These pieces of rock, each about 4 meter tall, stand there on the very edge, partly leaning out over an incredible void. The glaciers below are 1800 vertical meter down. The whole rock formation with this gigantic cliffs on two sides created a very strong updraft that whistled and served as a constant reminder that this was indeed a place where one should move around with considerable care. A totally unreal experience to look out like through a window on jagged peaks incredibly much lower. Should one try to climb on top of these horns? The rightmost had some small flat footholds and cracks suitable for climbing. What if the whole piece would just break loose and disappear into open space? Extremely unlikely, but maybe nobody had ever tested it. Without a rope, there was really no option, but to take a few steps up as high as absolutely safe, not quite holding your hand above it, but fairly close. My thoughts go to the peak Sunlight among the Colorado Fourteeners. To me, it seemed absolutely clear that you did not really climb that peak unless you scrambled the last ten meters to its very top. This felt different, I think both Ståle and I felt we had indeed climbed the peak even if we did not stand (or sit) on top of these insane horns. In any event, it is a fine point and I do recommend that the next party headed this way do bring their rope to the very summit. Make a bomb-proof belay and enjoy a very exposed position. After a summit experience second to none, the time had come to start descending. Ståle first, while I captured the panoramic view of an almost uncountable number of peaks further west. 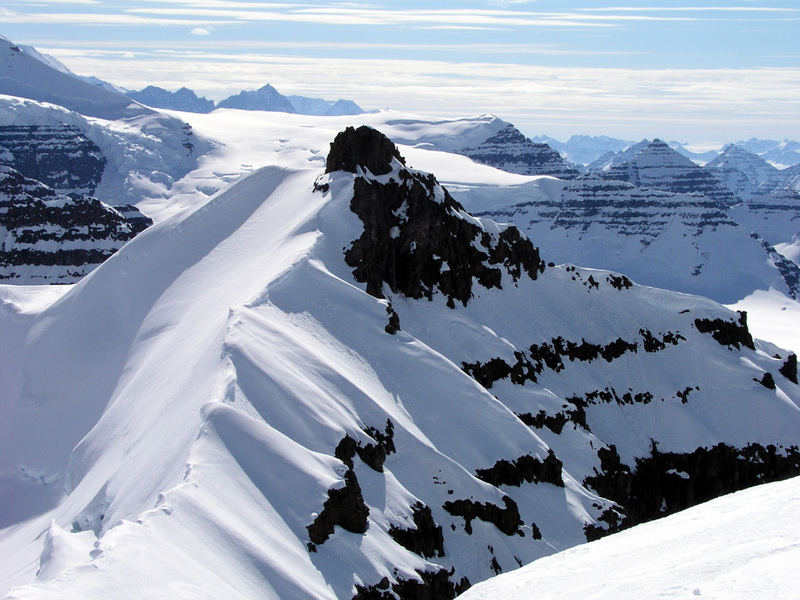 Fantastic weather, exotic glaciers, our lone ski track the only trace of life. Our trip totalled more than 25 kilometer with a vertical ascent of 1700 meter. 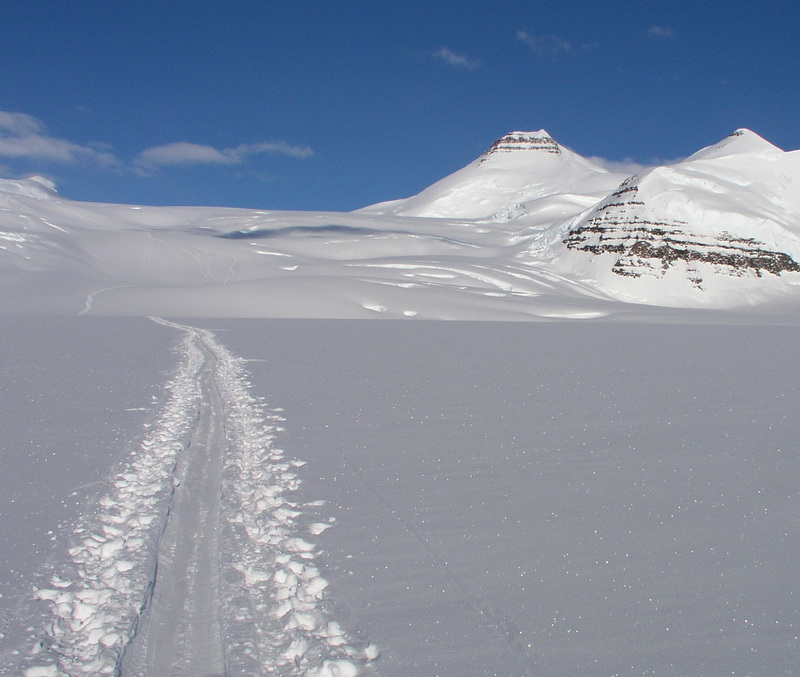 We returned to Base Camp after 10 hours, many thanks to Ståle for sharing with me one of my finest skitrips in the arctic. The views we had both west and north were just unbeliveable. They brought me thoughts to the first ascent party of Gunnbjørnsfjeld in 1933. They came up Christian IV Gletscher, we also had a nice view directly down to the long and more narrow glacier called Korridoren. 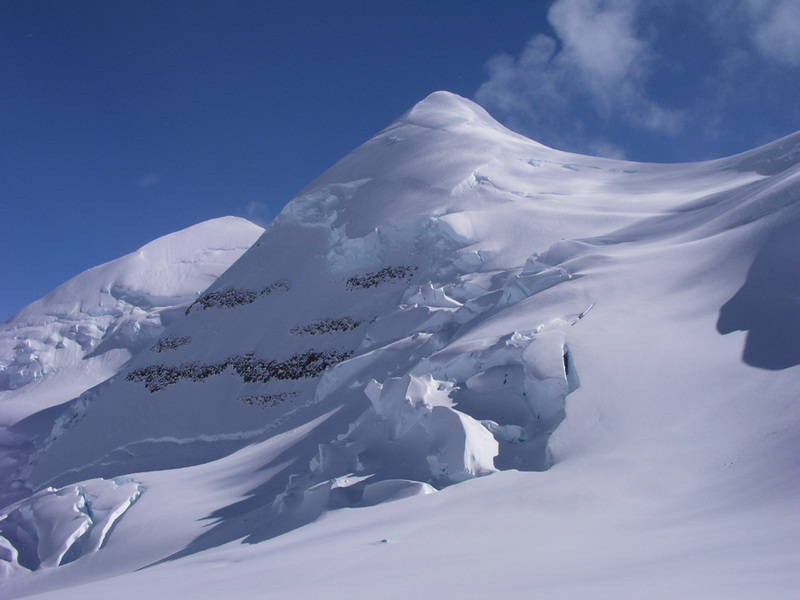 We named this peak Styggehorn (ugly horns) after the very characteristic summit. 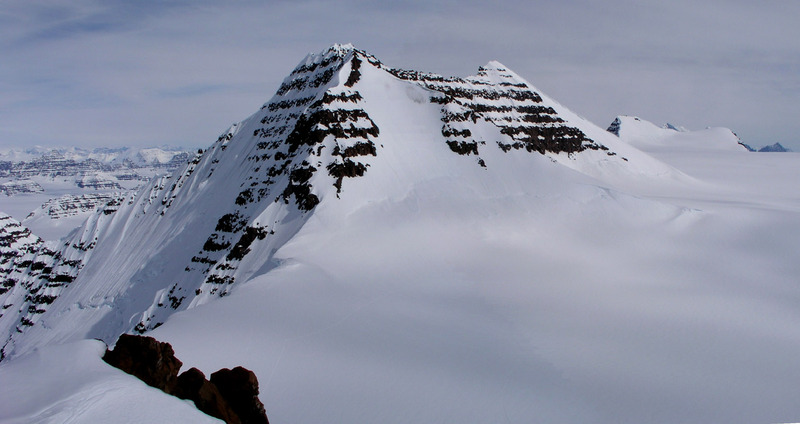 The immediate disappointment when learning that the peak was indeed 100 meter lower than its map height, quickly faded as we realized that we still may have completed a first ascent of the highest unclimbed peak in the arctic. Arnt had completed his ascent of 3535 without any incidents and safely returned to Base Camp. His peak may be the 7th. highest on Greenland. I changed a new 256 Mb memory card into my digital camera today. Today, the Tromsø group is leaving and a new group from Tangent (Paul Walker's company) is due to arrive. The Tromsø group decided to have their logistics taken care of by Paul W. Clearly, convenient, but at a significant expense compared to our budget. As things turned out, we probabely would not have saved a lot by coordinating our trip with Tromsø. 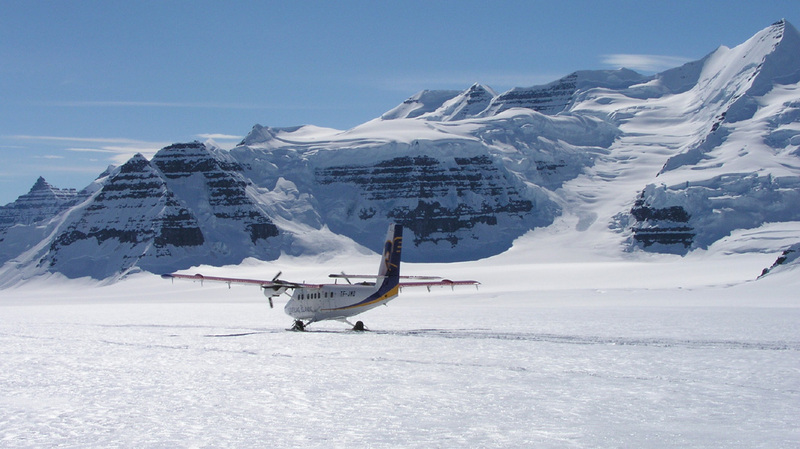 The key to cutting cost on this kind of trip is to find some other party that can help utilize the Twin Otter better. We have the luxury of paying for two empty flights, the upside being that we are completely independent and can ask the pilot to pick us up anywhere without regard for where an incoming party would like to land. Even with this expense our trip is significantly cheaper for the participants than what a commercial operator like Paul W. offers. I shall inform the captain on the Twin Otter about our pickup point. We want to move into what hopefully is an unexplored area for the rest of our trip. Thus, an advantage not having to return back to Gunnbjørnfjeld Base Camp. 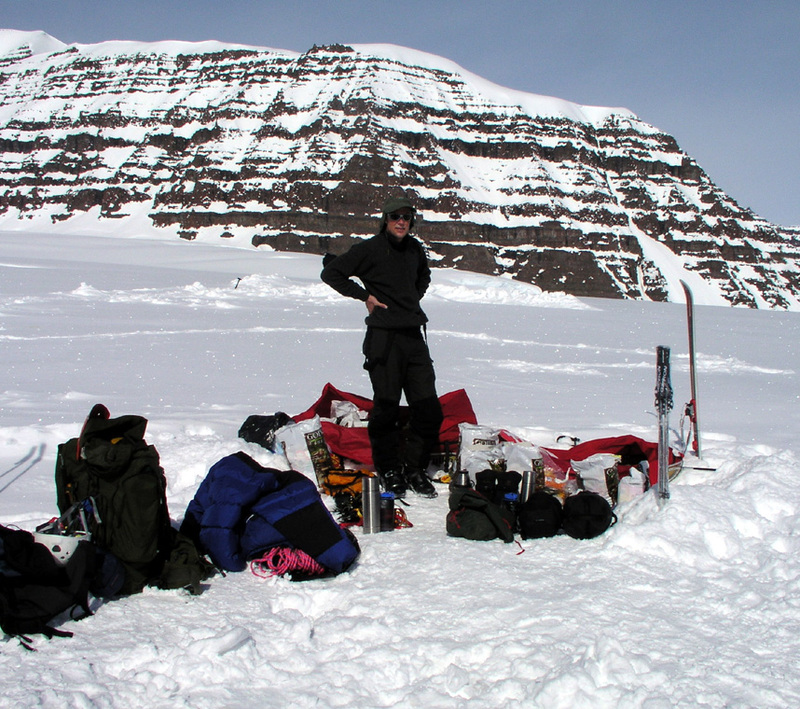 We have had a team meeting discussing where to be picked up, I sort of favored a point fairly high up on the glacier that we intend to ski to. 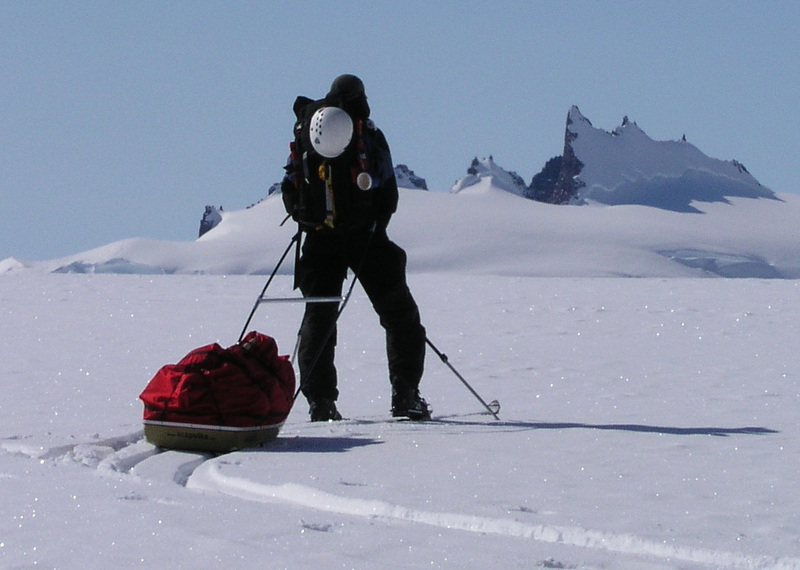 A majority wanted the pickup coordinates to be further down on the bigger, main glacier. This will mean that we shall move camp an extra time, however, the skiing down to this location is likely to be very easy, so this is not an important issue. We therefore decide on the lower pickup point, coordinates approximately north 68:59, west 29:20. Bad news! Here comes wind and clouds, preventing the Twin Otter from making any pickup here today. We discussed briefly whether we should leave the pickup coordinates with the Tromsø team and start out without waiting for the airplane. Initially, I seriously saw this as an option, however, it became pretty clear that my team wanted to wait for the airplane. Several arguments added up to make this the most sensible thing to do. Perhaps most importantly, the Tromsø team was reluctant to act as an intermediate link in our communication with the captain on the airplane. I can see this point. We could always just call Fridrik with our pickup location, that had been agreed before our departure. However, our satelite phone was not at all living up to expectations, consuming a full battery for each call to be made. We had asked Fridrik to send us a box of biscuits, it seemed that the need for this was less acute now than a few days earlier. There was really no sense of urgency, we were all enjoying Greenland to the fullest, most important goals already accomplished. The next week would be a bonus week in all respects. Thus, the decision to wait an extra day was not hard. If the weather improves, the flight should be here around 1200, noon. 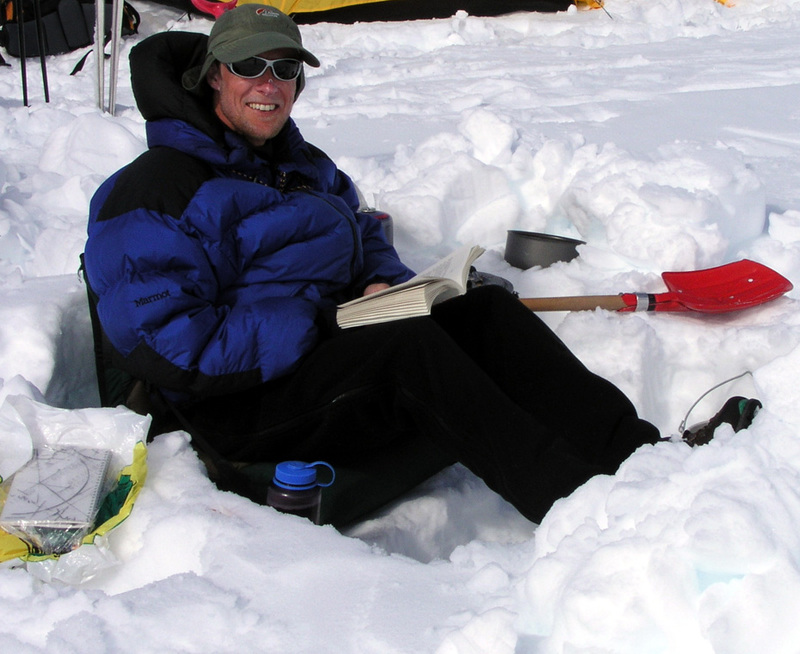 A quiet day, I finished reading the book by Anatoli Boukreev on the fatal Everest expedition of 1996. Today, we shall depart for the exploration of new land. The Twin Otter came as expected shortly before 1200. I agreed with the captain on our pickup point on May 31. We borrowed an MSR burner from the Tromsø team in order to make up for the one that is broken. They also generously donated us a DryTech dinner, thus we are back to having a dinner for each day plus the pancake reserve. The airplane failed to bring us our promised box with biscuits, never mind, the team does not seem to think that this is quite so important any more. Getting used to burning off a bit of fat reserves. The team spirit is good and we are all eager to move away from this area into an area where we may have first ascent opportunities. We departed at 1230. Per Ove and I are pulling the sledges, while we named Ståle chief glacier and crevasse navigator. 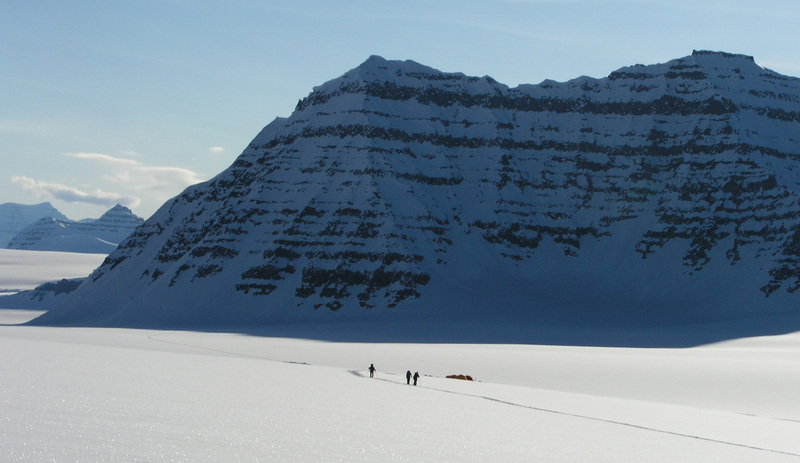 We needed to cross the big Woolley glacier that originates on the high plateau behind Skitoppen as seen from our Base Camp. This is also the area where the 4th. and 5th. 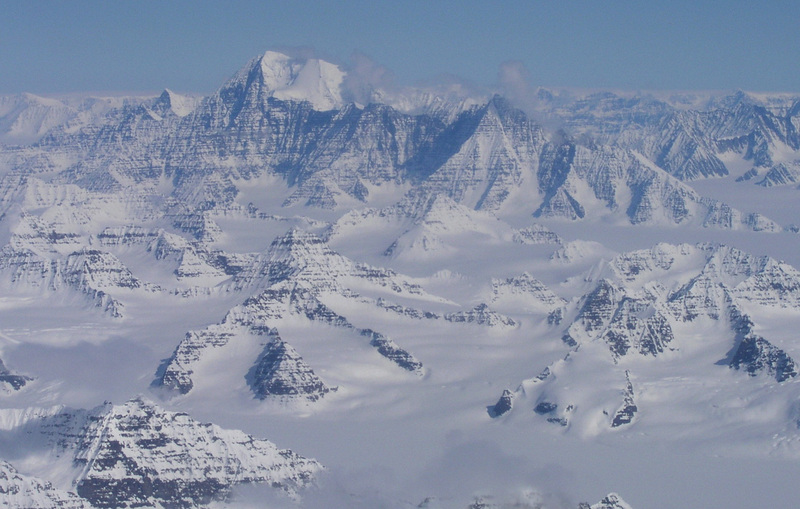 highest peaks in Greenland are located. 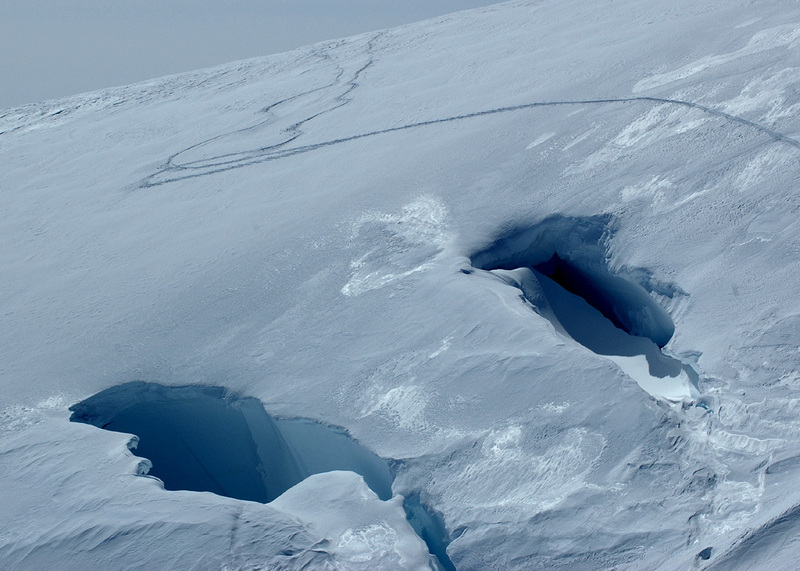 Even the map indicates that there are serious crevasses on this glacier, a question remained how high we needed to cross, or if an option had been to try a big arc to the north-west in order to avoid them. That would have gotten us even lower, it seemed like the safest option to try a more or less direct crossing, going higher (south) whenever we ran into problems. The first part was easy, gentle downhill. 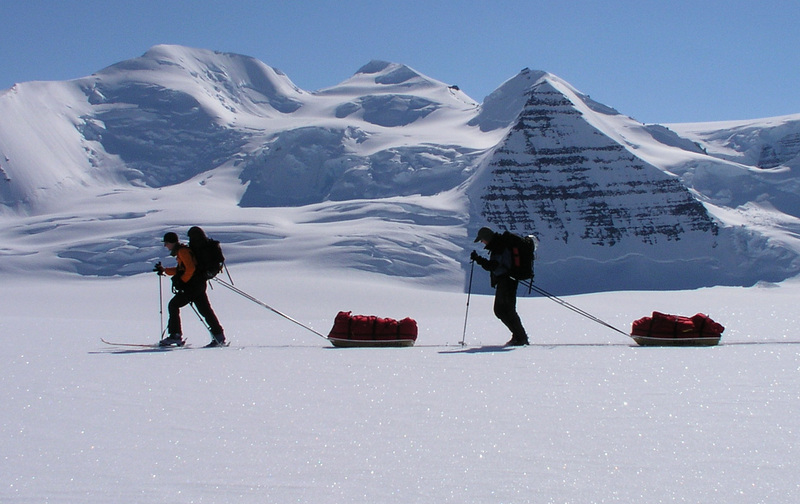 As soon as we started the crossing, we roped up before proceeding with Ståle first, the two sledges last on the rope. 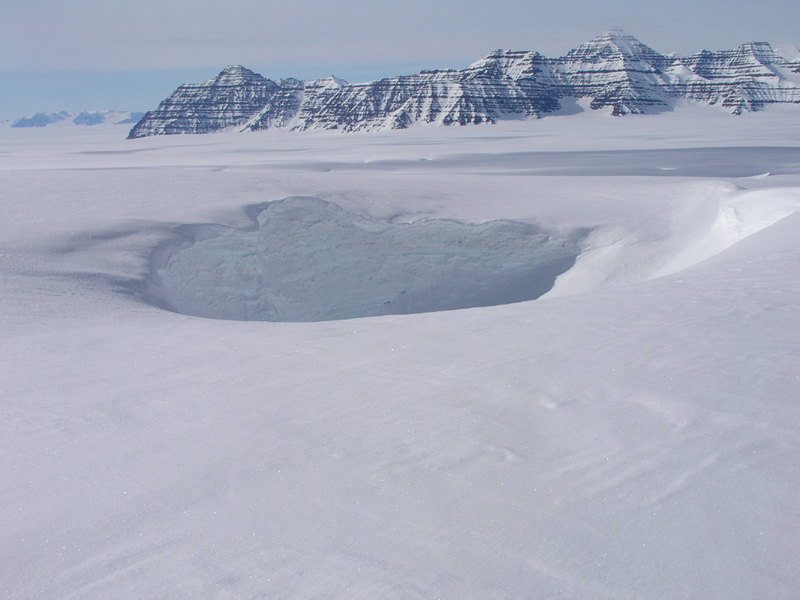 After several hours, the first crevasse came into view. Gigantic and open, running exactly perpendicular to our course. We turned a right angle and proceeded up the glacier parallel to the crevasse. 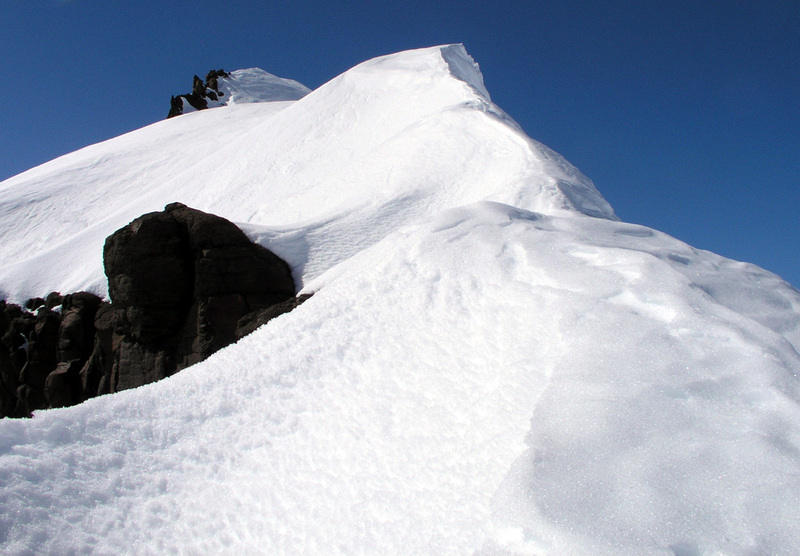 We finally located a snow bridge that looked solid at elevation 1926 meter, north 68:58.715, west 29:34.874. 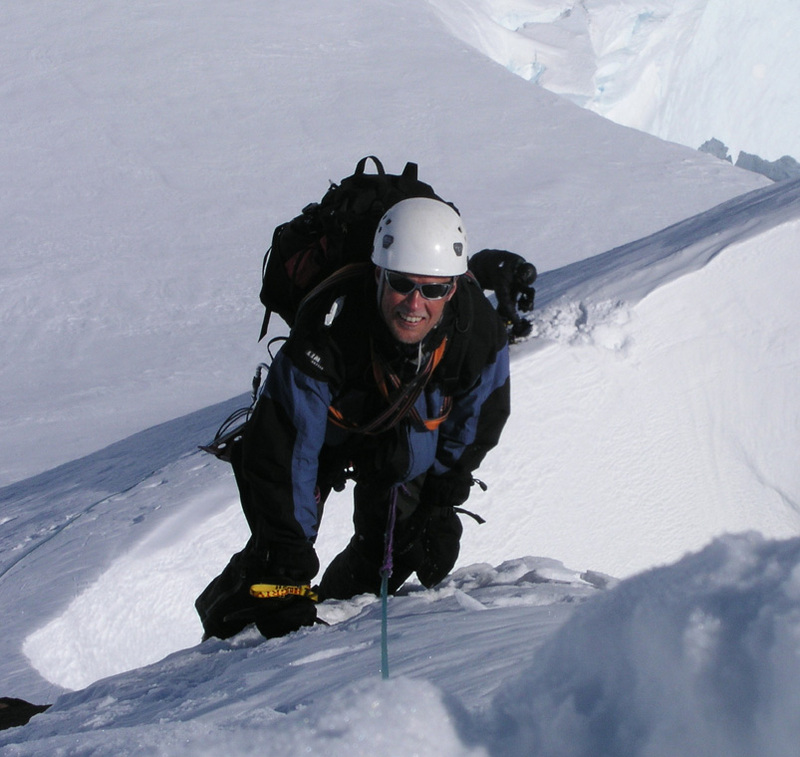 Jan-Frode looked at the deep crevasse as we crossed the snowbridge and said: "This crevasse can eat a (roped) team", expressing the fact that one should be careful even when roped. Back home a member of a team can go through a crevasse, here the crevasse was so wide that at least two would be on the snowbridge simultaneously. 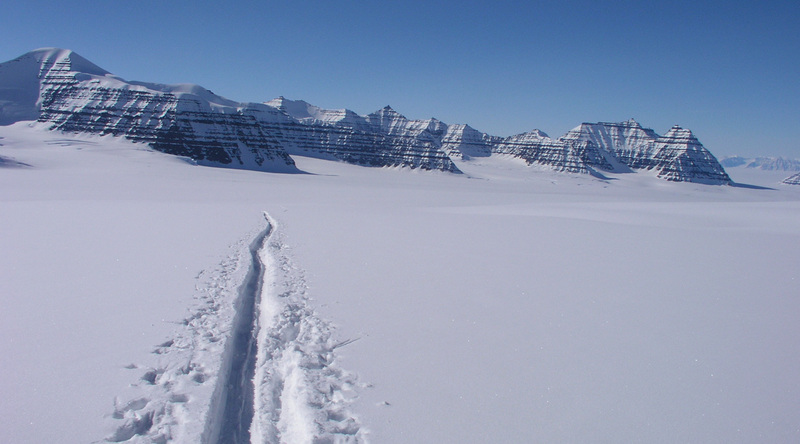 We encountered more crevasses parallel to the first one, all very long and very deep and wide. This made us ski more south, but finally the last one was history and we could turn more on north in order to get back on our route. 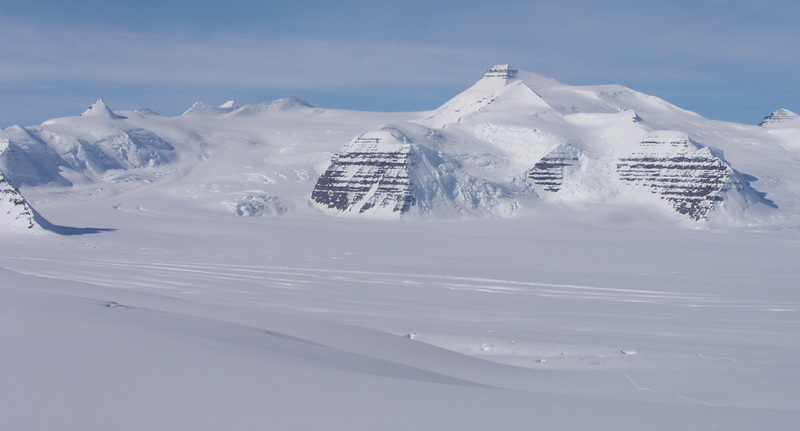 The terrain here was a bit more confused with various crevasses, small hills and depressions all glacier. Ståle did a fine job navigating us safely across. We arrived at the slope that would bring us over a saddle and into new terrain around 1900. 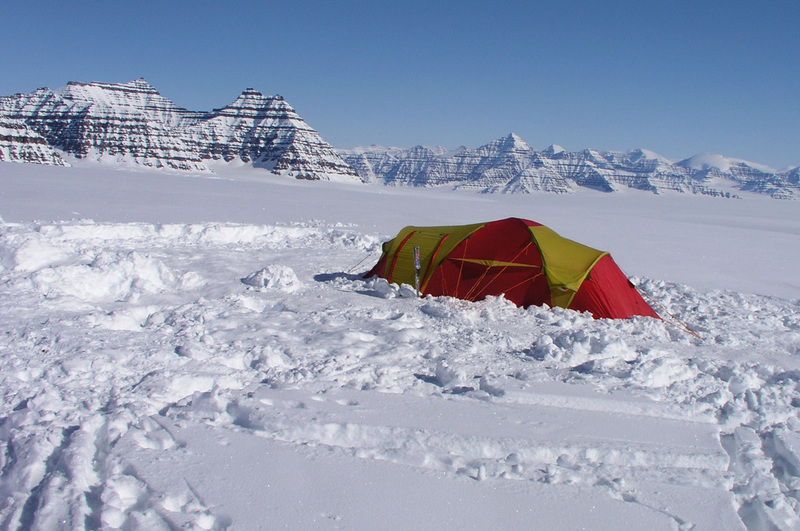 It was time for camp, we all felt this had been an interesting day, small humans crossing in a giant sea of ice. The evening was beautiful, sunshine, warmer temperature and no wind. 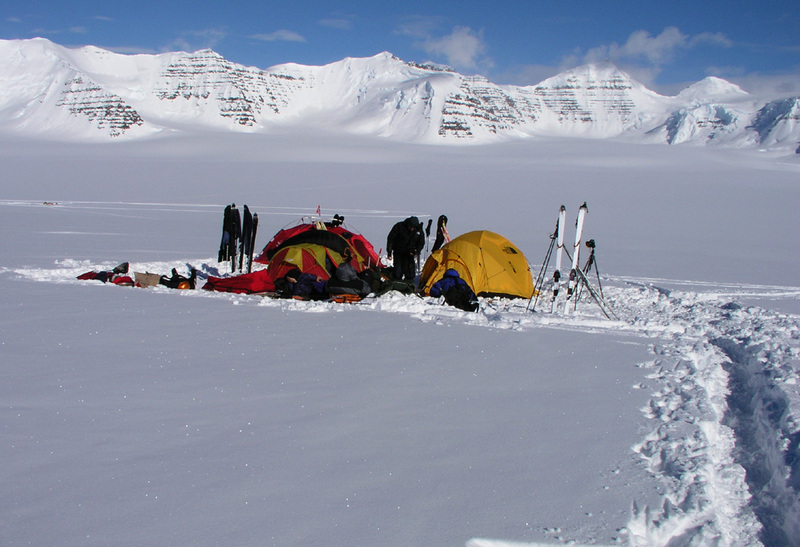 Our camp is at elevation 1841 meter, north 69:00.244, west 29:32.226, our first visit north of 69 degrees. The dinner tasted better than ever, we had a long chat as evening arrived, until 2300 when we finally hit the tents for some well deserved sleep. We woke up to sunshine and no wind, it is definitely a different climate, much warmer. The views of the hanging ice on the mountain above us is fascinating. We soon started up the hill, pulling the sledges is hard work when the terrain slopes. Arnt was up in front breaking trail and making sure that his track did not get too steep for the rest of the party. A final look back saying goodbye to Hvitserk and the landscape we know well, then continue into new land. As we reached the crest of the hill a new landscape with good looking mountains came into view. We decided to stop at the highest point and explore the nearby peaks before moving on. 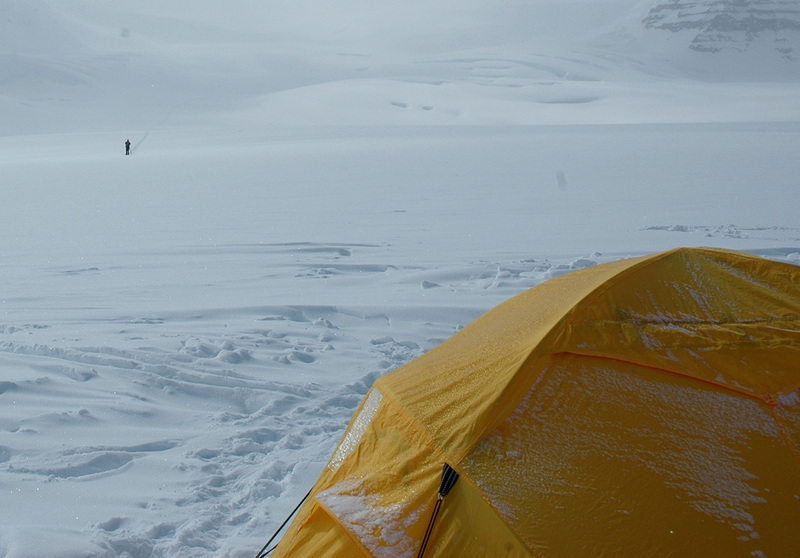 Thus, we made camp at elevation 2081 meter, north 69:00.603, west 29.26.777. Yesterday, the GPS seemed utterly confused with respect to sunrise and sunset. Today, the GPS claims that there are no sunsets or sunrise. Most likely, this means that the midnight sun has arrived. By chance, this also has changed the temperature here from full winter, minus 20/30 Centigrade to full spring with temperature around or even above zero Centigrade. 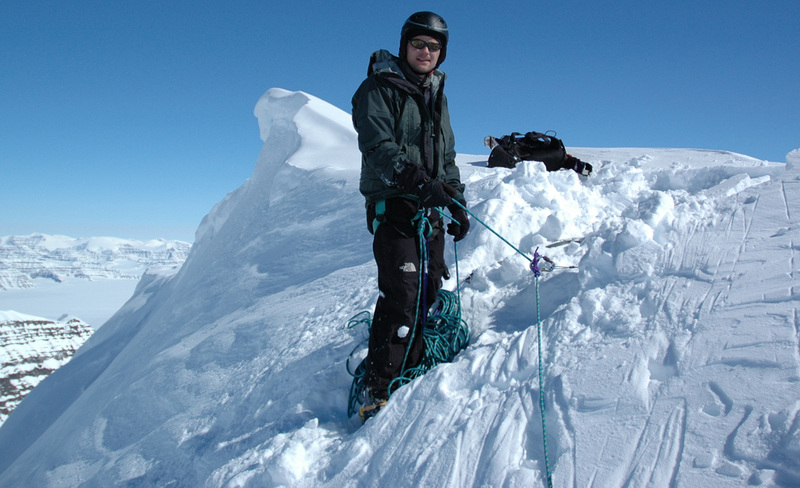 Per Ove and Torstein started out to climb a very beautiful peak nearby, however, the snow seemed unstable and they did not get to the summit. Meanwhile, Arnt and I went up a valley that climbed more steeply to a nice saddle between two peaks. The righthand peak is the highest, but the ridge coming down to the saddle turned out to be very difficult. We set course for the peak to the left, this involved a fairly steep initial snow slope from the saddle, then more gentle terrain to the summit. Arnt named the peak Brekruna (Crown of the Glacier), the map gives an elevation of 2824 meter. Our GPS gave an elevation of 2815 meter, north 68:58.186, west 29:26.830. We wondered if this was indeed a first ascent. 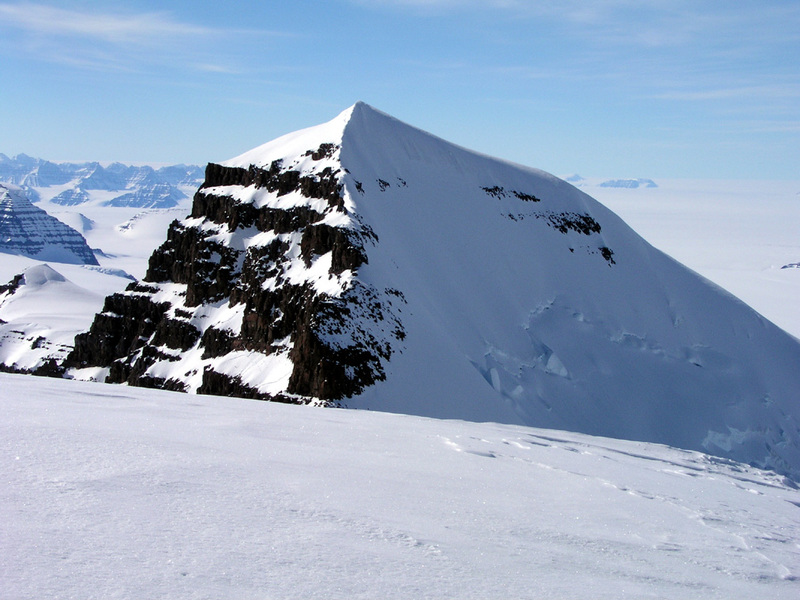 Later, Paul Walker has informed me that a Tangent party climbed this peak, however no further details are known at this time. 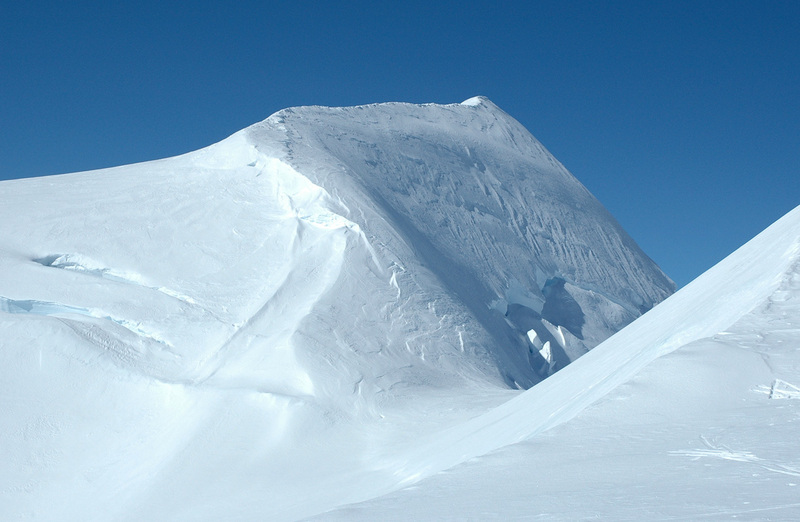 The peak across the saddle is marked at 2868 meter, it looks pretty hard, at least from this side. 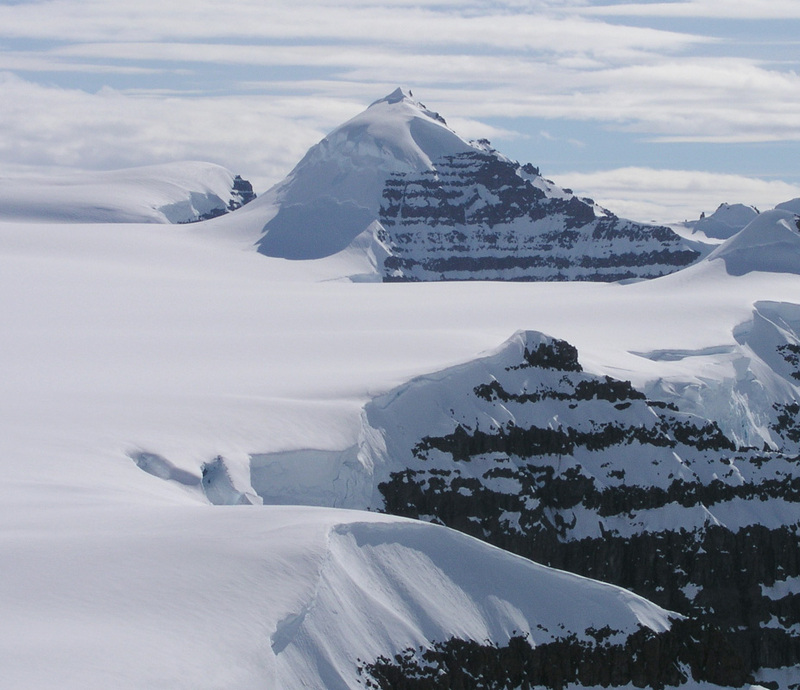 The map has a saddle elevation of 2613 meter, giving Brekruna a primary factor of 211 meter. 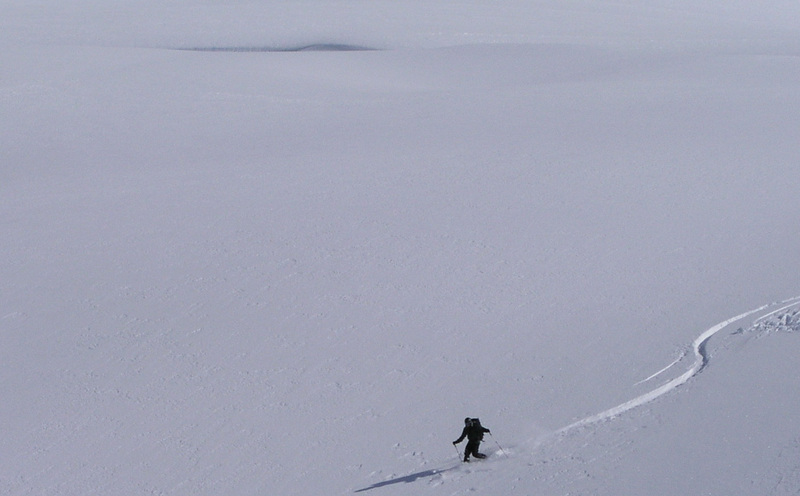 It took us 4 hours from our camp and up, only 35 minutes return, close to perfect skiing. Brekruna has a very nice view, the peaks further south and around the Woolley Glacier are spectacular to see from this position. Our GPS reading from the saddle gave an elevation of 2605 meter and location north 68:58.425, west 29:27.514, that is, the elevation seems consistently about 8 meter low relative to the map in this area. Everybody enjoys the possibility of sitting outside now that the climate has turned warmer. Torstein shows real team responsibility by digging good sitting areas. A good day came to a close. Moving day, to Bergen Gletscher. This morning, Per Ove and Torstein started out at 0500 in order to make a second attempt on the peak they turned on yesterday. 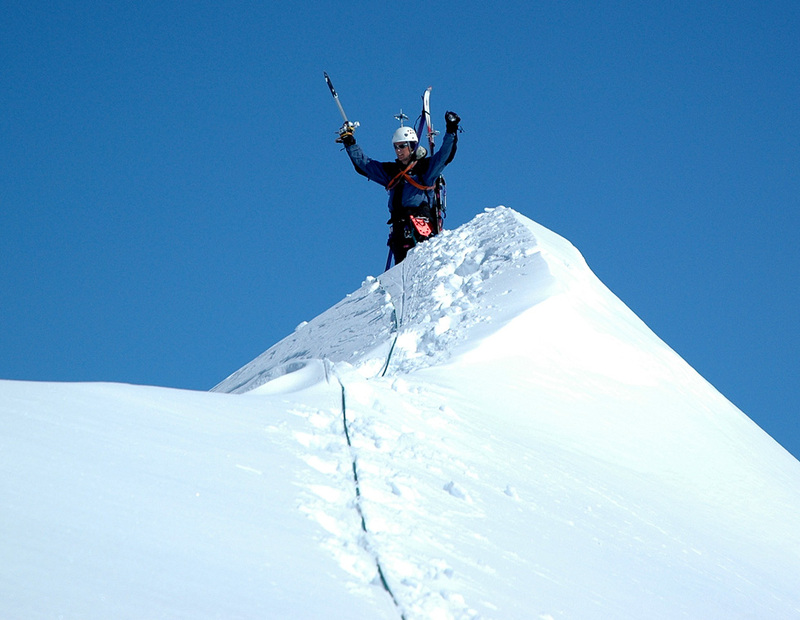 With morning snow, they successfully climbed it, reaching the summit at 0655, a first ascent and a very beautiful peak. 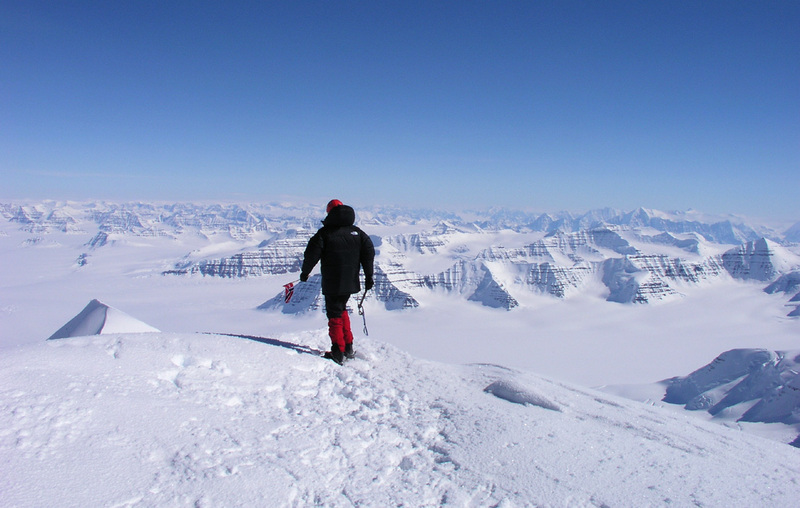 They went on to climb Brekruna, Ståle joined them and they all marveled of the fine summit views. The skiing back down had been most enjoyable, Per Ove caught a great picture of Torstein skiing down across a snowbridge from the saddle. Meanwhile, Jan-Frode, Arnt and I explored a rather small mountain that is located in the opposite direction from our camp. This mostly snow covered mountain had elevation 2255 meter, location north 69:01.739, west 029:25.618. We discovered a cairn on this mountain, somebody visited here, but when? We speculated that this cairn may have been built by a party coming up from Ejnar Mikkelsens Fjeld on the way to Gunnbjørnfjeld. Arnt did not seem too happy today, most likely this is just a temporary state, his good sense of humor and interesting remarks shall soon return. We broke camp and continued our move at 1400. Ståle and I pulling the sledges. First, a gentle downhill, then a very long, almost endless gradual uphill. There is no wind, the sun is baking, the heat is very strong, summer in Greenland. After deciding on the place to camp, Torstein came skiing back down the slope to ask Ståle or me if he should pull one of the sledges the last hill. We thanked him, but insisted on completing the job. He did succeed to take some weight from Ståle and generally helped keep morale high. This is Torstein in a nutshell, we all knew he had some trouble with his neck and back, but still his concern was immediately to ski back down and see if he could help. 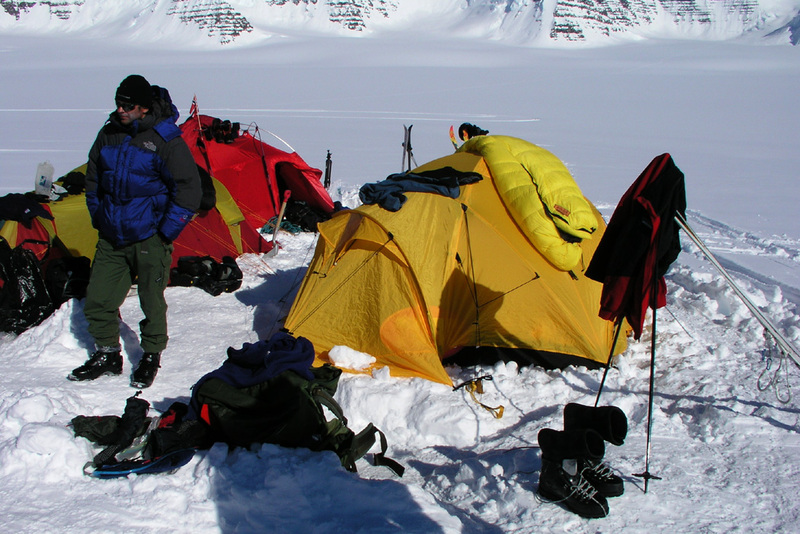 We establish camp at elevation 2191 meter, location north 68:59.509, west 29:10.782. There seems to be plenty to do in the next three days. 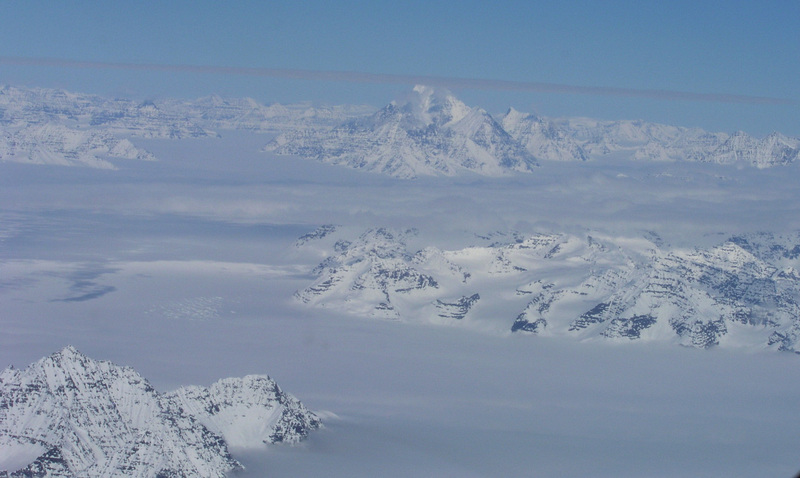 The glacier has peaks all around. Hopefully, we are now in a virgin area where no previous expedition has visited. The day ended in a spendid evening, we sat outside the tents until 2200. Istind prevails, Ebeth is skied. We all started out up the glacier towards the peak we already named Istind. 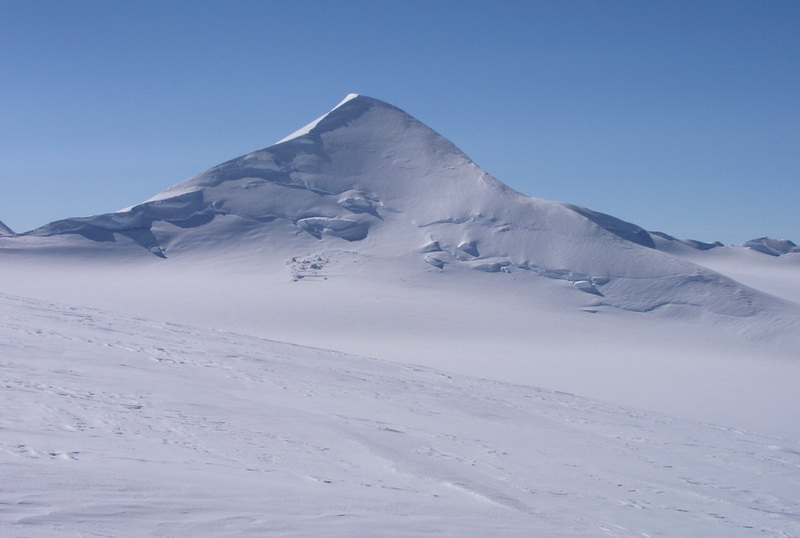 It is the most prominent peak here with a somewhat unusual shape, steep lower down, then a summit that points to the sky. 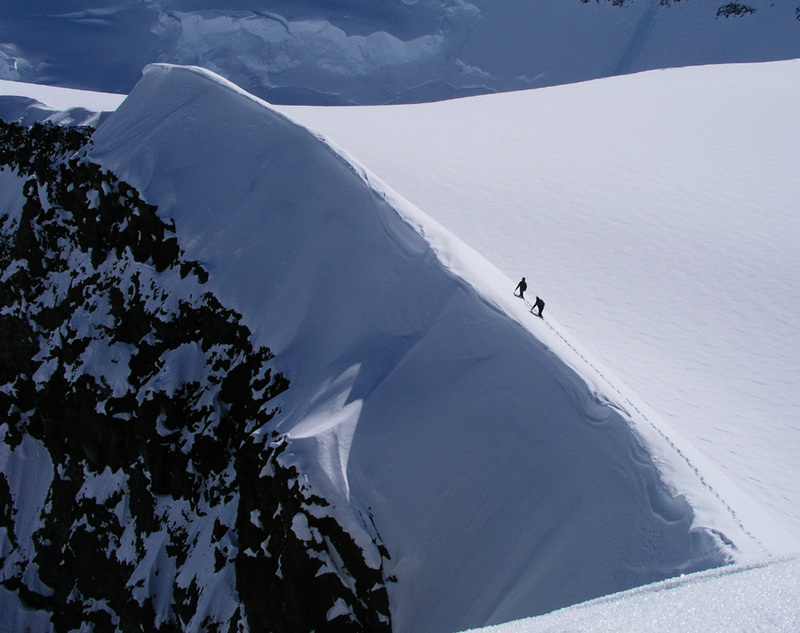 All ice forming the slopes, an impressive and attractive goal. Istind is 2675 meter, the map is way off with an elevation of 2875 meter. 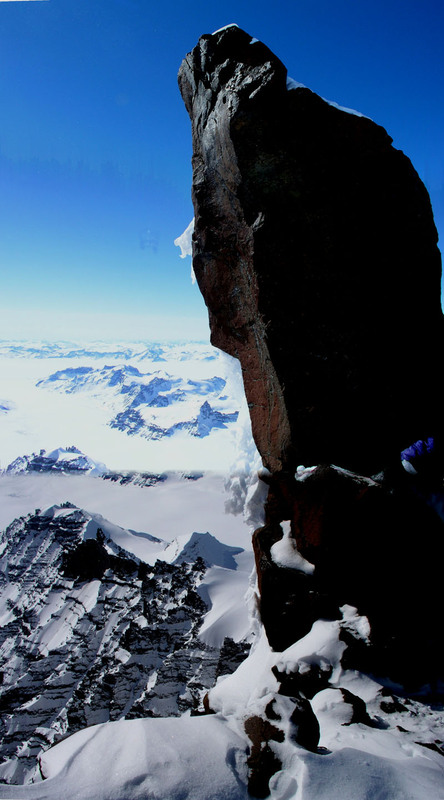 Again, we did not really realize this until Per Ove and Jan-Frode actually climbed the peak. 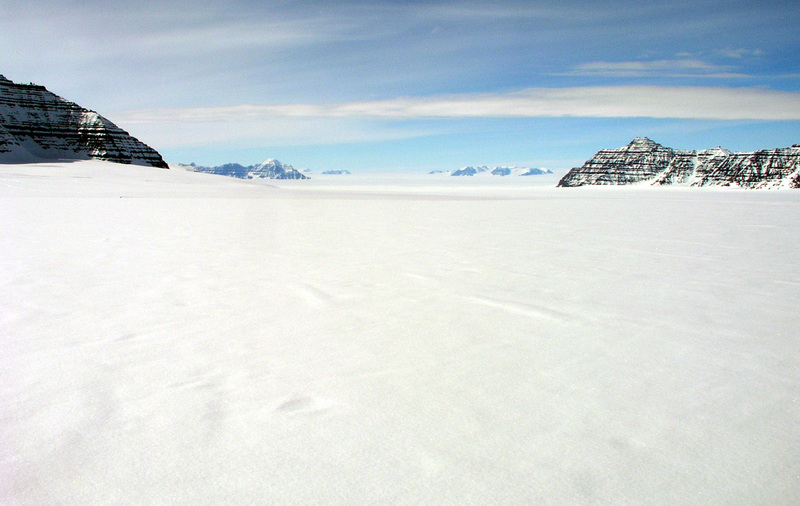 We reached the saddle between Ebeth and Istind, this is really where our glacier ends. A steep drop to the much lower terrain nearer to Ejnar Mikkelsen Fjeld. Torstein, Per Ove and I started out on Istind. Our plan was to climb from the side onto the east ridge higher up, then hopefully follow this ridge until the mountain slope became less steep higher up. 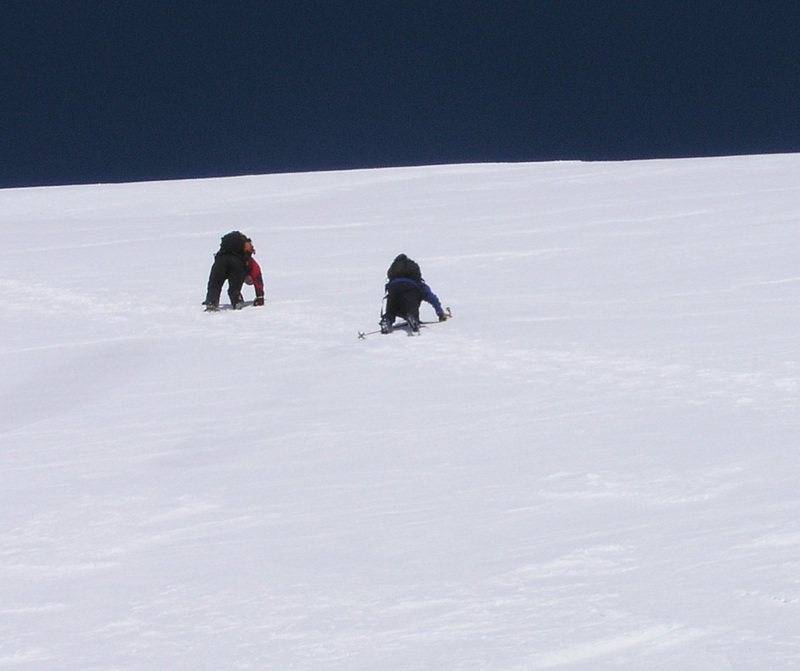 The snow was hard and steep, much steeper than anything done so far. Per Ove first climbed to the ridge and stopped in a small notch. Torstein followed and soon joined him. 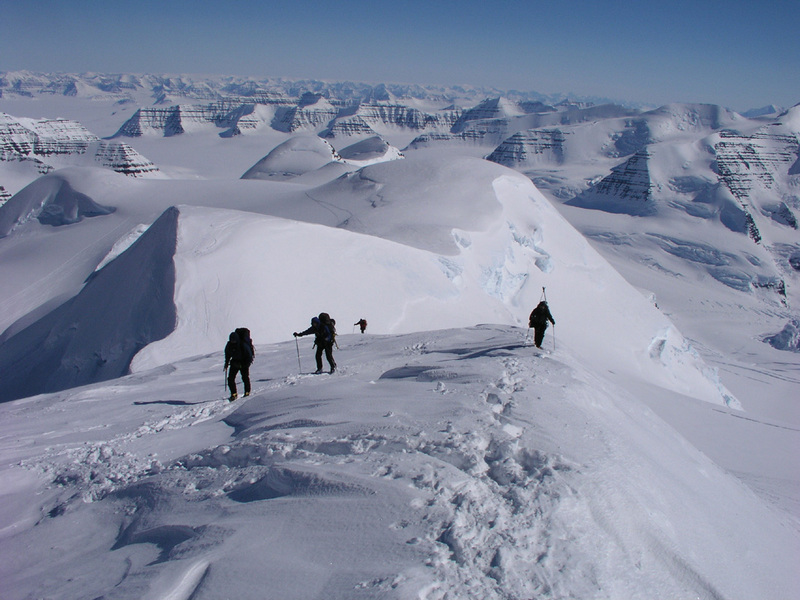 I was third and instead of traversing to the ridge, Torstein suggested that I continue straight up to the ridge somewhat higher, then climb this to the horizon where we could see some rocks. The ridge had a very big drop into unfriendly terrain off to the left. I passed some rocks where an intermediate sling could be attached, then continued to what looked like a flat area higher on the ridge. 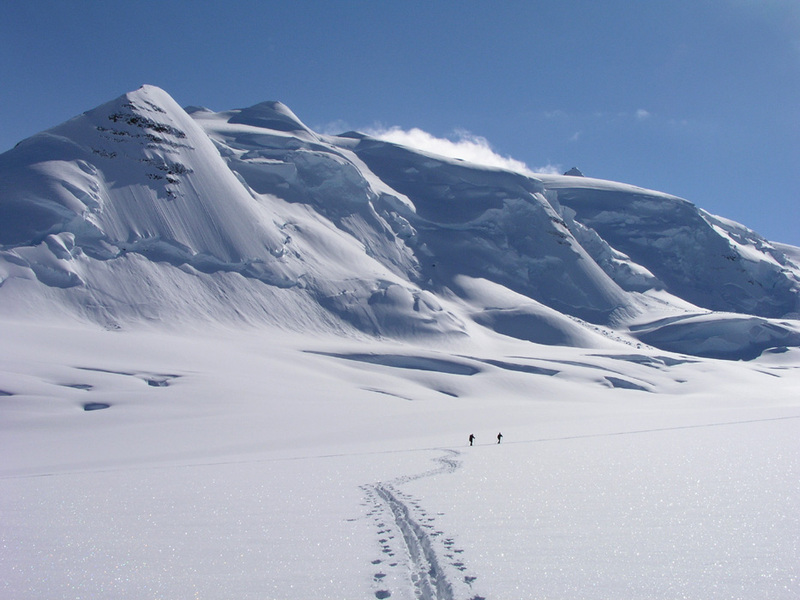 I had good hopes that the route from there would be somewhat easier until we would join a much broader snowfield higher up. Big disappointment! I reached the flat spot, it was about one by two meter, but the continued ridge looked very bad indeed (much worse than what the picture shows). 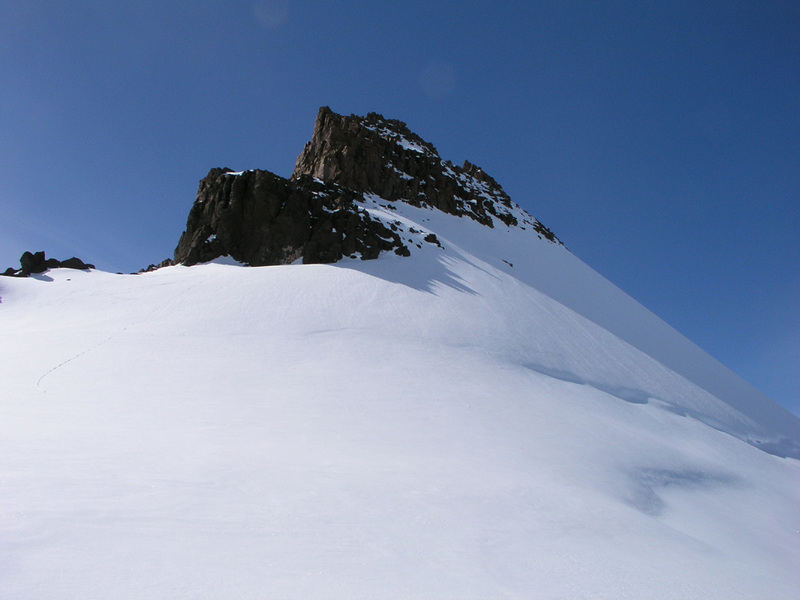 The sun had warmed the snow, the ridge itself looked unstable as it continued above this phenomenal cliffs dropping hundreds of meter to the left. Staying right seemed like the only safe option, but here the snow formed a vertical wall. I called down to the notch in order for the next man to start climbing. Torstein joined me and we did agree that this was not a very promising route. We reached 2526 meter, north 68:58.582, west 029:04.494. The view was already nice, but Istind won the first round. We downclimbed and headed across the saddle. 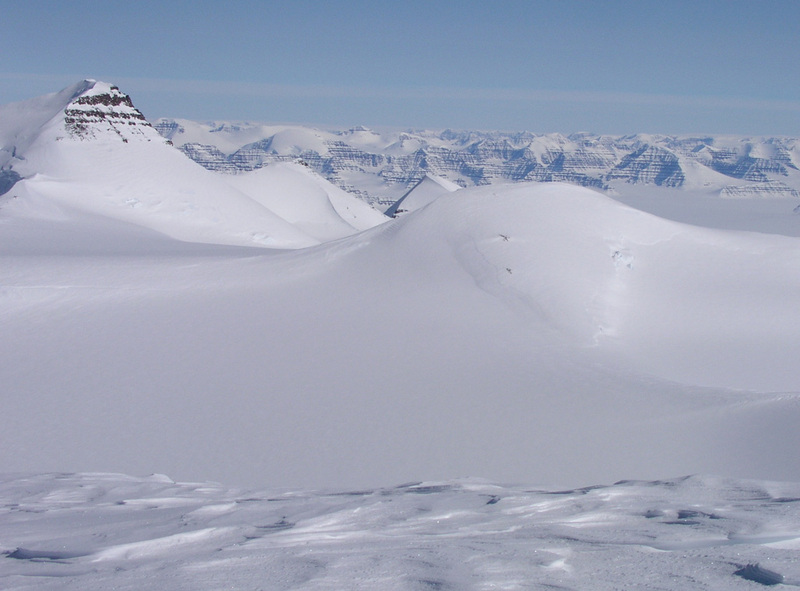 Meanwhile, Arnt and Ståle had explored a south-southeast ridge from Ebeth, reaching a very fine viewpoint at elevation 2595 meter, north 68:58.590, west 29:02.339. This point was separated from Ebeth by a saddle of elevation 2535 meter, thus havig a primary factor of about 60 meter. 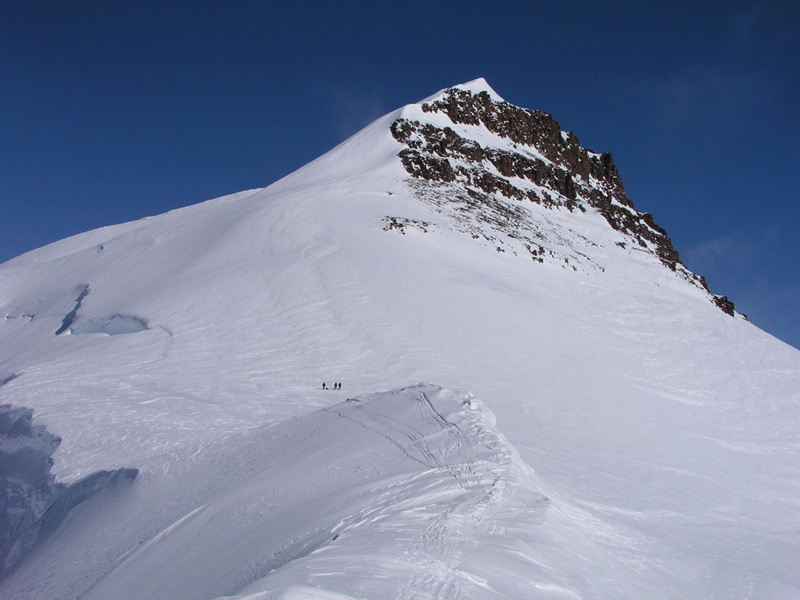 Our hectic activity continued, Jan-Frode and Arnt had already climbed the snow mountain we called Lille Snefjeld, elevation 2507 meter, separated from Ebeth by a saddle of 2393 meter. I headed over there and skied all the way to the summit. Looking at the nice landscape all around, I realized that several team members were now attempting Ebeth, a direct route near the left side of the slope facing Istind. 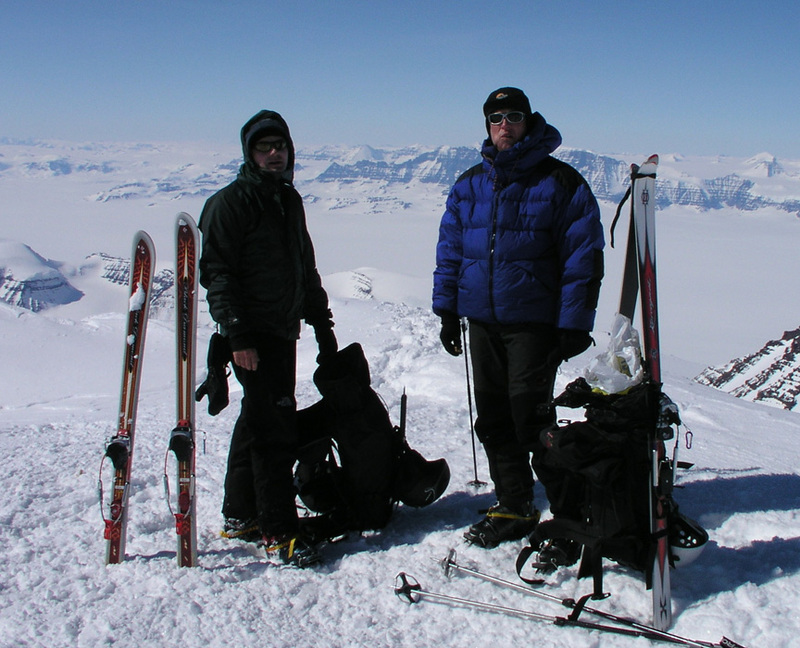 Arnt and Jan-Frode turned while Torstein and Per Ove made the summit, Per Ove with his skis on the back. Torstein measured Ebeth to 2641 meter (GPS), while our map gives 2628 meter. The summit is located at north 68:59.086, west 29:02.879. 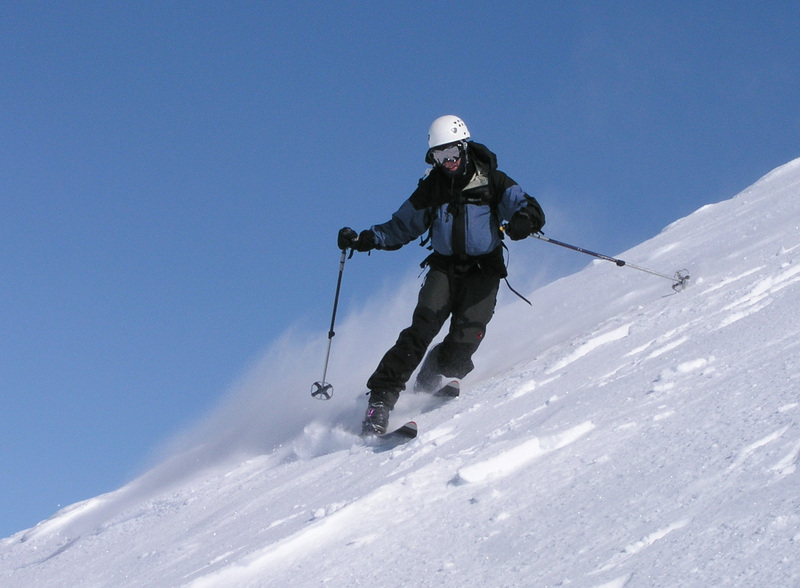 Per Ove proceeded to Telemark ski down the rather steep slope, while Torstein carefully climbed back down. 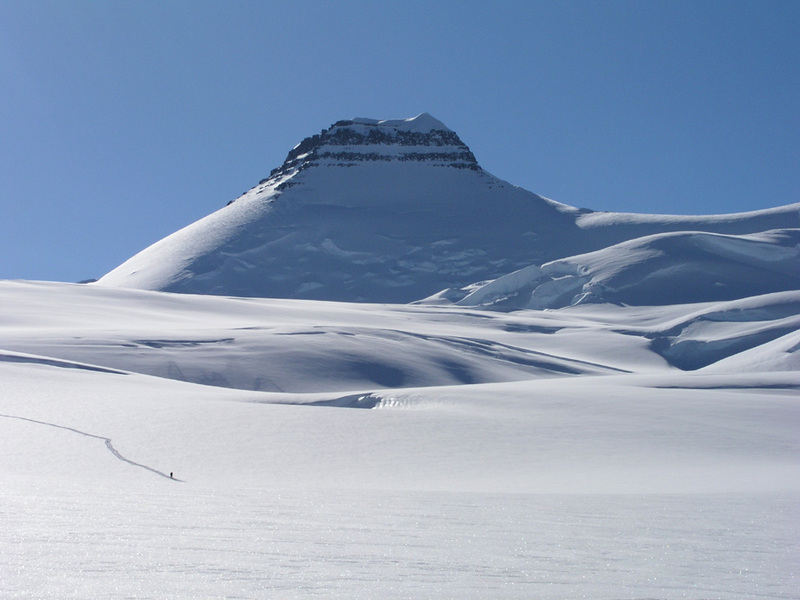 On the way back to Base Camp, Per Ove also skied down the steep side of Lille Snefjeld facing our camp. A long, nice day came to an end, we knew a lot more about the area. What had been a virgin, unvisited glacier mountain area just a day ago, now looked more like a ski resort, ski tracks crossing the area all over. 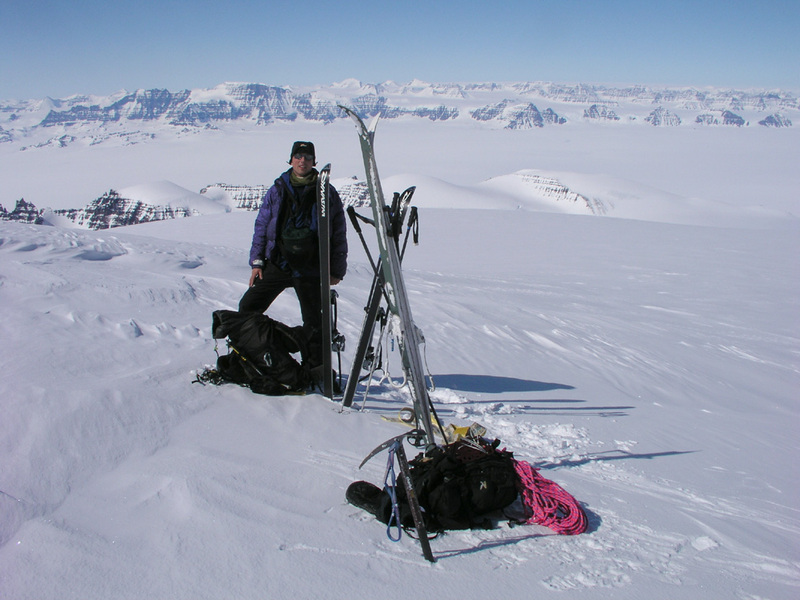 Today, Jan-Frode and I had decided to attack Snefjeld, while the rest of the team wanted to explore a smaller, rocky mountain that we call Kristine Fjeld. 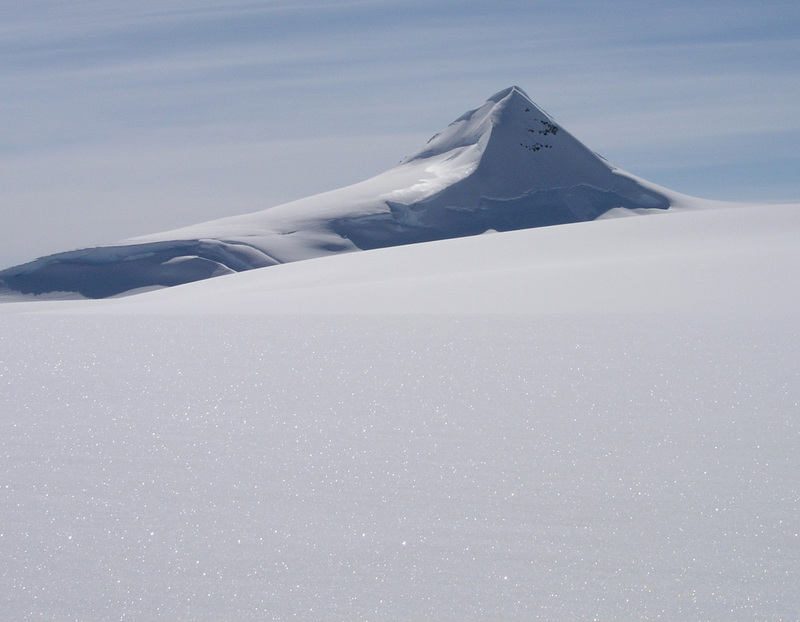 Snefjeld is a very characteristic mountain. 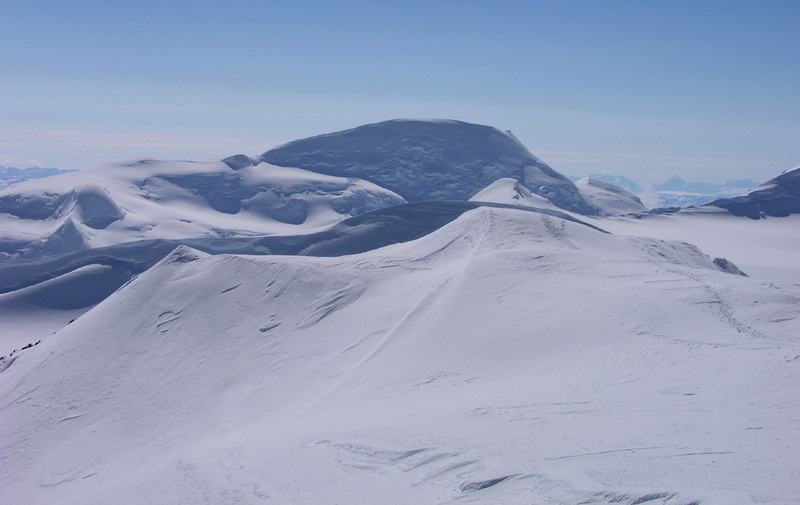 The mountain consists of a rather long, rugged ridge of rock, but in the direction of Istind, it has a very long snowridge that terminates at the very top. 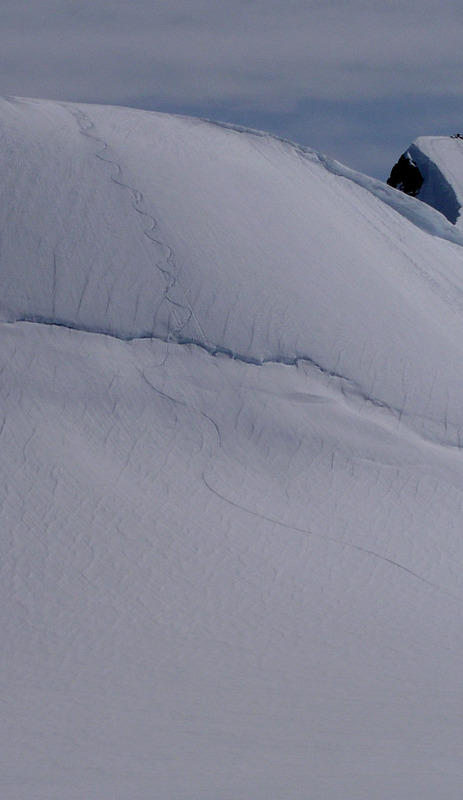 This ridge looks like a long snow ramp when seen from the side. We already decided that this would be our first choice for a summit route. The day was about as perfect as one might ask, bright blue sky, a warm sun, warm weather and absolutely no wind. We made a short stop at the foot of the ridge, elevation 2327 meter, north 68:59.557, west 029:06.312. We left the skis, put on crampons and headed upwards. The ridge was quite easy to climb initially. 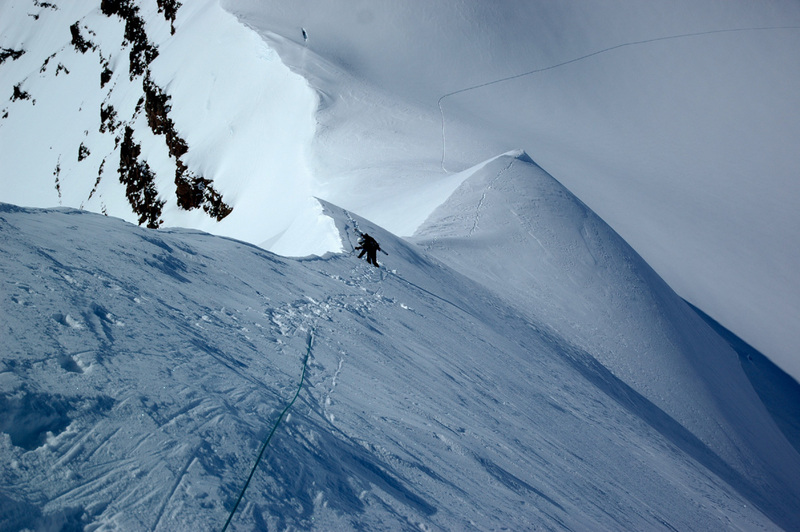 We paid attention to the sharp drop off to our left side, never too close in case of overhanging cornices. Higher up, the slope got somewhat steeper and we encountered a short section with ice. 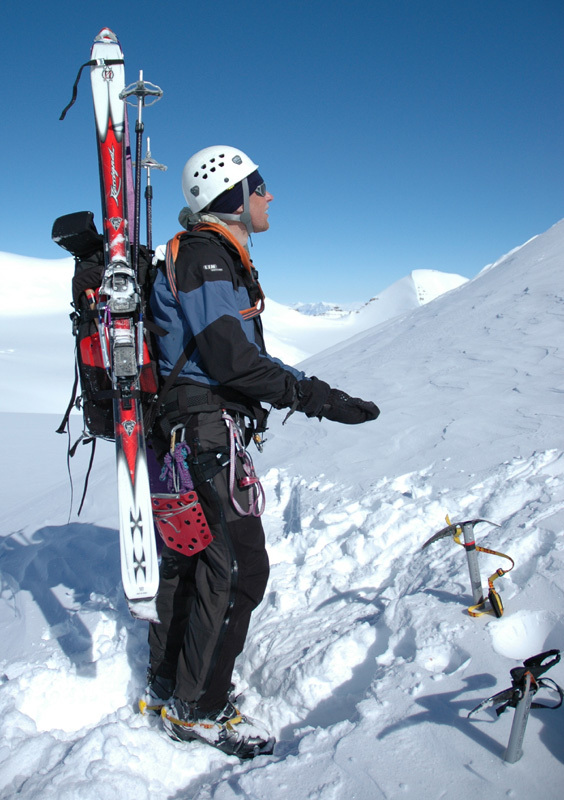 However, we never felt like using the rope and belays, careful steps and the ice axe for protection was fully adequate. 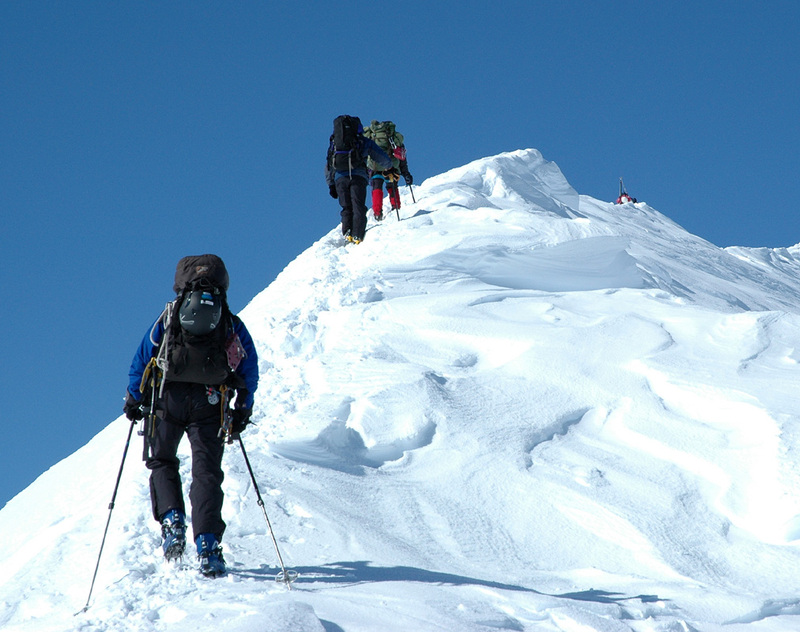 Soon, the summit was ours, quite pointed, only one man up at the highest point at a time. The mountain continued on the other side as a jagged rock ridge with what looked like pretty bad, crumbling rock. Our GPS gave an elevation of 2648 meter, north 68:59.899, west 029:06.459, the map gives 2650 meter. We descended in our footsteps and came back down to our skis. 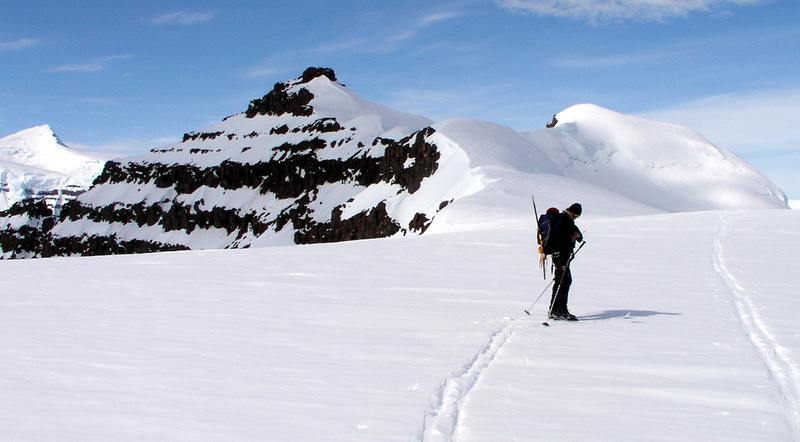 A short ski around to the saddle between Snefjeld and Kristine Fjeld. 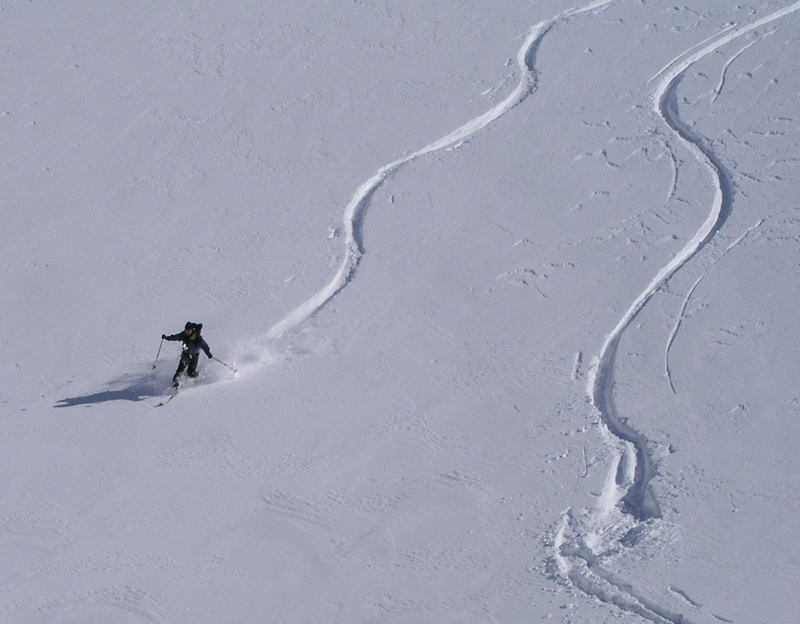 We saw the tracks from the other four and soon left our skis at the ridge. A short, but nice hike on foot with some easy scrambling at the end and we were on the highest point of the ridge. From here, a good view back to the much higher Snefjeld. What a splendid day this was. 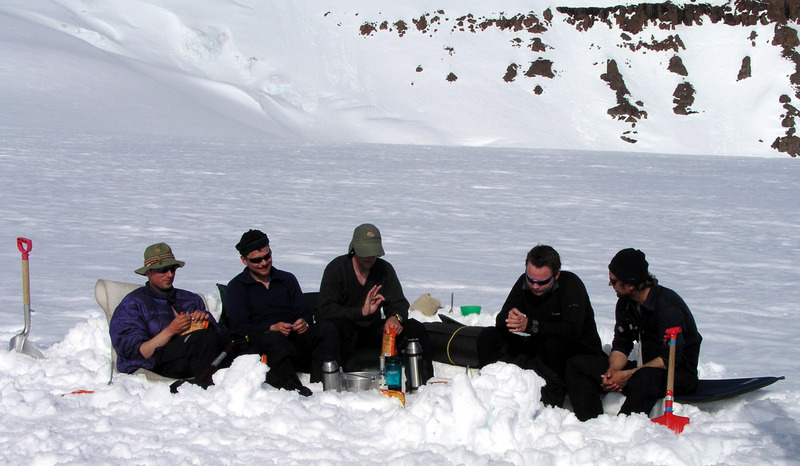 We descended and skied back to camp where we met the others. 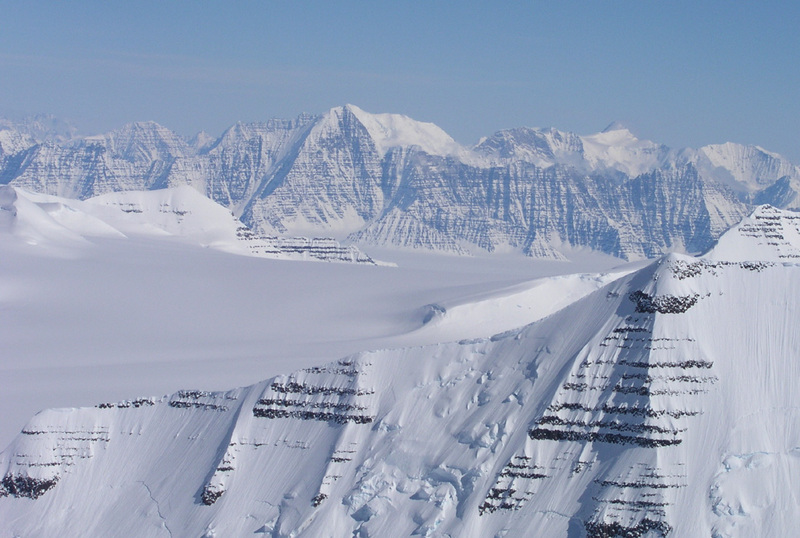 They had crossed over the glacier and climbed a small peak they named Rabben. 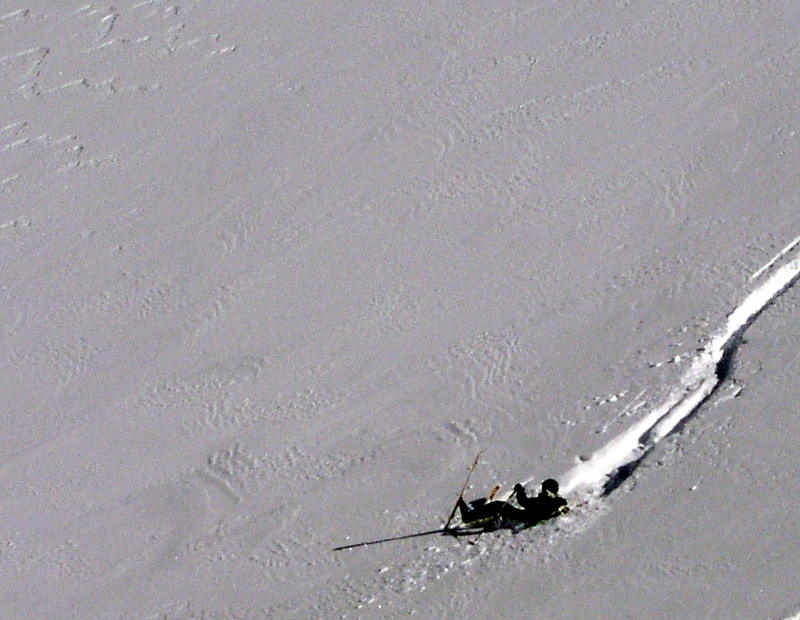 Per Ove had skied down a pretty steep slope. Our last full day is here. The weather is still very nice and the temperature mild. We have a few degrees below freezing at night, then nice warm days. Per Ove and Jan-Frode start early, they will make a second and last attempt on Istind. We spotted a possible alternative route already the first day, today will show if this indeed is the key to success. Torstein has been bothered by pain in the neck, the day seems perfect for a well deserved rest. Arnt and I set out slightly downhill in order to explore a smaller, but somewhat steep mountain that we had christened Skorsteinseggi. The name means ridge with a chimmney, a very characteristic rock feature somewhat on our side of the highest snow ridge. The snow facing us looked pretty steep, but doable. Thus, we carried snow anchors, ice screws and rope. 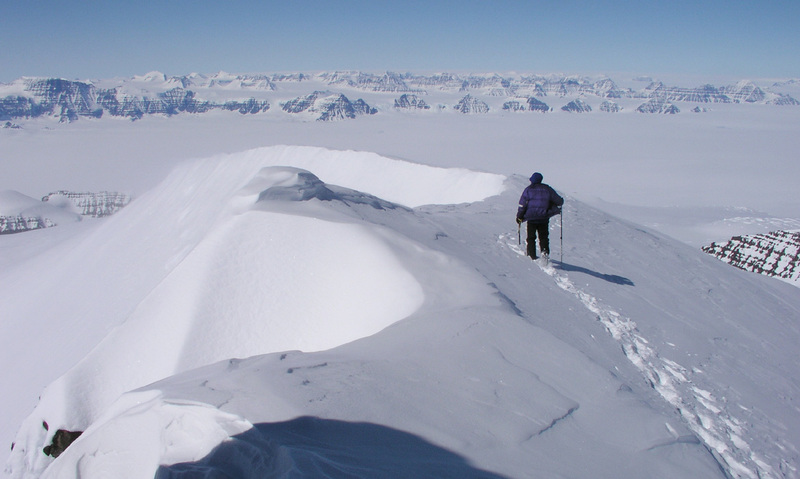 However, as soon as we arrived below the face, Arnt went ahead to explore the far ridge that could not really be judged from our camp. 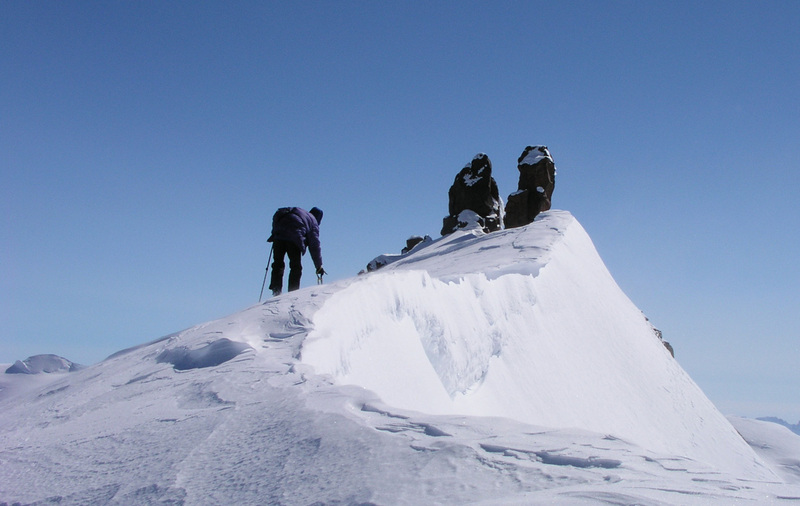 It soon turned out that this ridge provided a nontechnical summit route. 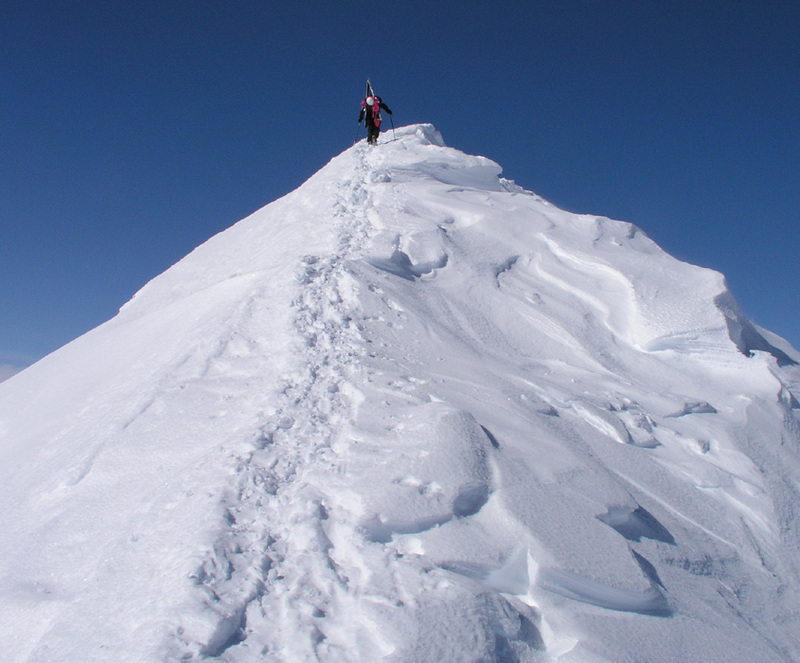 I followed Arnt and after a short stretch of careful (snow) ridge walk, I could join him at the summit. A good viewpoint indeed, we could see all of Bergen Gletcher and the peaks that had kept us busy in the last several days. The ridge across to the chimmney did not look inviting, looking further, Istind where Jan-Frode and Per Ove hopefully succeed. 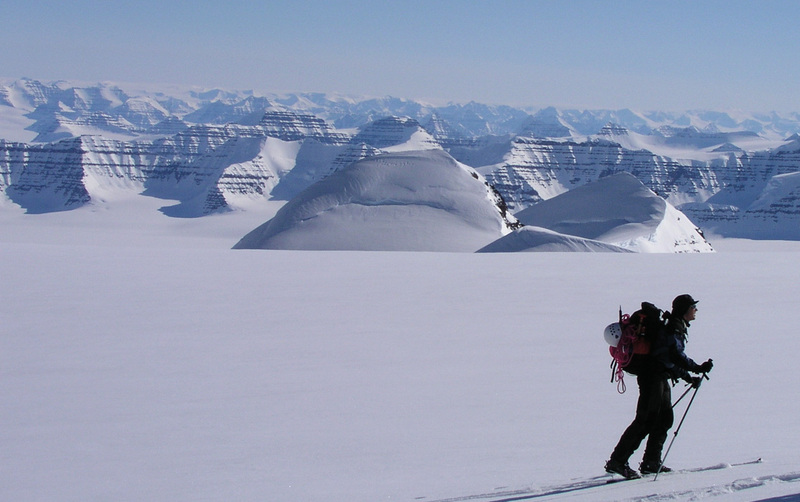 As we descended, we saw Torstein heading our way. Clearly, he had observed us from camp and decided to bag the peak when he realized that it required minimal effort. As Arnt returned to camp, I decided to sweep Rabben before calling it a day. I skied there rather quickly while looking at the trace from Per Ove's Telemark ski descent yesterday. The tracks from yesterday showed two routes up the steeper upper part. Numerous tracks went left and up in between some rocks. 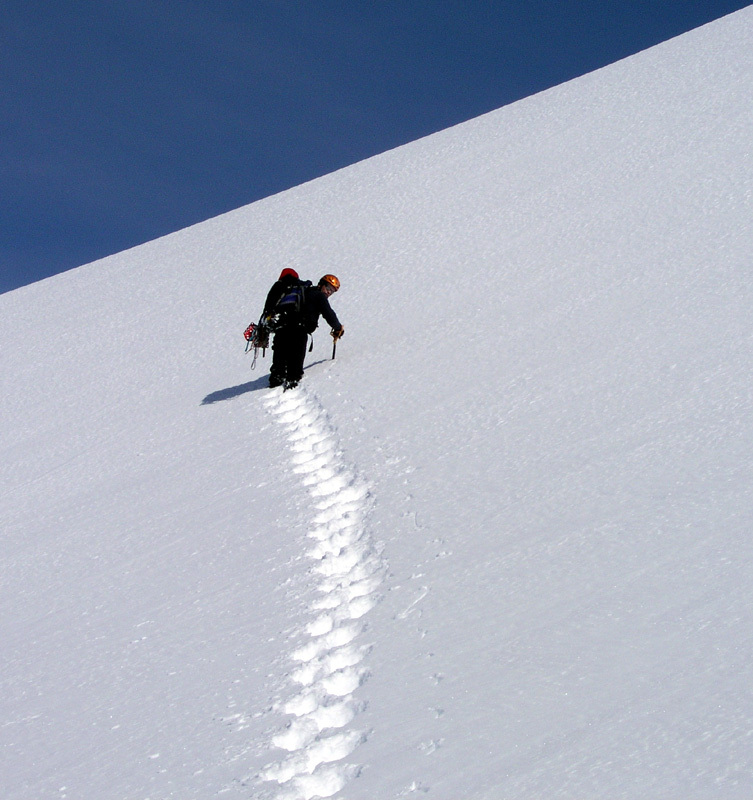 What looked like a single track had front pointing steps kicked straight up a pretty steep snow slope. I kicked steps the same way, an interesting slope getting steeper the higher you got. From the summit of Rabben, I looked towards Istind to see if Jan-Frode and Per Ove had succeeded, however I did not see them. 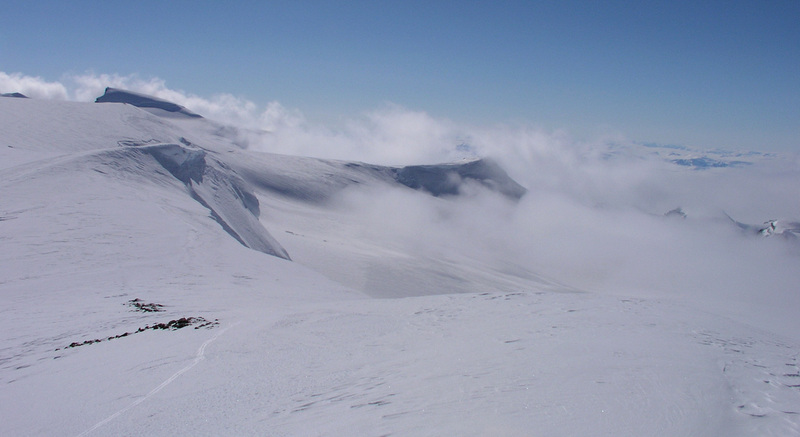 Upon my return to camp, Ståle could tell the good news that the boys had been seen on the summit of Istind. Thus, this last day is crowned with sweet success. We have climbed the summits we wanted and tomorrow is going home day. 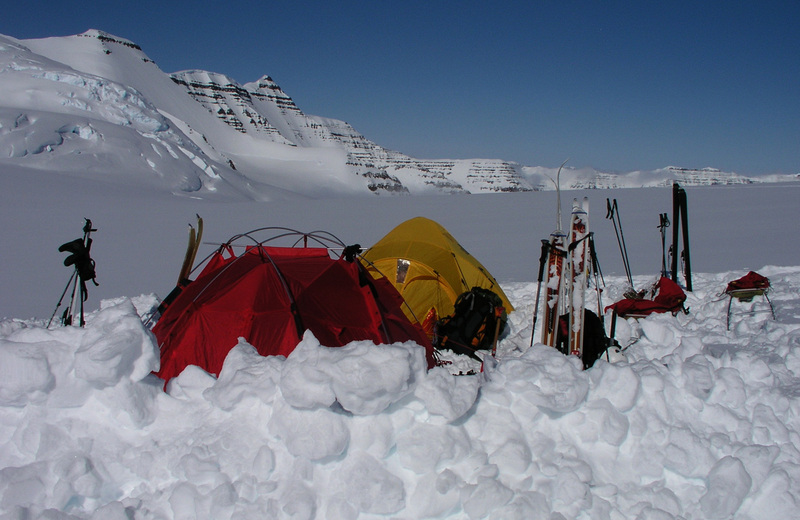 After Jan-Frode and Per Ove had returned and told us their story, we started breaking camp in order to move camp down to the agreed pickup point. This move turned out to be just as easy as we had hoped. A smooth glide on a gentle downhill. 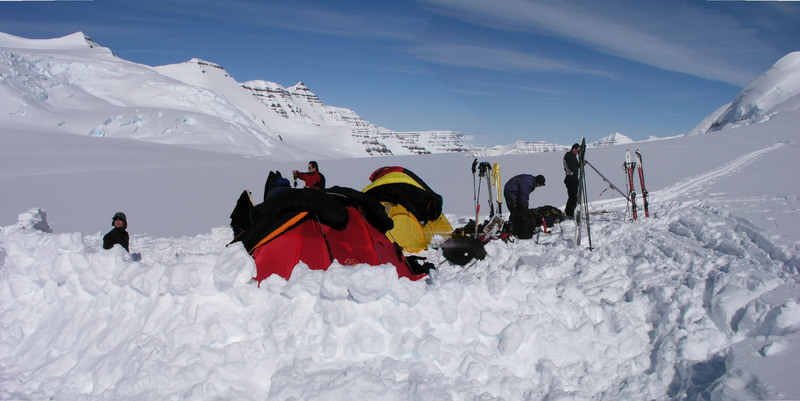 Without much effort we arrived at the lower glacier and established our last camp. The weather was now warm as summer. We decided to make the long awaited pancakes. Not a very practical dish for arctic Greenland, it took quite long to complete each pancake, thus almost infinite time before it was your time again. The landscape here is also very nice. In particular, a long unbroken ridge that runs down right across for us, caught everbodys attention and imagination. Arnt kept looking at the last peak above us, we skied right by it when we moved camp down to here. It was clear that he wanted yet another peak. It looked like a fairly simple trip and he was given thumbs up to go while we kept waiting for more pancakes to be produced. When Arnt returned from a successful trip, we were still making pancakes. No problem to sit outdoors any longer, almost unbelievable how much warmer this last week has been. Woke up by the sun warming the tent at 0800. Perfect weather and the summer in Greenland carries on. I called Fridrik and reported excellent weather. He said we could expect the Twin Otter around 1300. The snow has a good crust after a few degrees below zero last night, but with this kind of sunshine, the crust will be gone in a few hours. We have climbed 18 peaks altogether, not at all bad in 16 days. 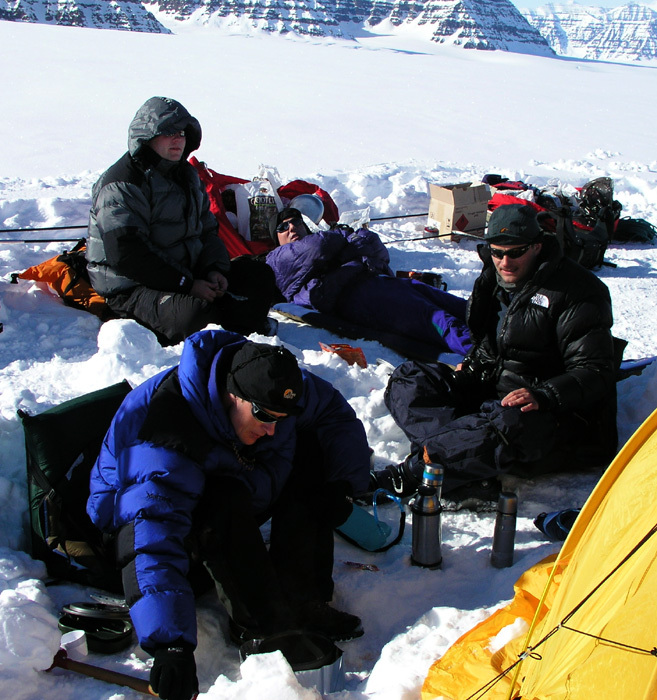 The team was generally sitting around in the sun, what about a little extra tan this last day in Greenland? A last opportunity to experience just this landscape. Clearly, anticipation - would the Twin Otter arrive without problems? Just on time a weak sound, then the blinking reflex from sunrays hitting the wings. The Twin Otter flew straight overhead, I had made a long track next to our camp as an indication of a possible landing area. The Twin Otter banked left, flew between us and the peaks across the valley, how tiny it looks in this setting! Completing the turn, the airplane is now coming straight up the glacier, touching down more or less precisely along my skitrack. Turning around, then stopping just a few meter from our camp. What a luxury, no need to even go to the airport, here the plane comes to you. We loaded everything onboard, got into our seats and then with engines roaring we left Greenland much in the same way as we arrived 16 days ago. 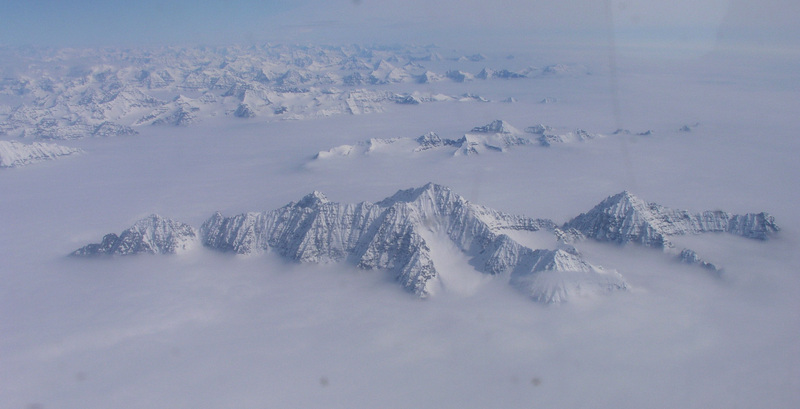 The flight started with new, great views of the peaks east of PEV. The cliffs on this side looks very bad indeed. However, at least a few peaks have relatively easy access from the opposite (west) side. On the left side, Ejnar Mikkelsens Fjeld, very impressive and only climbed a couple of times. Soon, Greenland was behind us and Iceland ahead. We landed in Isafjordur, then connected in a somewhat more orderly fashion with the domestic flight to Reykjavik. On arrival there, one bag was missing. Soon, it was arranged that this bag be transferred to the Keflavik airport where our flight to Denmark would depart the next day. We found our pre-booked hotel in Reykjavik and everybody enjoyed a good, long shower before we went out to explore downtown Reykjavik and have an official farewell dinner/celebration. The dinner was good, the beer tasted well and a very successful evening came to a conclusion with Arnt ordering a round of Margarithas, OUCH !, the salted rims still hurt our cracked lips. We checked out and took a bus to The Blue Lagoon. This is on the way to Keflavik and therefore not a big detour. This place is quite well known, a large lake with hot water from the many underground reservoirs. We relaxed and enjoyed the warm water. Torstein had a dose of massage that hopefully helped his neck and back. Another short ride by bus and we were at Keflavik ready to fly home. One last obstacle, the woman behind the check-in counter was definitely NOT in her best mood and insisted that we pay overweight charges for not just a few, but closer to 100 kg. This would definitely kill our budget and a pretty long argument followed. 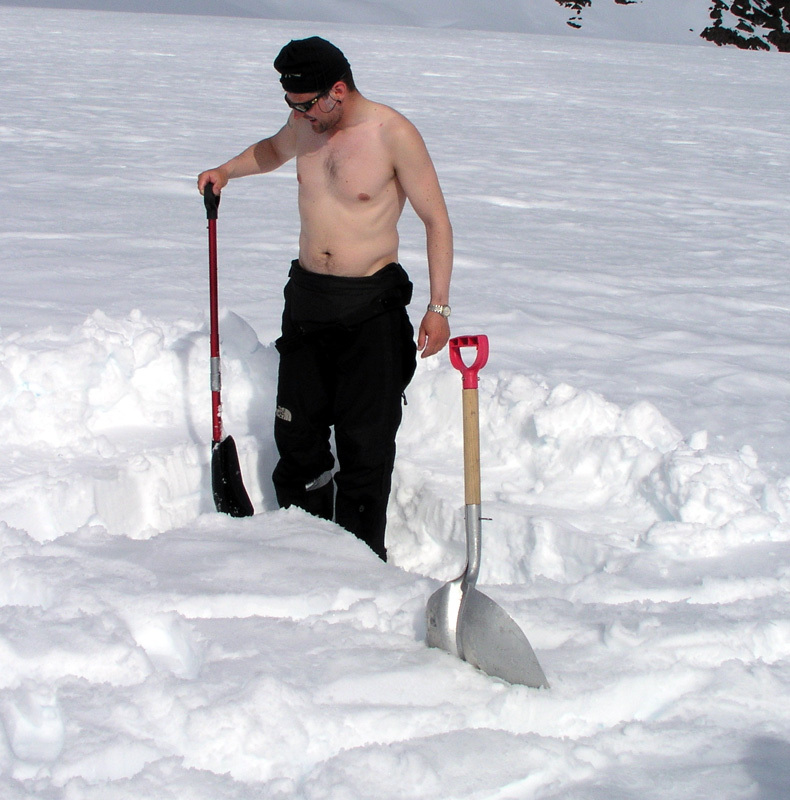 I eventually called Fridrik and asked if he could help explain the situation. He talked and the situation got resolved. All our cargo got checked in as regular baggage. We are all extremely thankful to Fridrik. Obviously, he really did not have to help with this and in fact, he had no official authority to help either. With warm feelings for his help we boarded the plane and had a good flight to Copenhagen with a problem free connection to Bergen. Arriving pretty late in Bergen, but with a warm welcome by wifes and girlfriends. 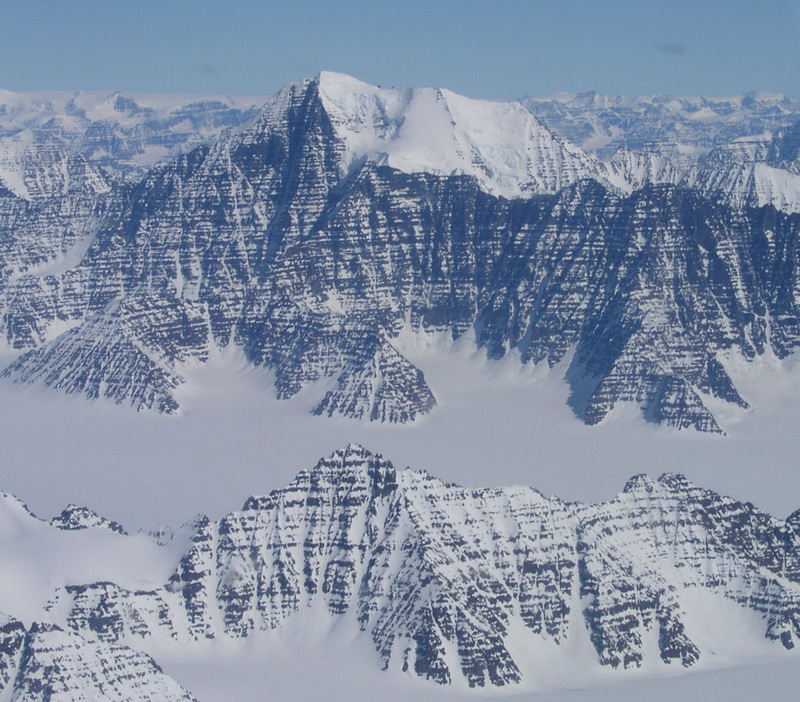 Our G4 expedition to East Greenland had come to an end. It was a huge success by any measure. All objectives achieved, no injuries or other losses. All 6 had a very nice trip with lasting memories. I certainly was concerned that there would be some more serious problems and that the pretty expensive trip somehow should fail to deliver lasting value to the participants. I am genuinely thankful to Jan-Frode, Torstein, Per Ove, Ståle and Arnt for each and every contribution, small and large, that made this a trip of a lifetime. The sharp horizons, the white powder snow, the blue skies, the fantasy landscape, the crisp cold and the positive contributions from everyone all blended together to make our G4 an expedition that cannot possibly be repeated.